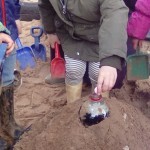 Using biodegradable glitter and using as little plastic (and recycling the rest) has been part of eco policy for a while now, but as well as the adults enforcing such measures to try and rescue our planet from pollution Vicki wanted to show the children how by being green with our litter we can alleviate the destruction of our sea life. 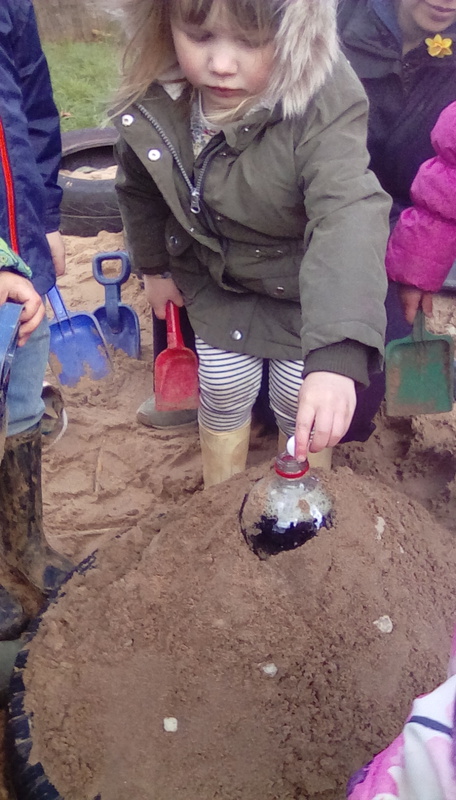 The children were able to identify items that should and should not be at the beach so they know what not to leave behind on their visits. 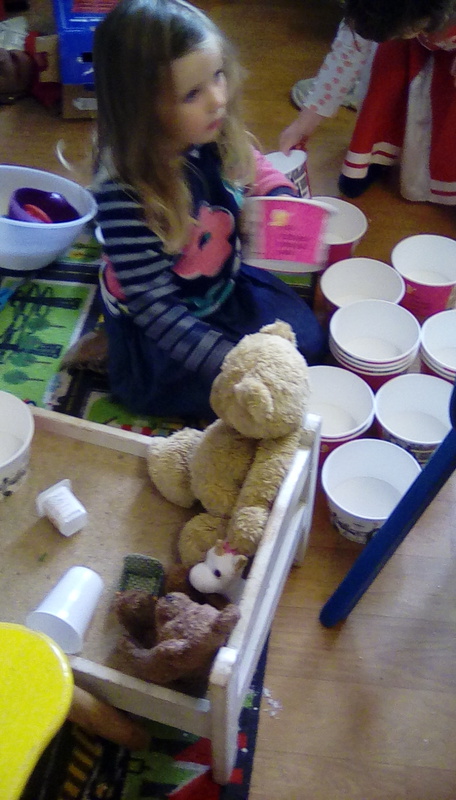 We also actively encourage the children to use the correct bins for litter: recycling as much as possible. 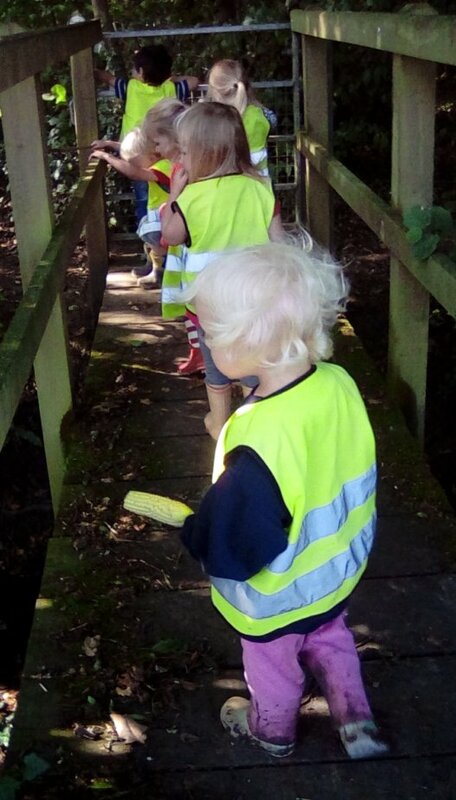 Their awareness is apparent when taking a walk and the children talking about how dropping plastic litter can get an animal caught and how we should always put it in the bin. 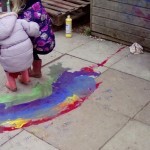 These are the people who have to live in this planet of the future after all! 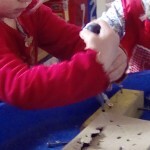 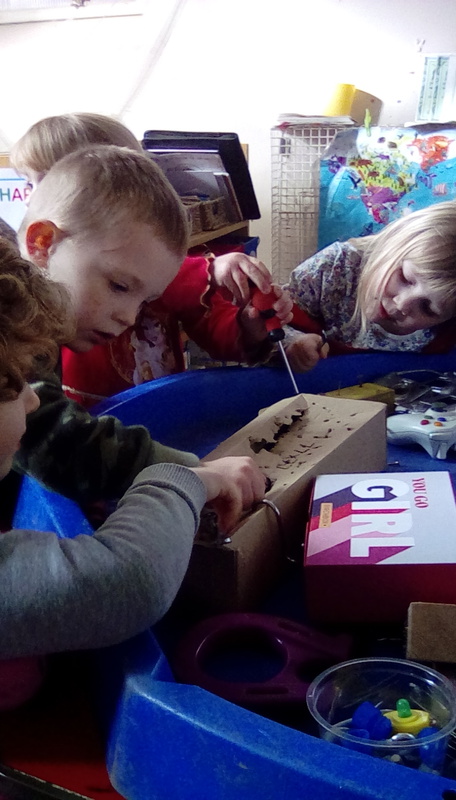 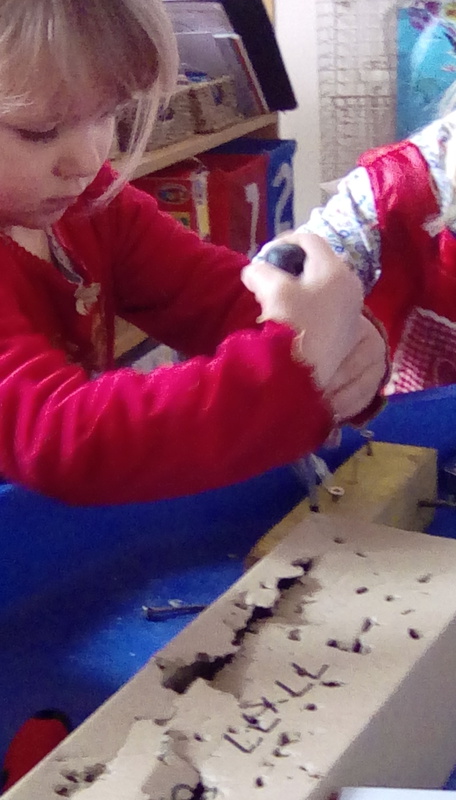 Not only have the children been enjoying exploring tools at the “fiddle station” (see below) but they also have been active in using real tools alongside adults in creating something from their own ideas. 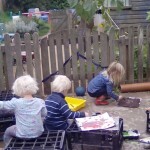 Out in the garden Vicki has been resourceful with some old pallets in creating a car wash for the garage and some avid DIYers were keen to help build it too. 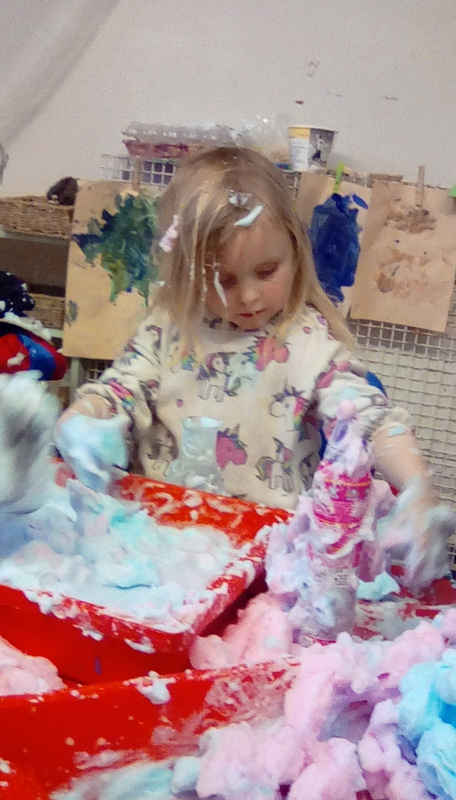 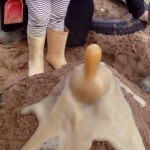 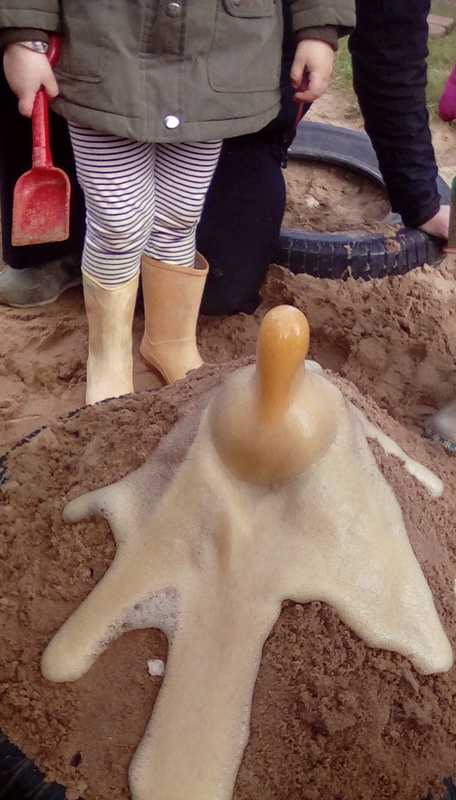 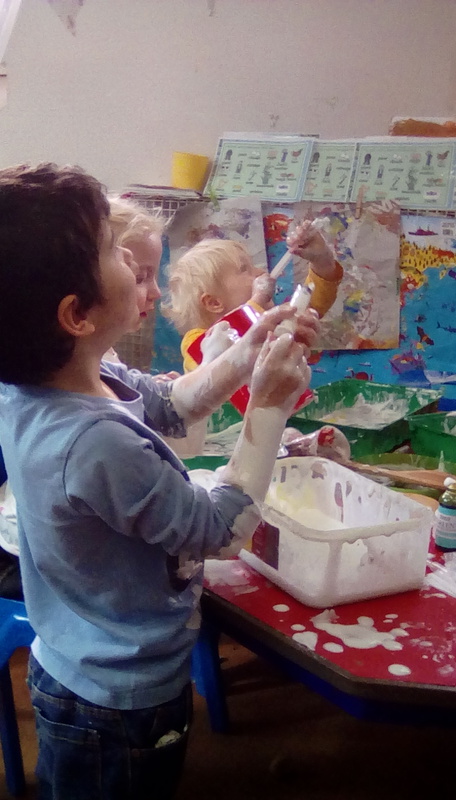 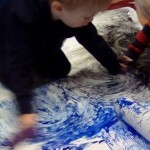 The joy of making something happen never fails to delight pre school children and what could be better than making a volcano erupt! 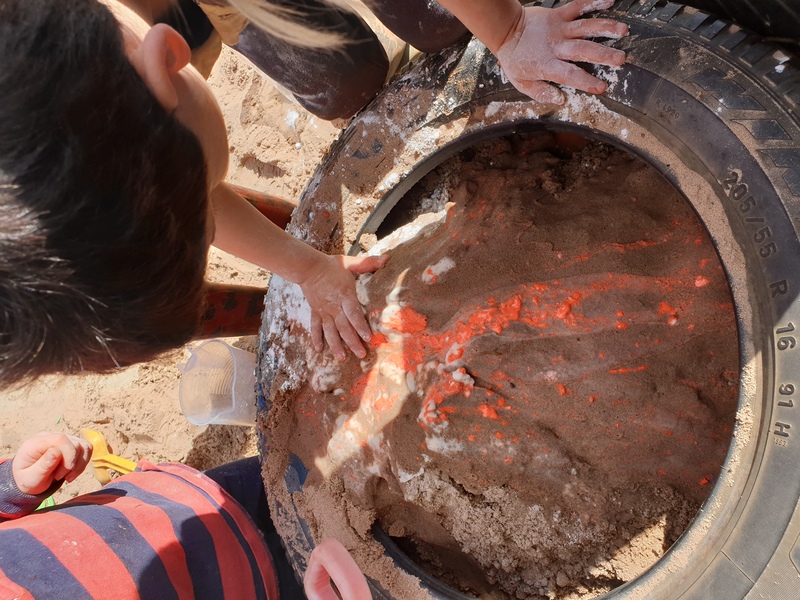 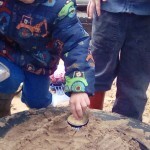 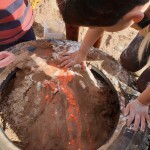 In the sandpit the children had been busy building their sand volcanoes and so we thought it would be fun to not only follow one child’s suggestion to add red painty lava, but to source ingredients to actually make the explosion ourselves. 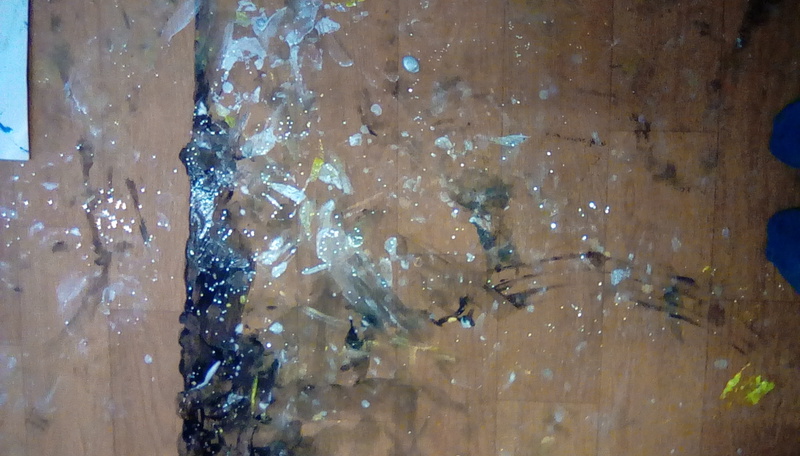 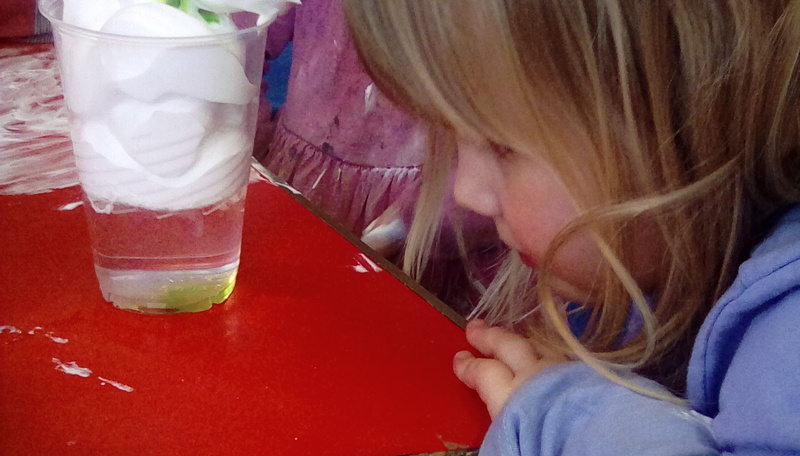 And so with the classic reaction of bicarbonate of soda and vinegar we did just that. 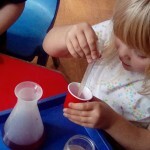 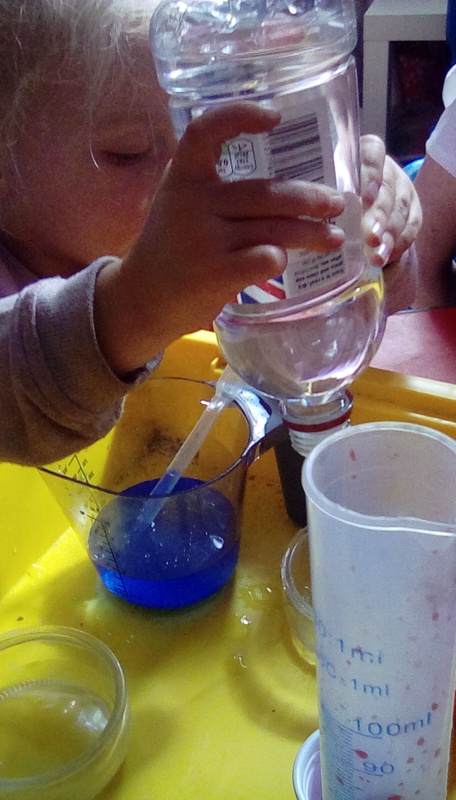 Following on from their idea we then explored other ways of mixing different substances to cause chemical reactions and the children all became scientists finding ways of making their own potions in the garden. 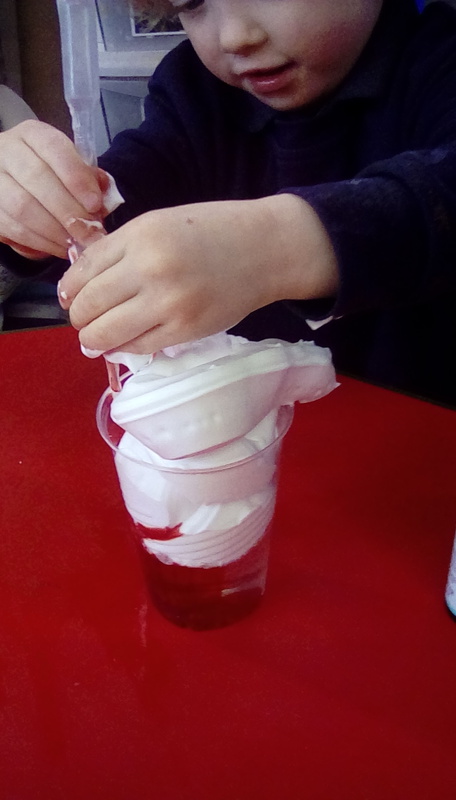 With a little suggestion from an adult we then created further volcanic eruption by adding mint sweets to some fizzy drinks. 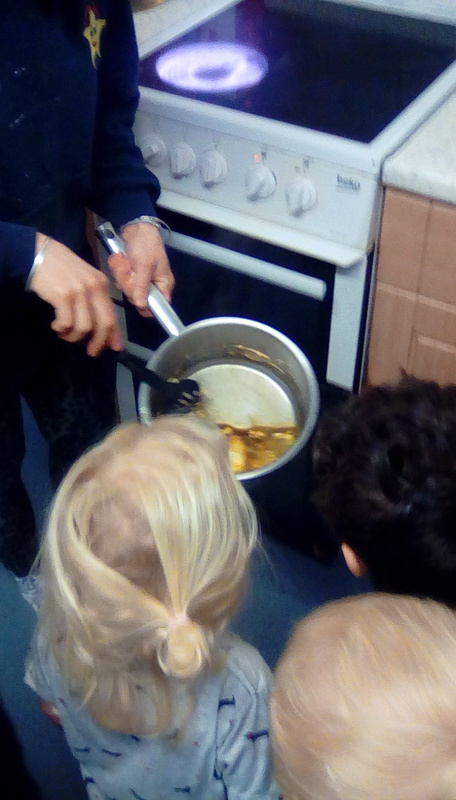 This lava was rather tasty! 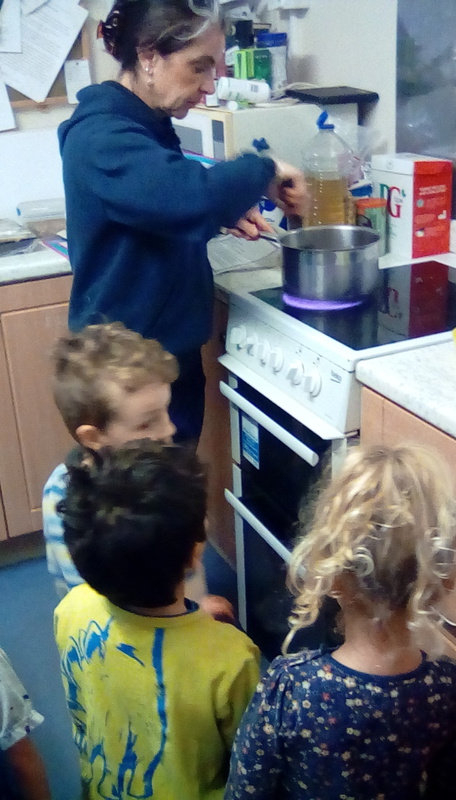 STEAM in everything we do! 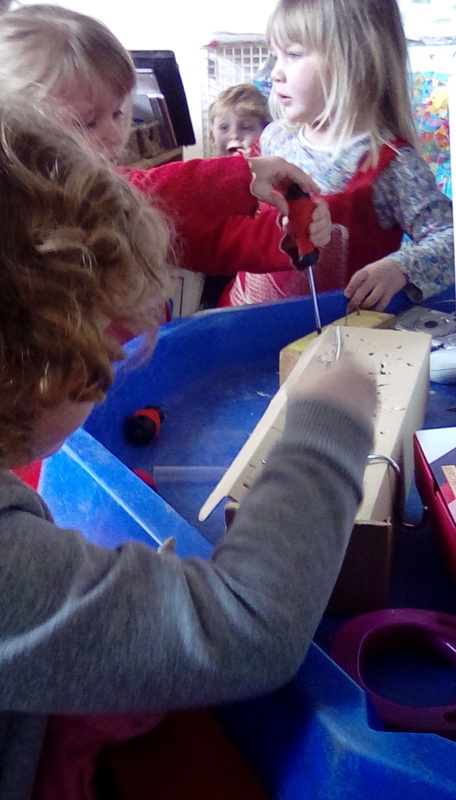 At last weekend’s conference, led by the ‘Firm Foundations’ organisation, one of the workshops that I went to was about the STEAM project. 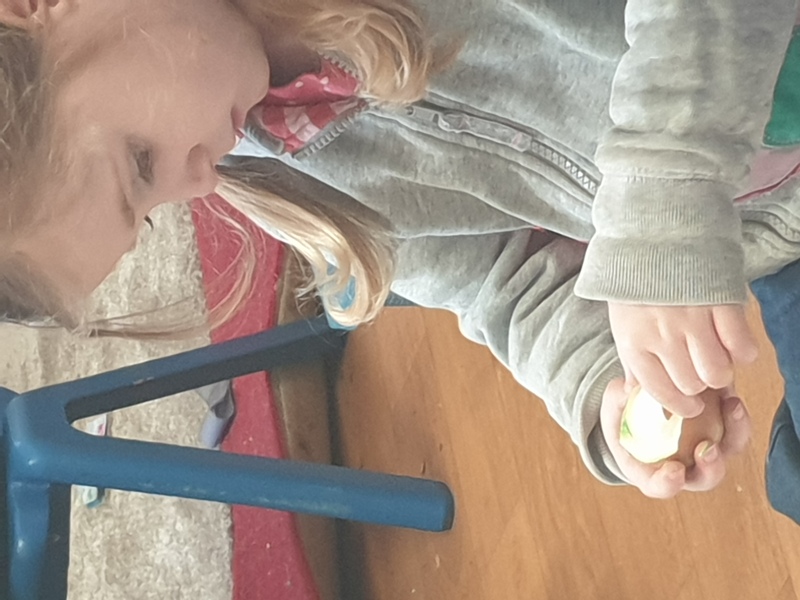 This is an education outlook that seeks to bring science, technology, engineering, the arts and maths into the children’s learning in a cross curricular way, to engage, inspire and motivate children to question, to be problem solvers, to be the people that makes changes for the future. 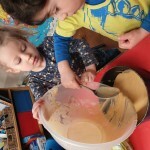 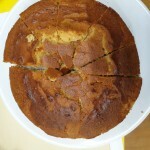 STEAM in phonics: Making honey cake for ‘h’ allowed us to encounter shape and the natural world by thinking about where honey comes from (the hexagons of honeycomb), changes of state as the butter and honey melted as well as baking the cake and how we can make changes through exertion of force (mixing)…although the children thought we were just baking a yummy cake! 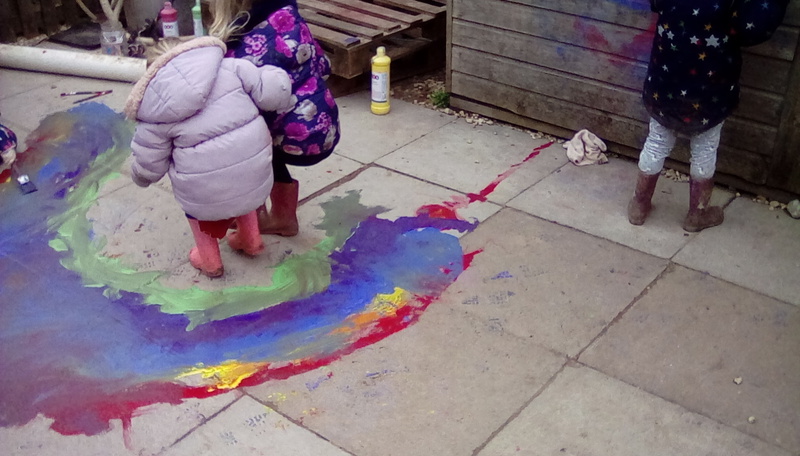 For ‘r’ we made rain and thought about the water cycle. 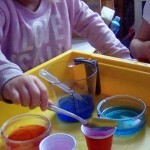 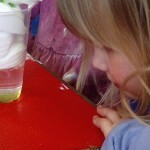 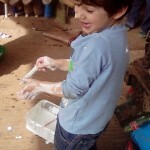 Whilst the experiment of adding food colouring with pipettes through a “cloud” of shaving foam provided a visual and hands on way of exploring how rain comes through a cloud, the true discoveries and science were provided when they were allowed to freely explore the materials themselves and using a syringe became a trajectory lesson: seeing how far we could make the soapy mixture squirt (we continued this experiment outside). 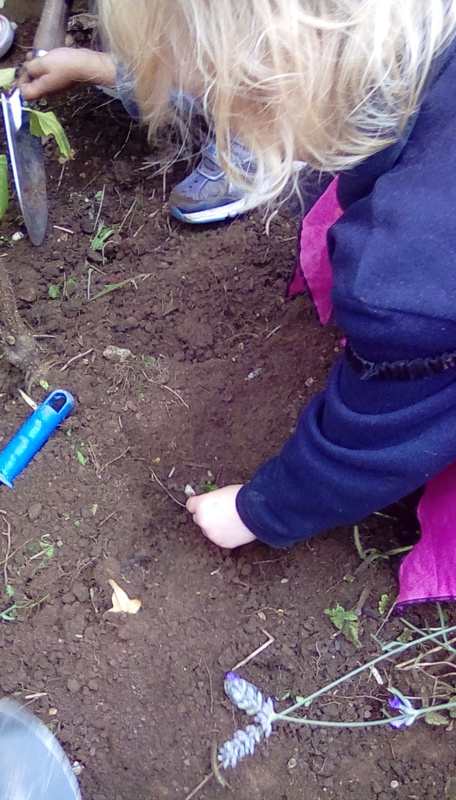 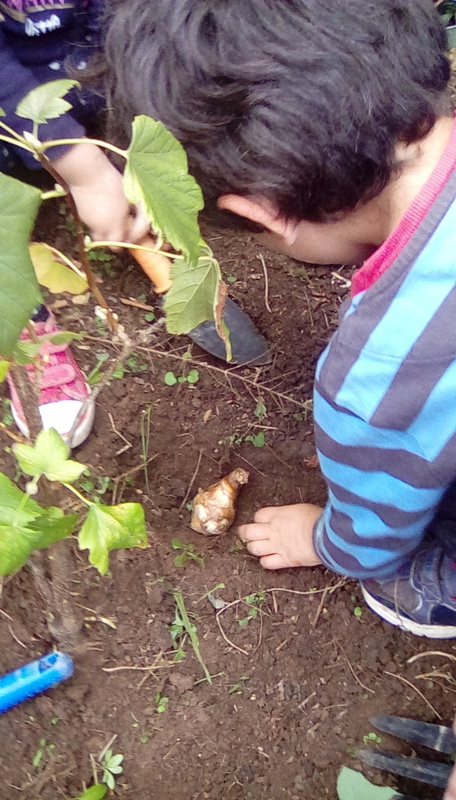 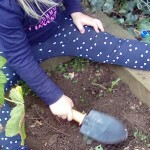 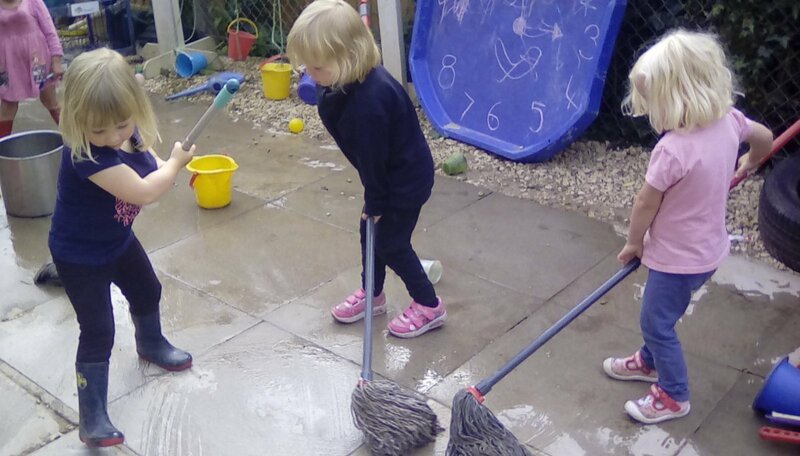 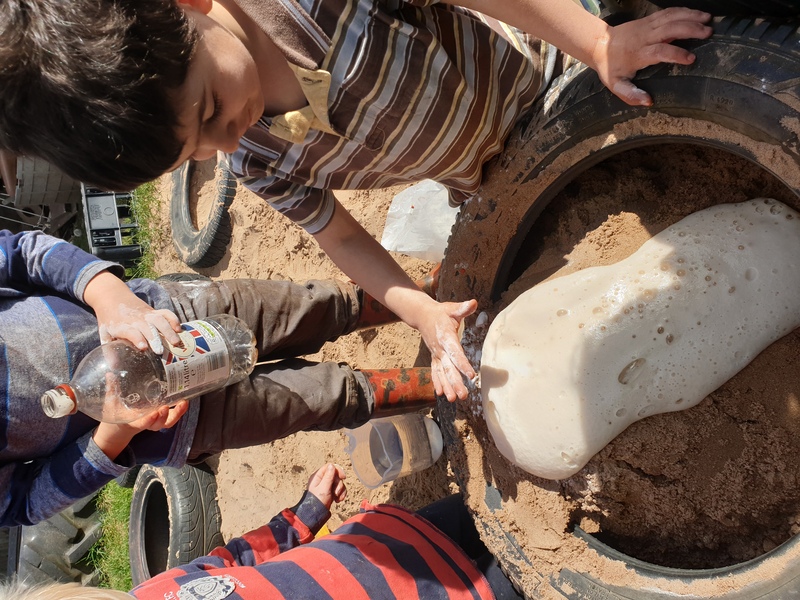 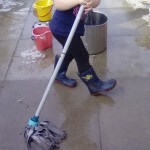 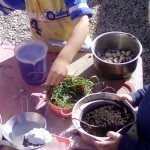 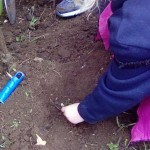 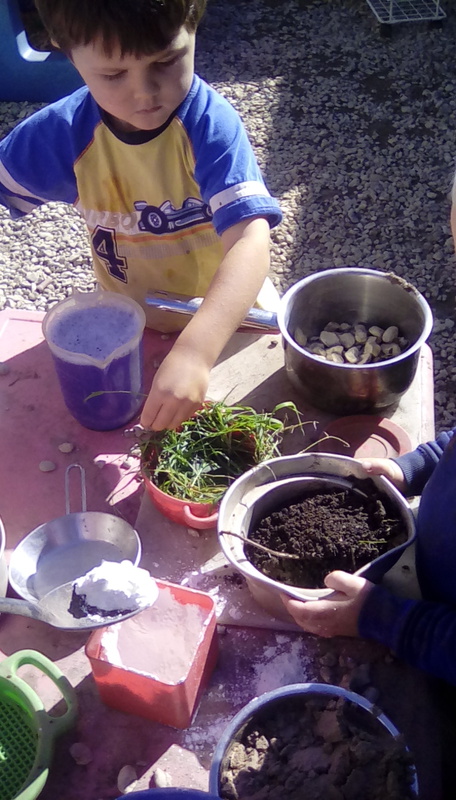 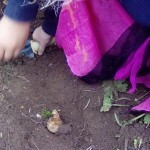 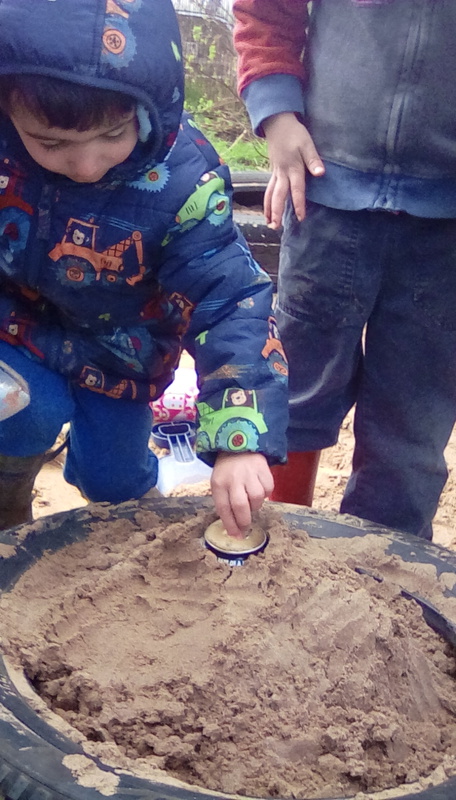 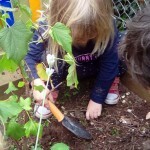 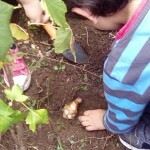 We used the terms of “science” and what is so satisfying is then over hearing the children later on in the garden say to each other “let’s be scientists” as they conduct their own explorations with the materials they find: rocks, wood, sand, soil, water. 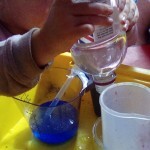 This is true learning, something no worksheet can provide and this is fun! 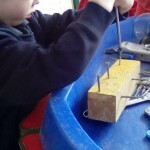 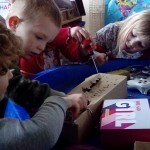 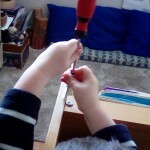 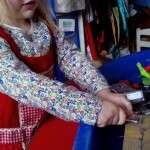 Spurred on by some budding engineers and a love for making things, and for making things “real”, one idea that I did bring back and go with at nursery was a “fiddle table” where children are allowed access to a range of real tools and various things they can “fiddle with”: screwing into boxes, trying to take apart old electrical items, hammering in nails or exploring magnets. 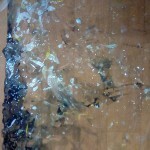 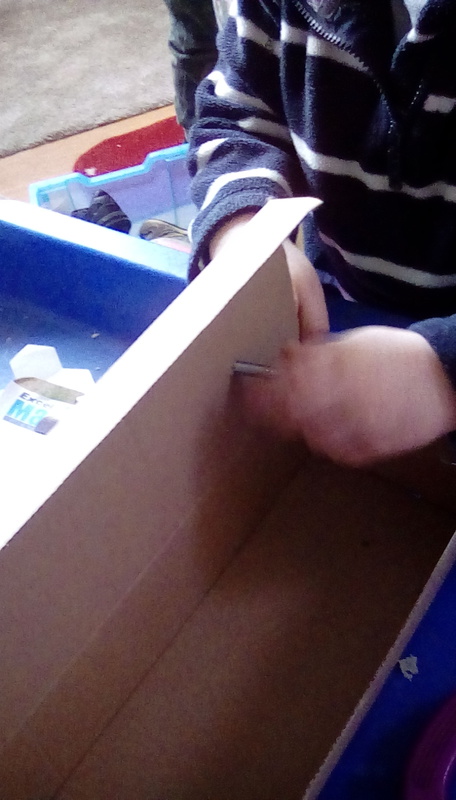 The satisfaction is so much greater than “just pretending” with a plastic saw! 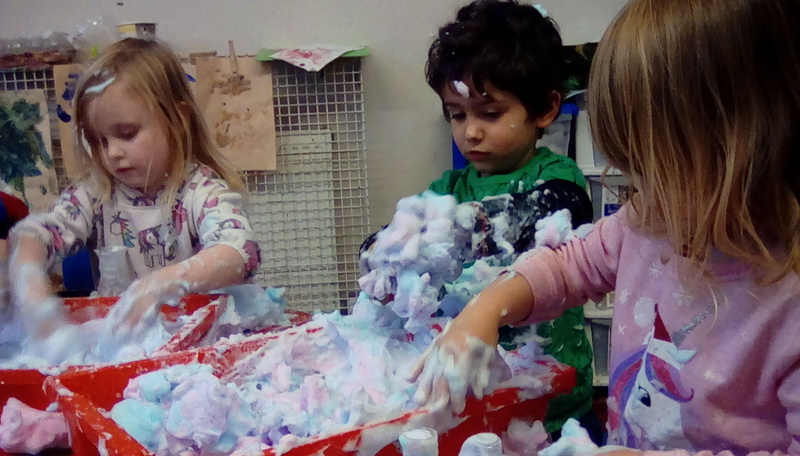 It is in so many of our daily routines that we find examples of STEAM. 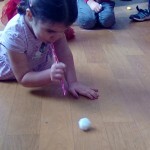 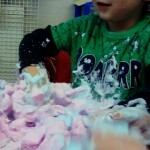 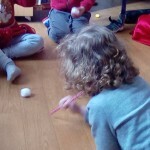 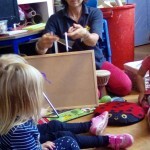 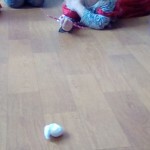 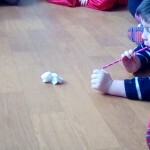 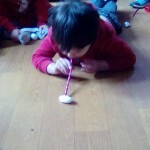 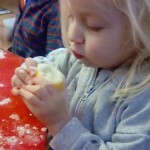 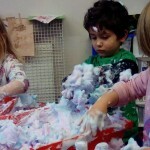 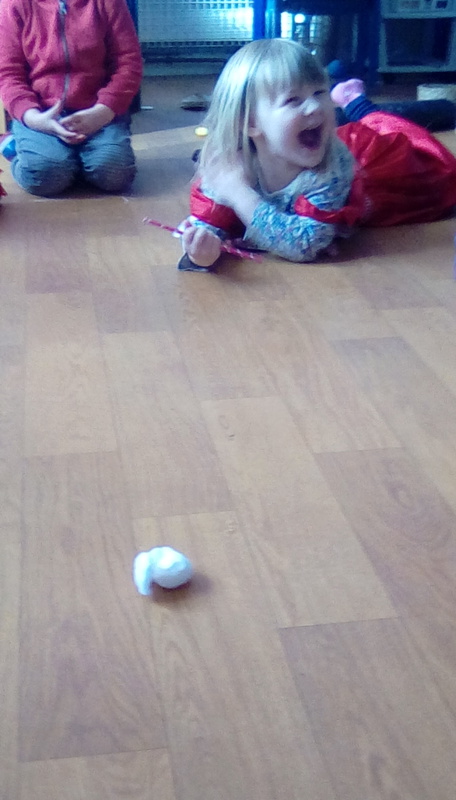 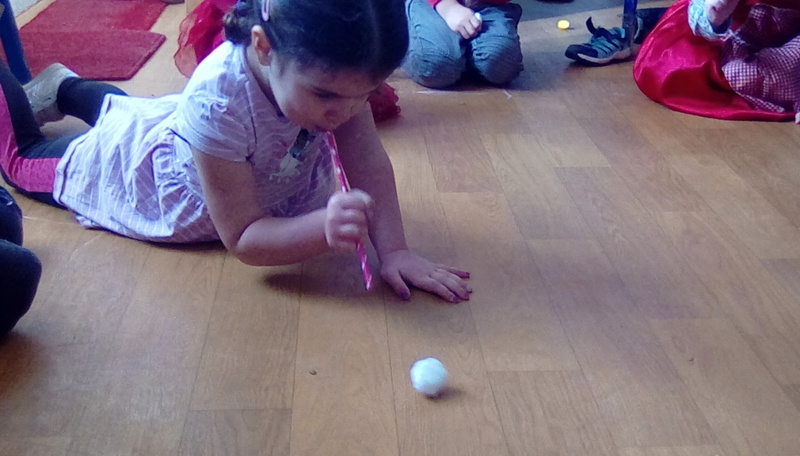 We use many strategies and games from the ‘sunshine circles’ repertoire in our morning timetable session and the game of blowing cotton wool balls to each other provided an opportunity to think about force of breath, technique (finding they could get the balls of cotton to go faster and with more control if they went down on their tummy), distance, speed. 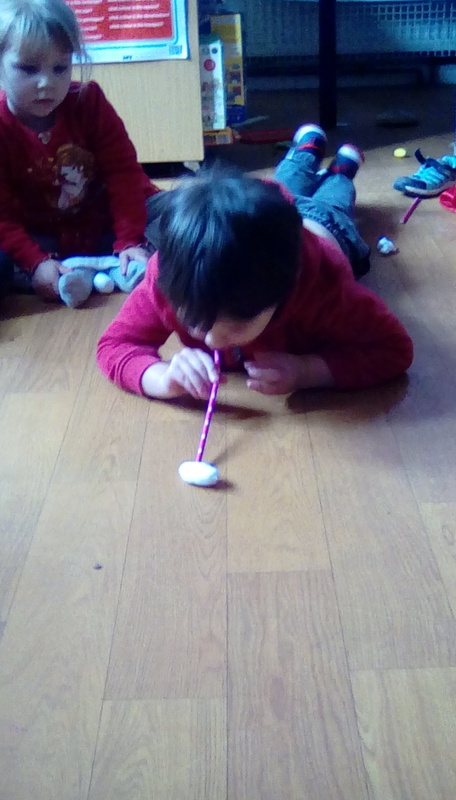 They also experimented with using straws or just their breath and then ended the session by using the balls to add some nurture to the session, smoothing each other’s hands. 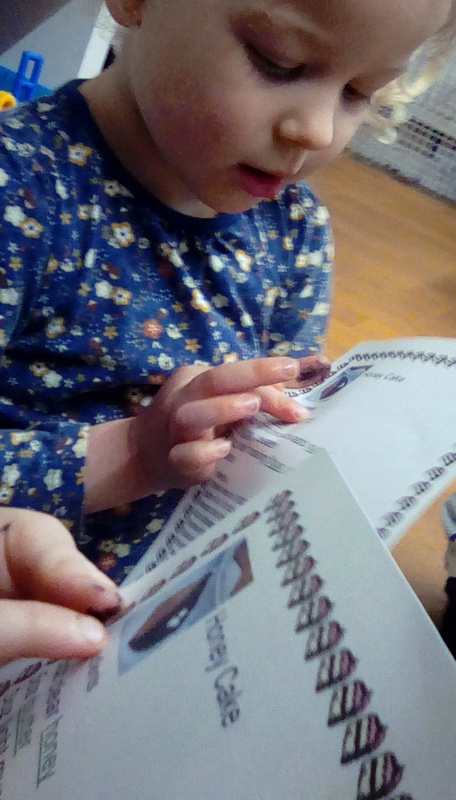 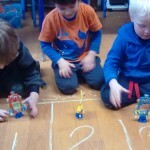 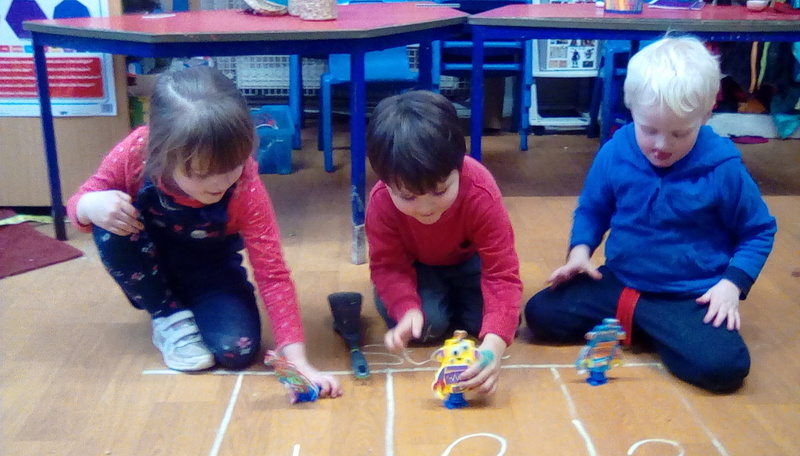 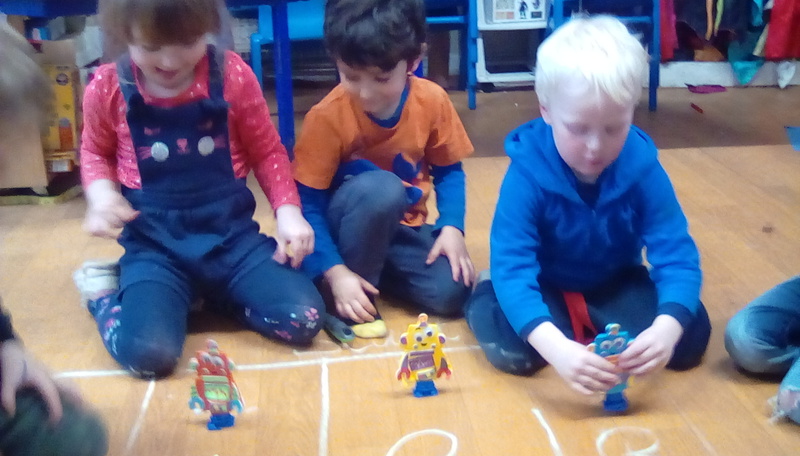 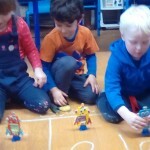 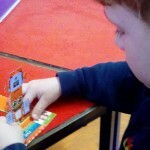 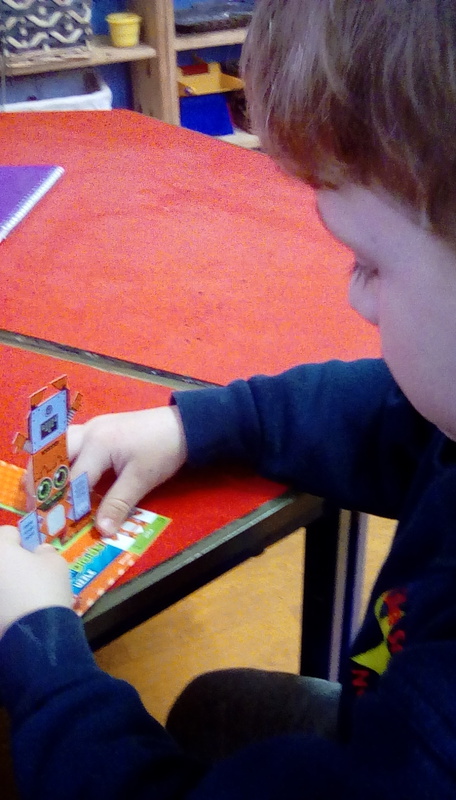 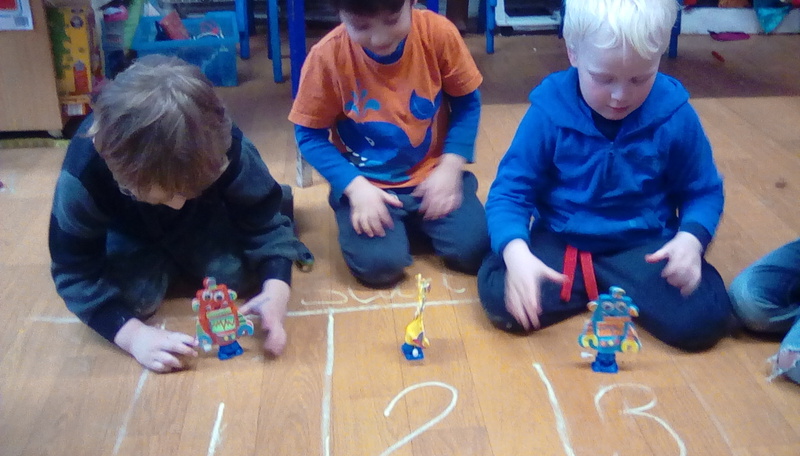 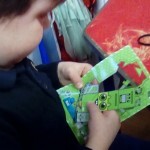 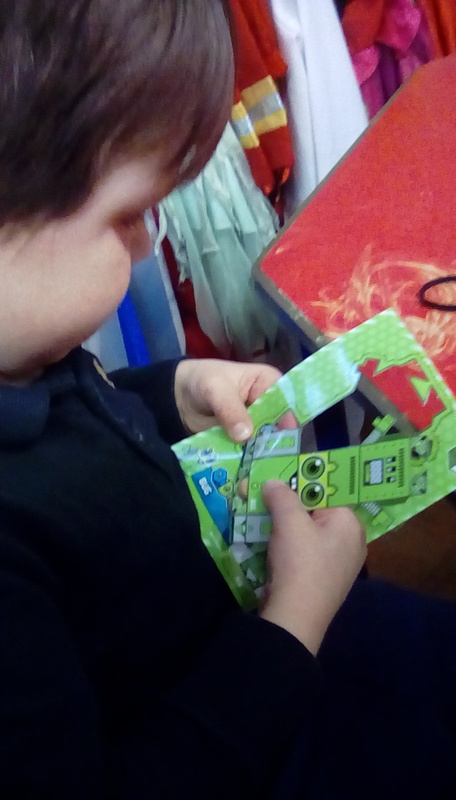 Elsewhere, following the children’s interests in robots, they followed detailed instructions as to how to make their own wind up robots to race. 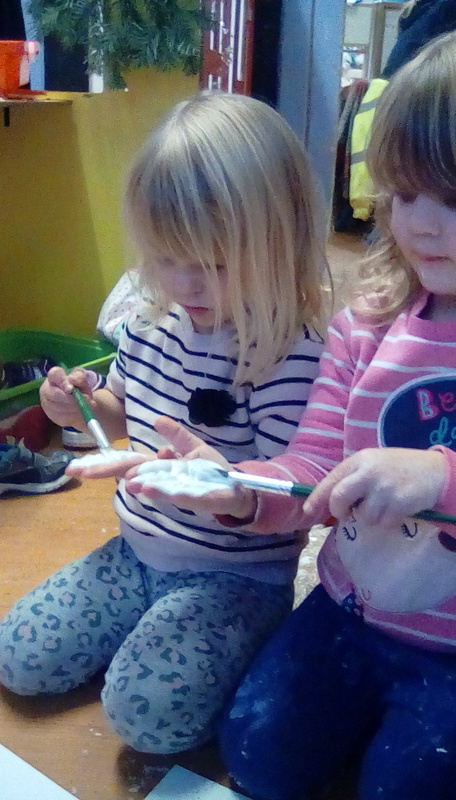 Vicki introduced the children to the concept of static electricity this week as they made their own electricity from balloons that made their hair stand on end! 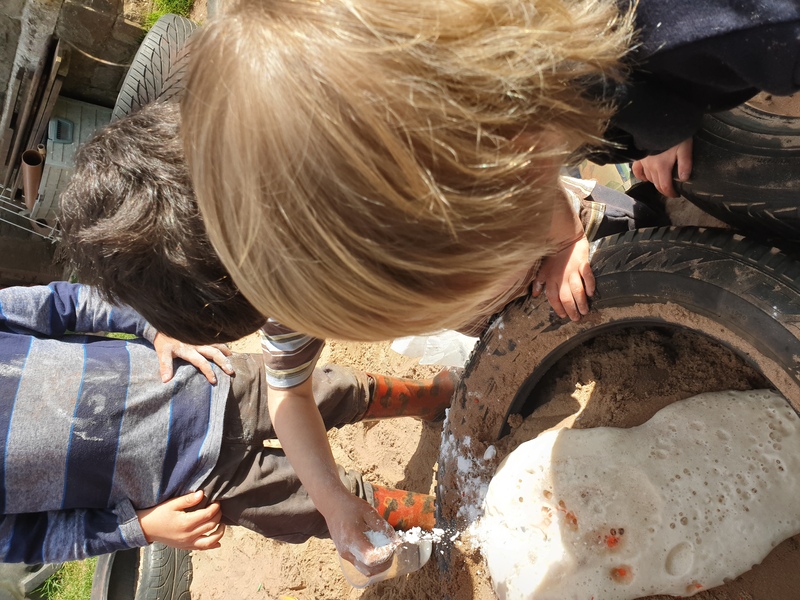 Being able to get involved in such problem solving and investigation is such an effective way to allow questioning, active learning, making links…all elements of the characteristics of effective learning. 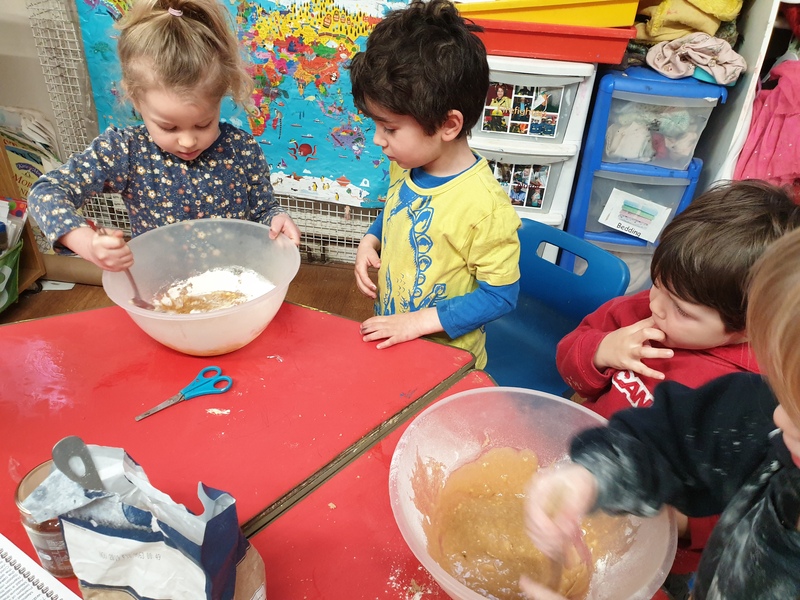 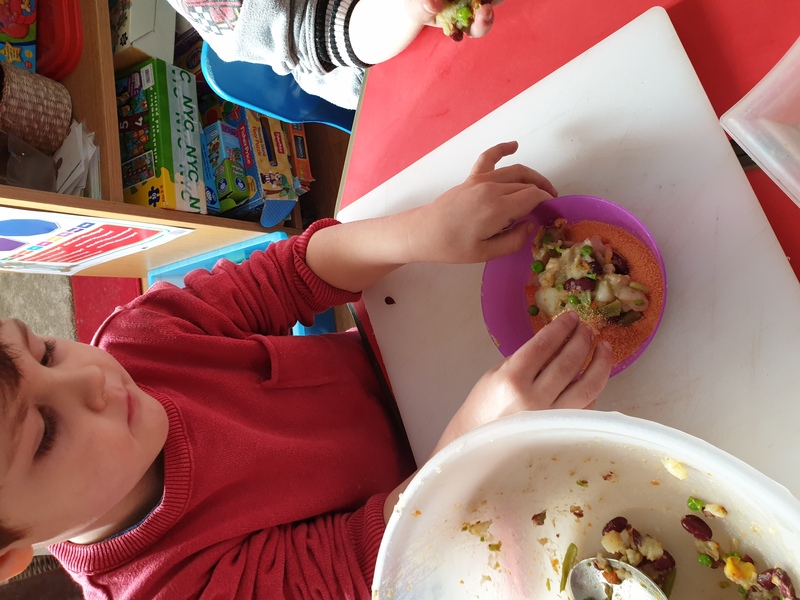 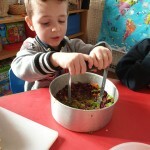 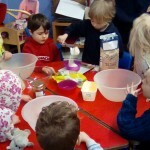 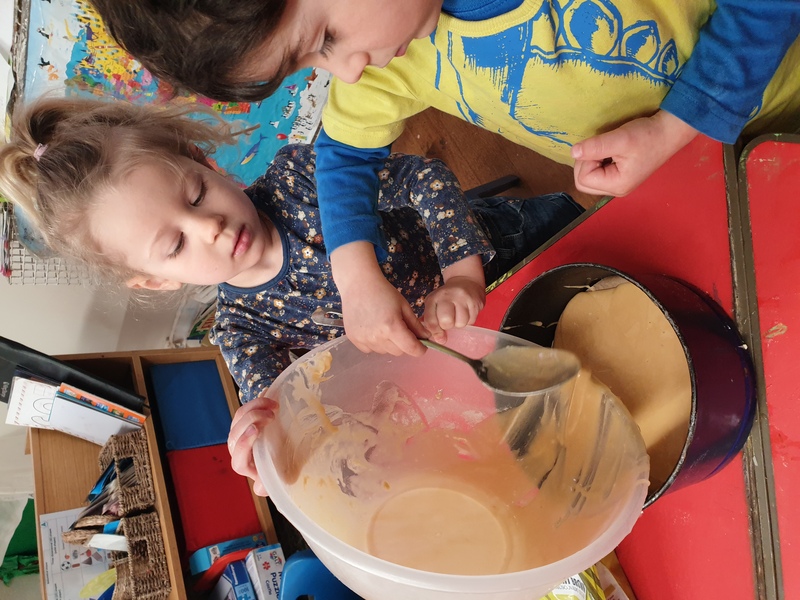 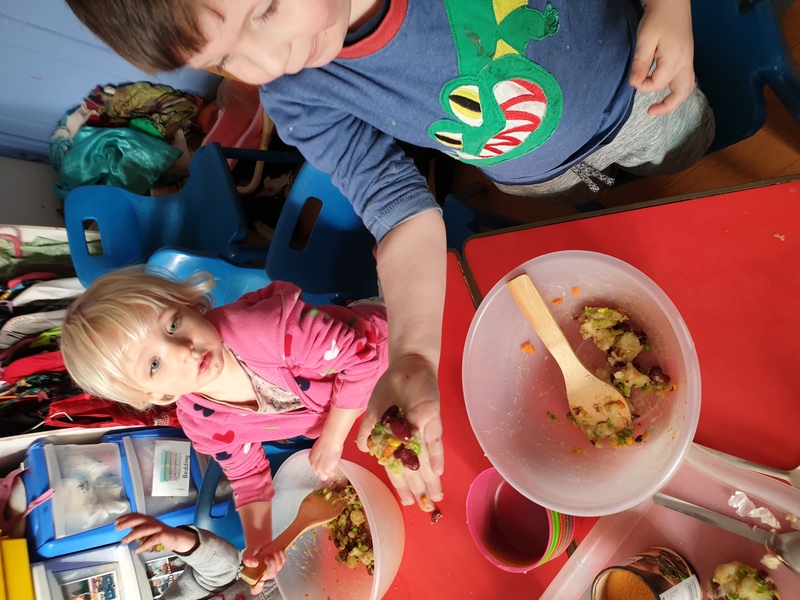 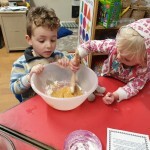 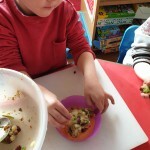 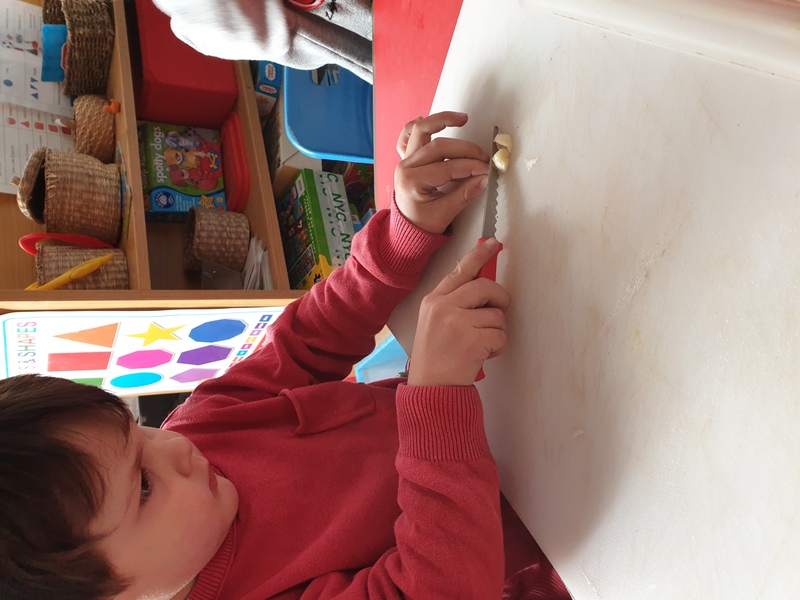 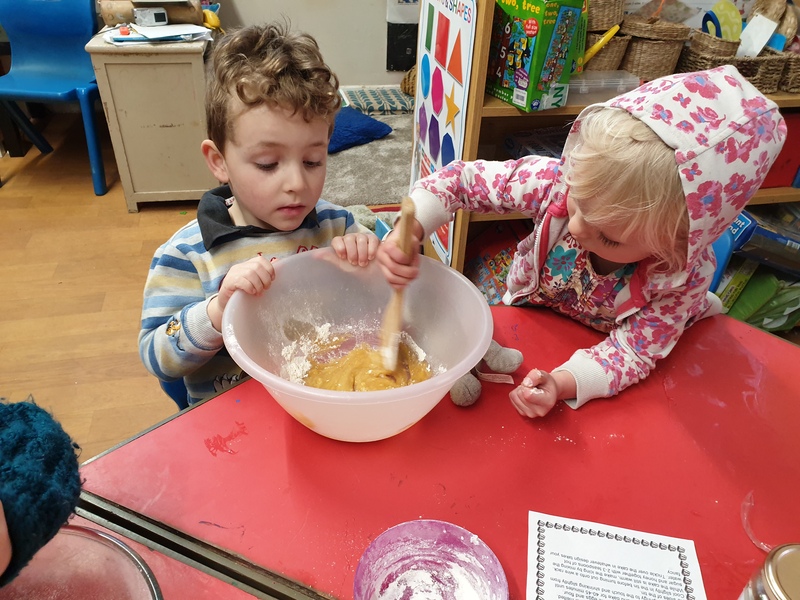 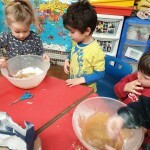 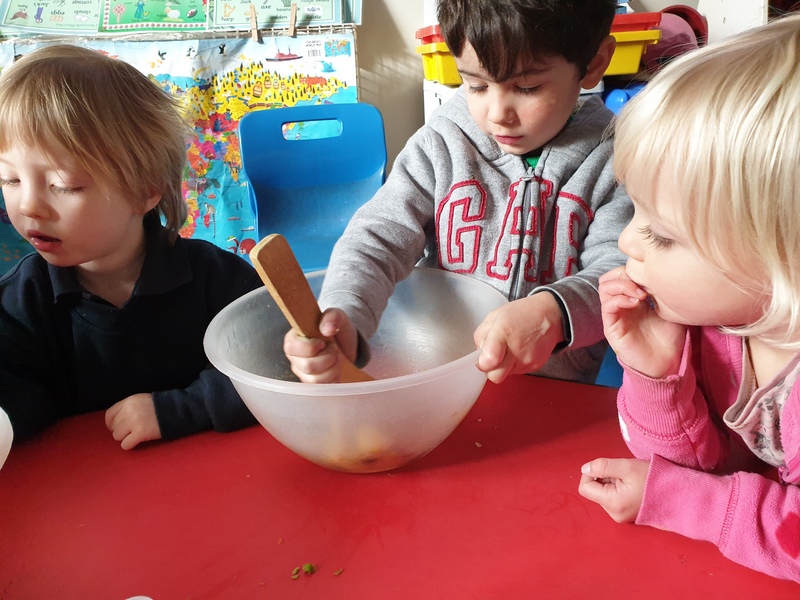 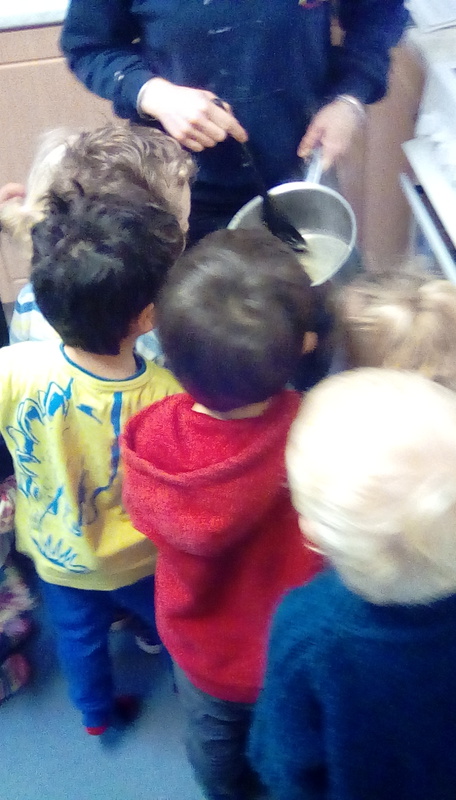 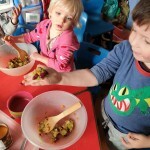 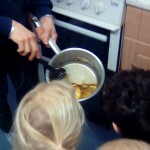 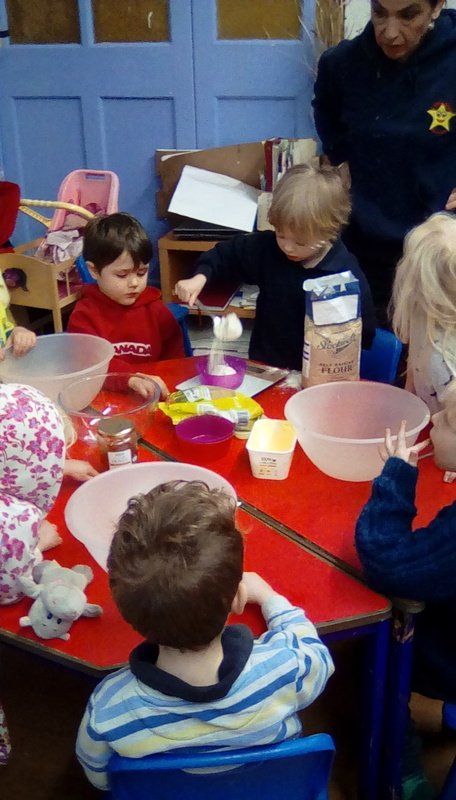 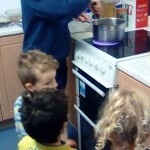 Cooking is a key element of our practice at Little Star as it covers so many elements of the EYFS (in fact each and every one it could be argued and with come creative thinking), plus the children love it. 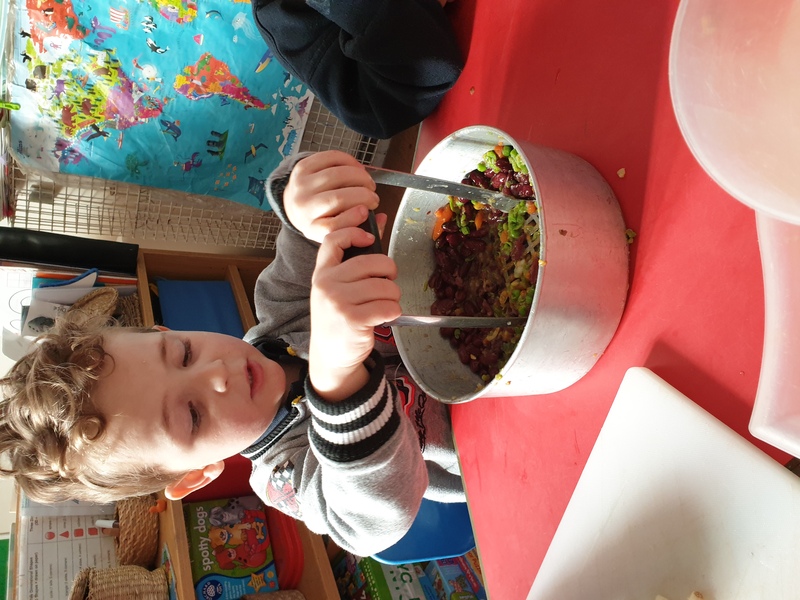 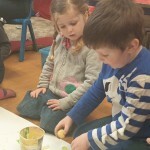 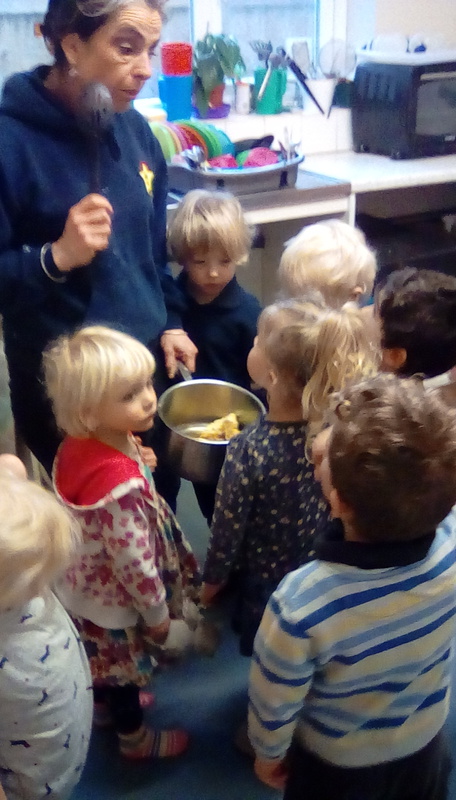 So in an effort to make it not all about making cakes this week we linked our cookery session to the story of Jack and The Beanstalk as we made bean burgers. 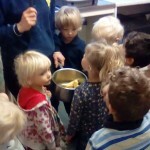 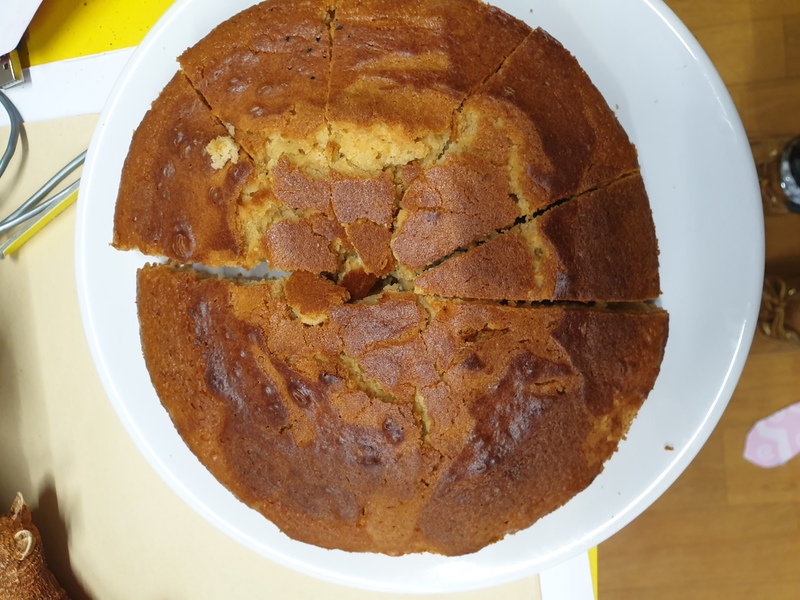 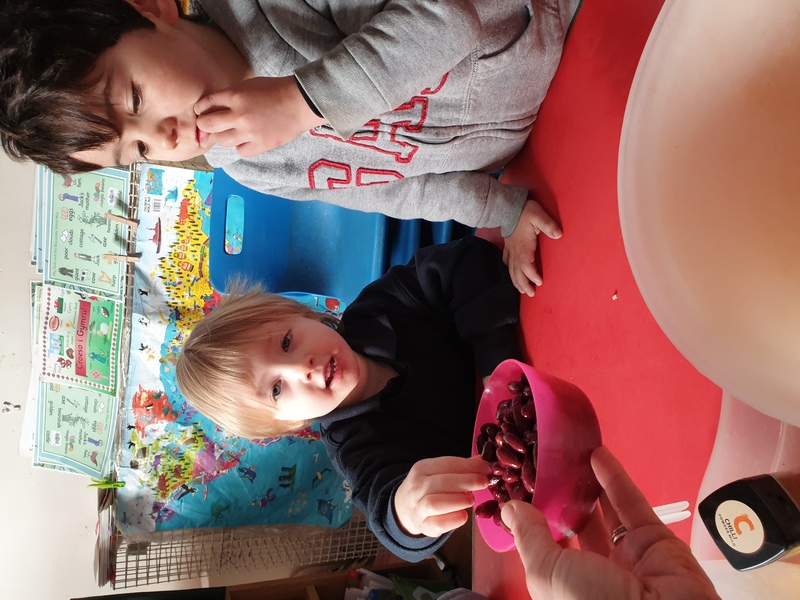 The children did careful chopping, peeling and mashing as well as tasting both the beans and the finished product for lunch…with a mixed bag of appreciation! 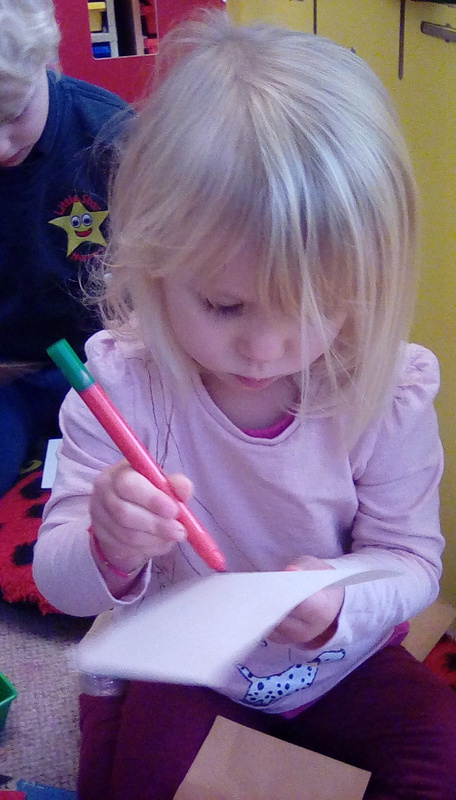 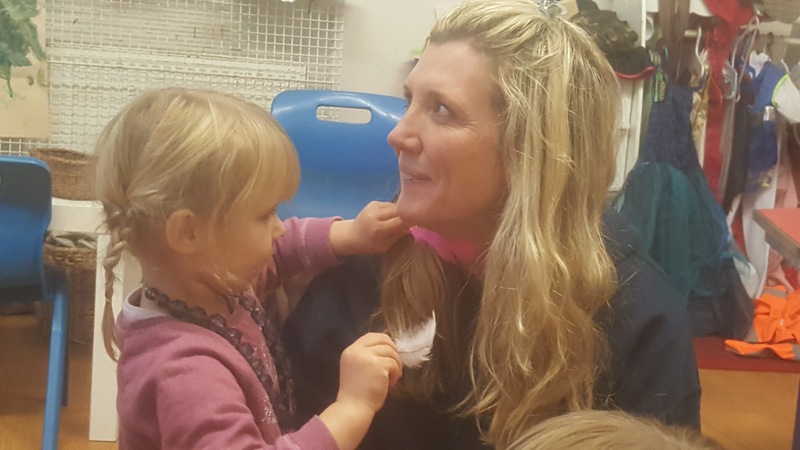 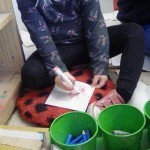 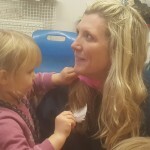 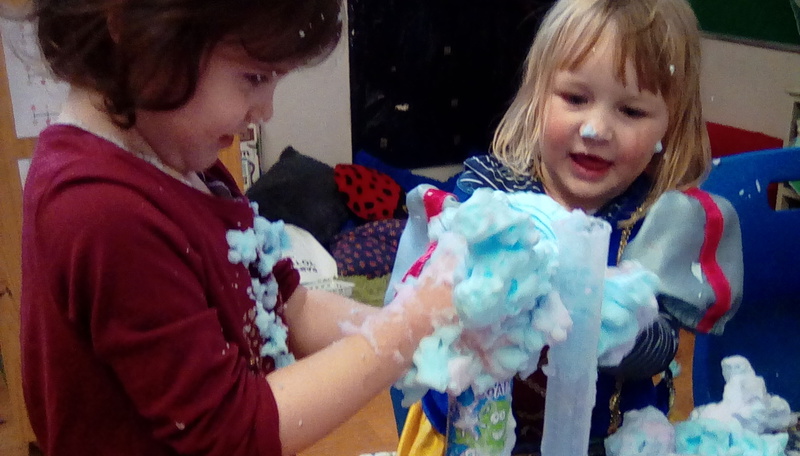 A literacy session certainly isn’t dull at Little Star…but it can become a bit smelly! 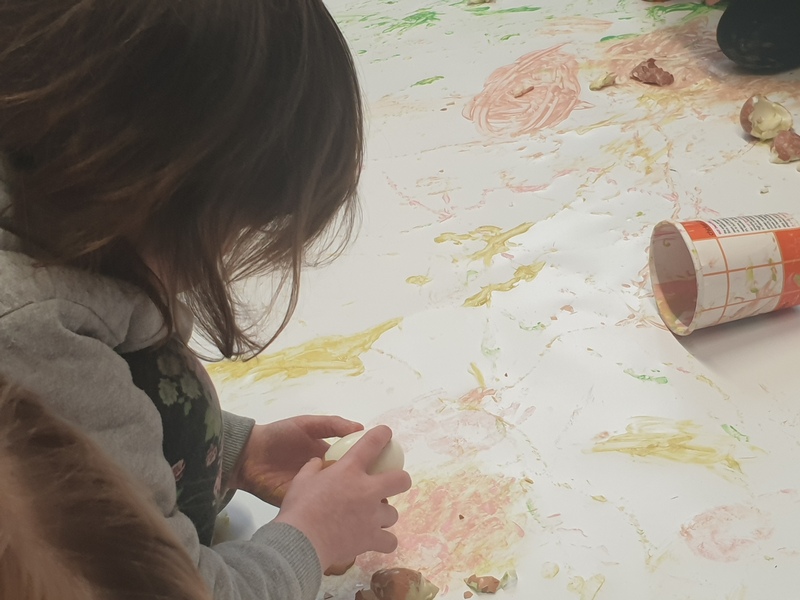 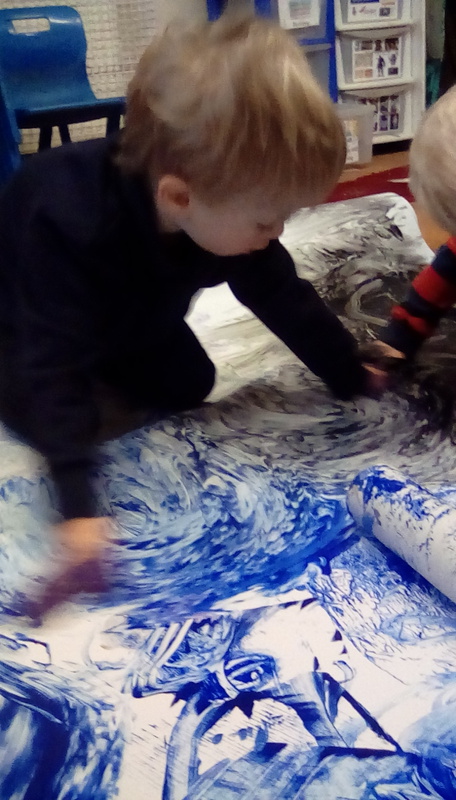 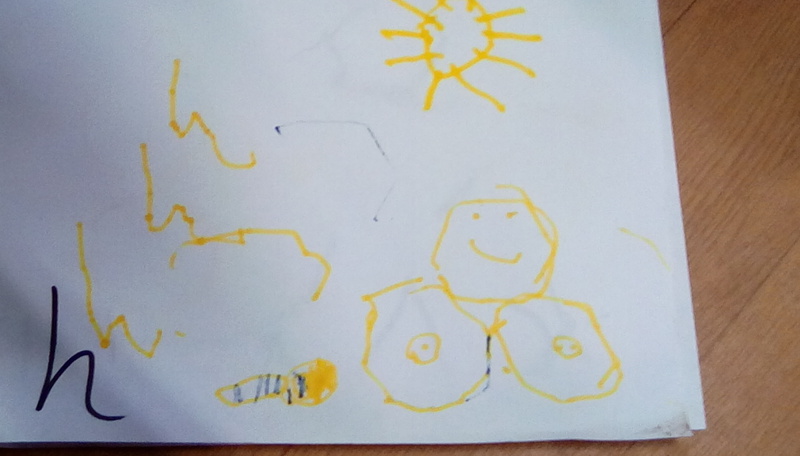 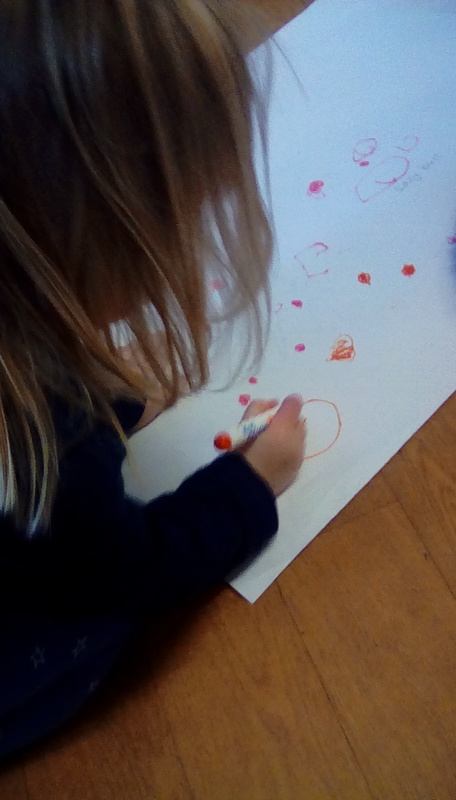 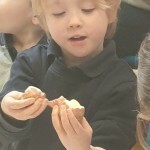 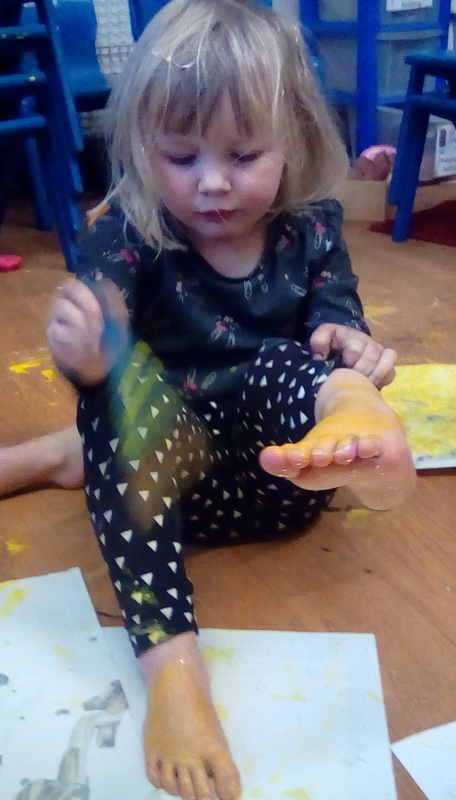 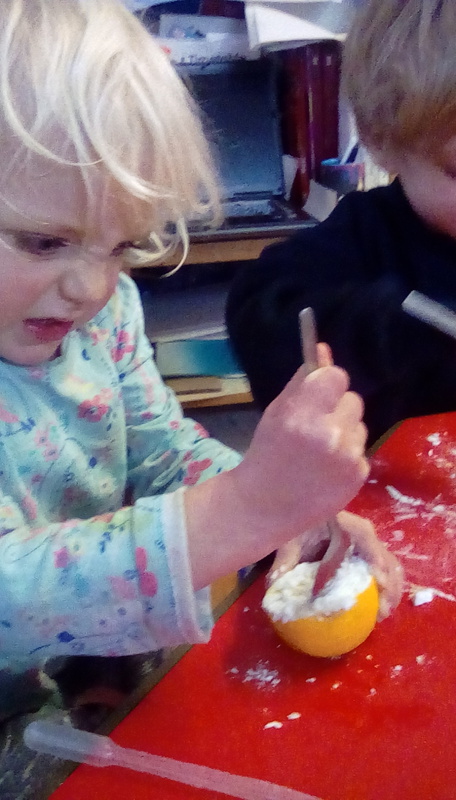 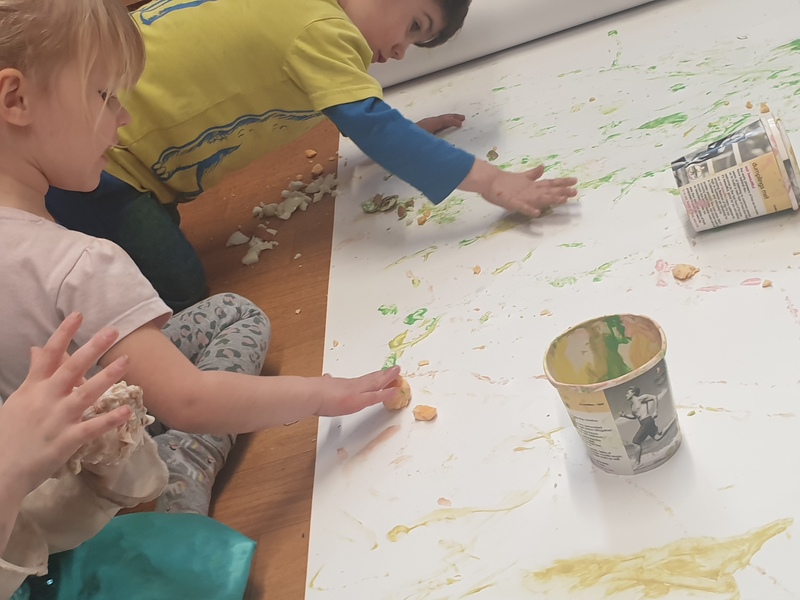 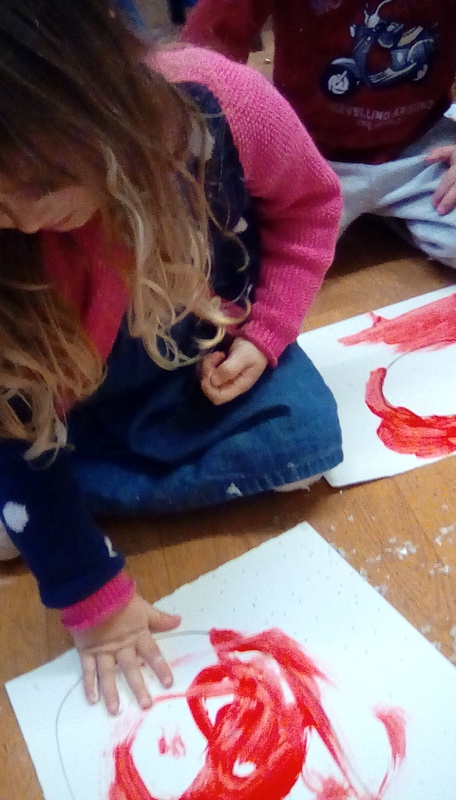 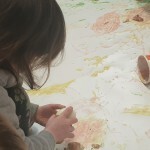 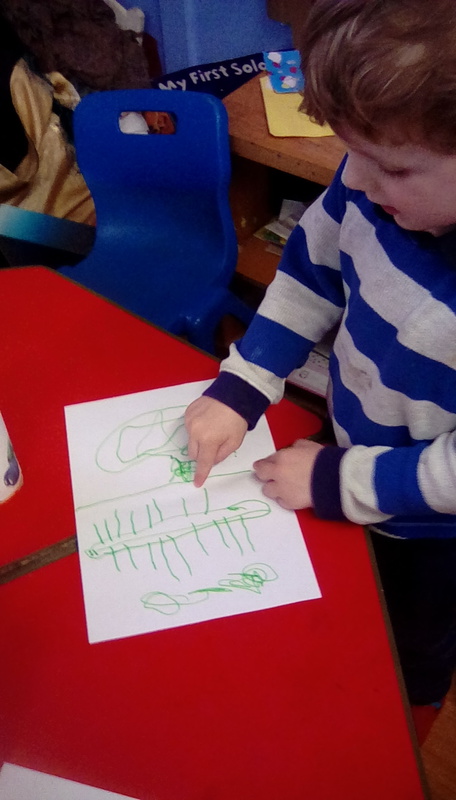 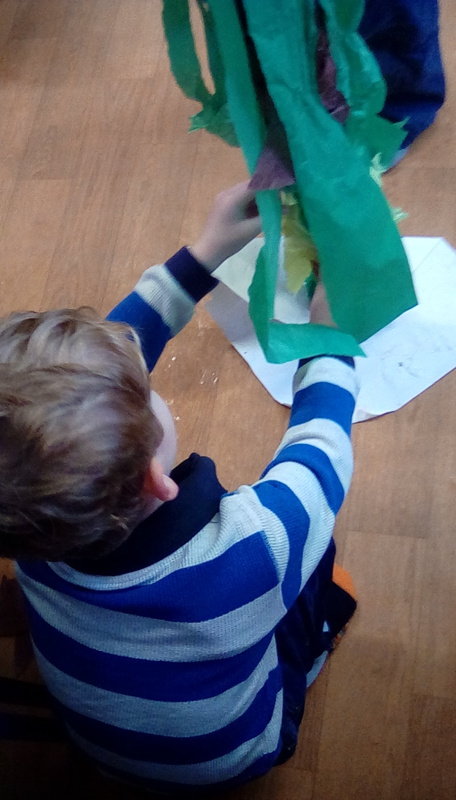 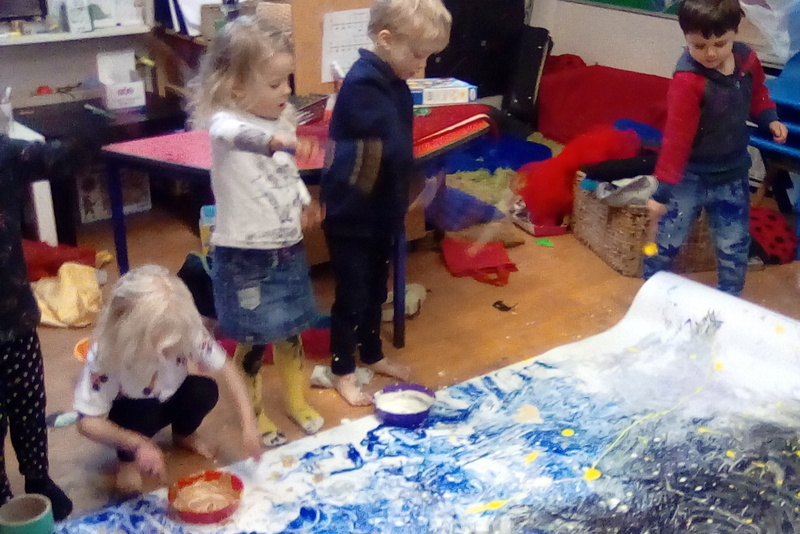 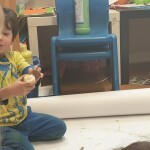 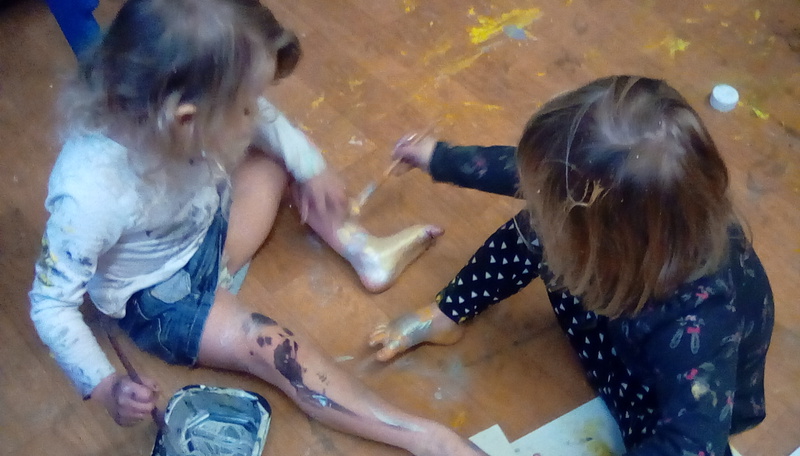 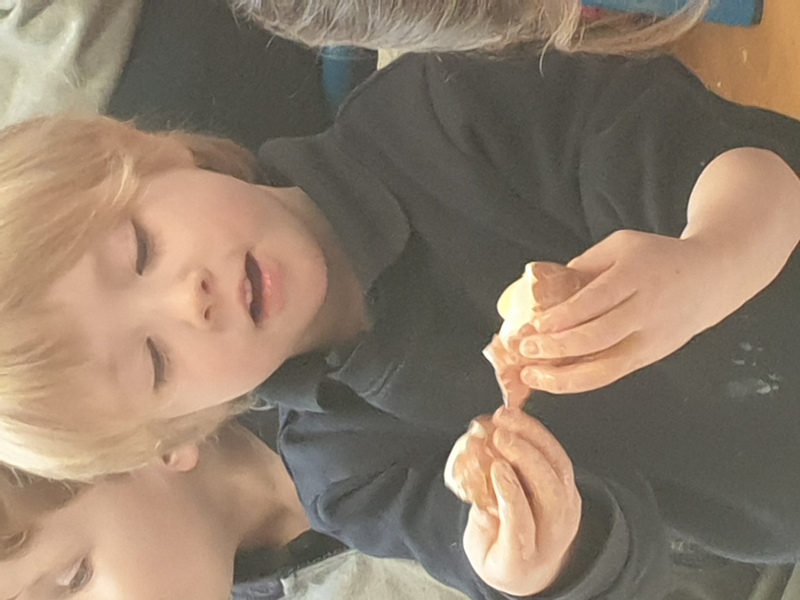 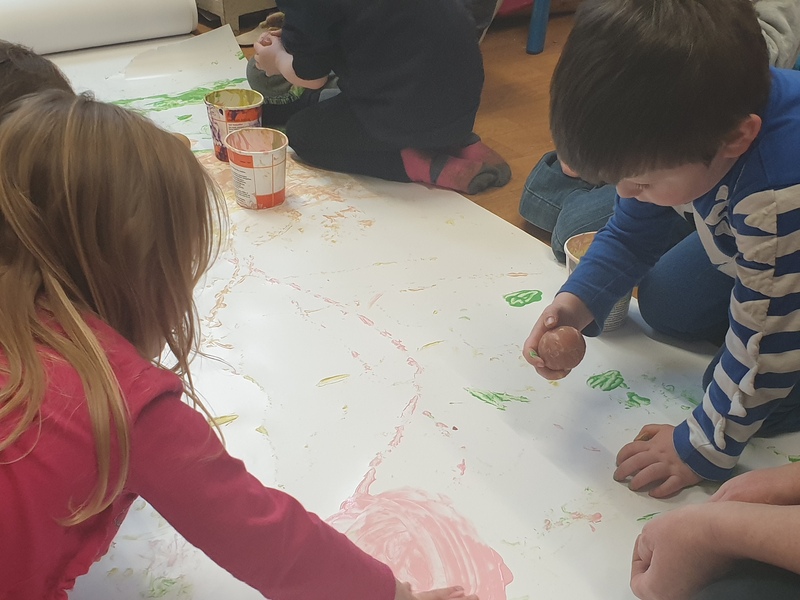 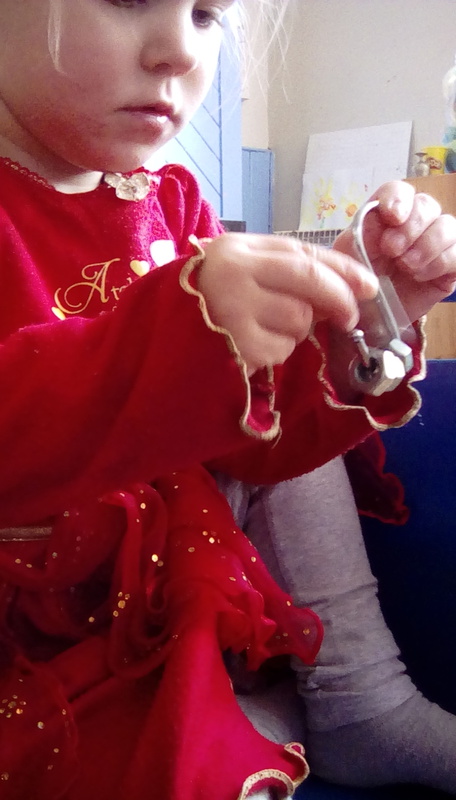 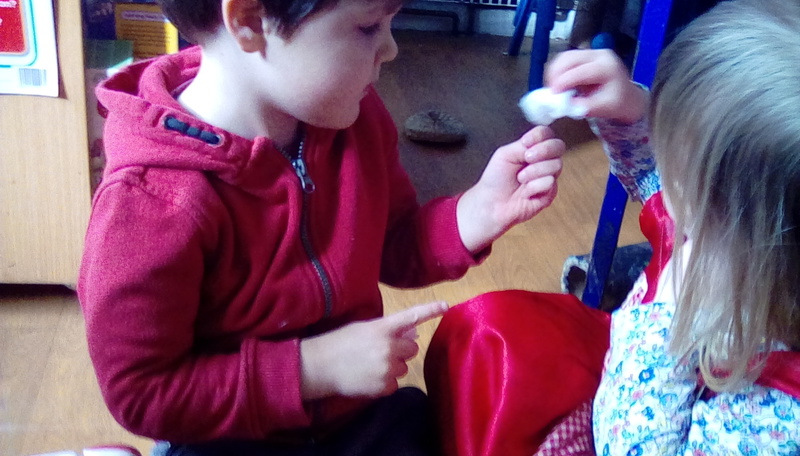 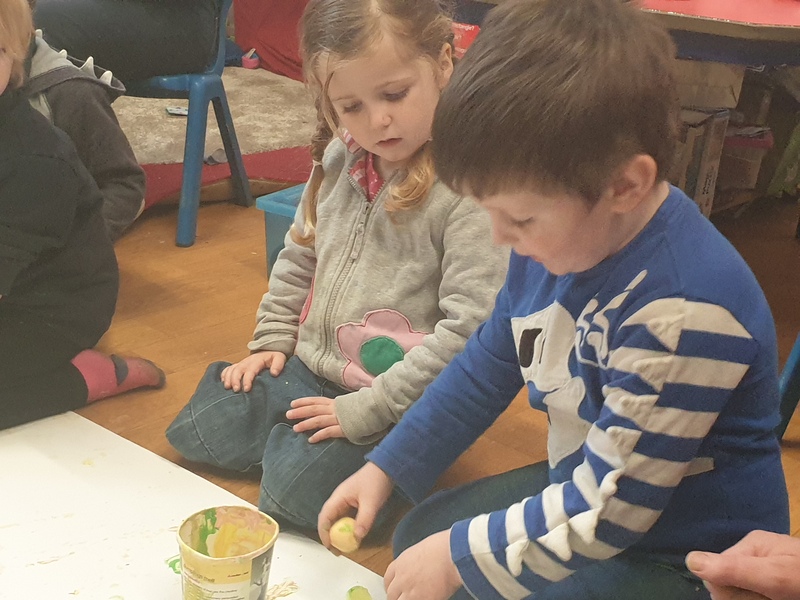 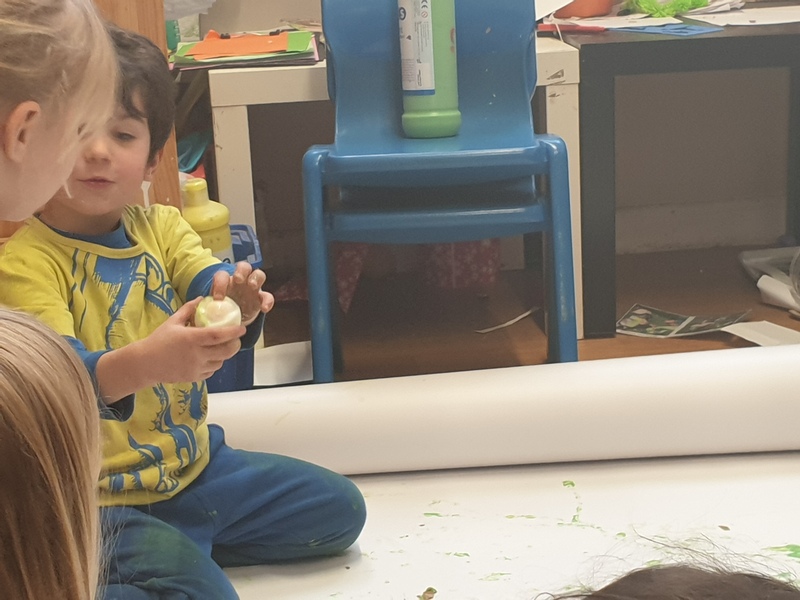 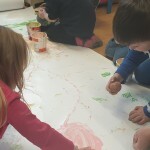 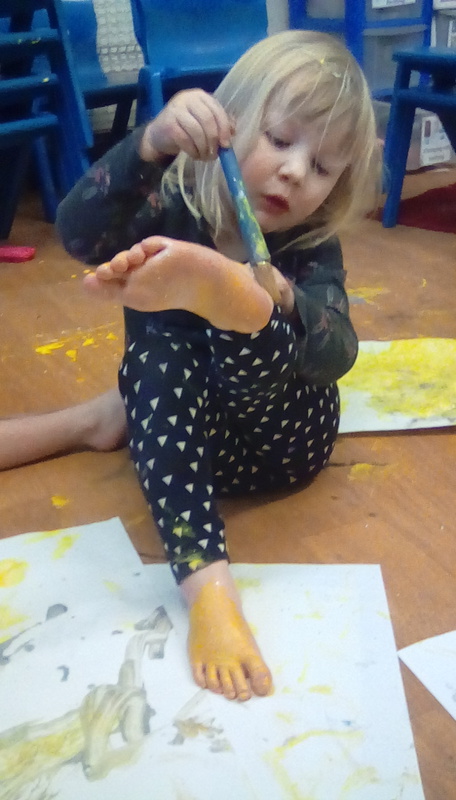 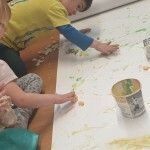 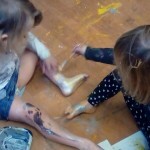 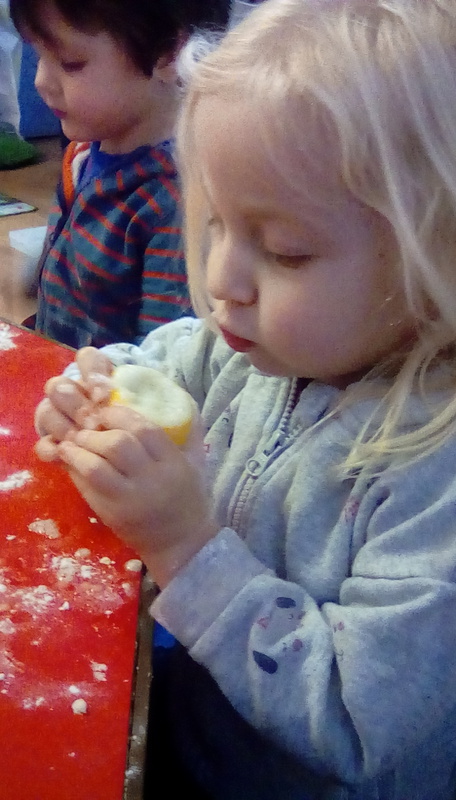 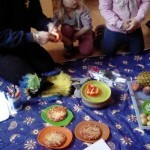 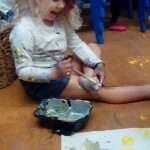 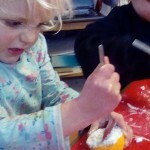 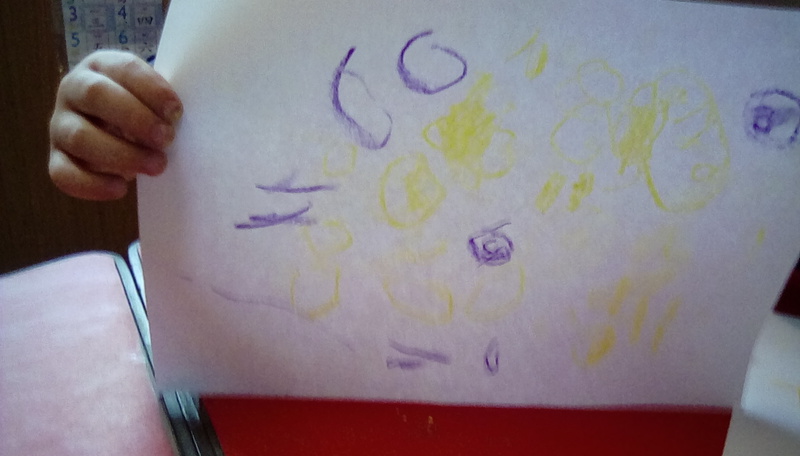 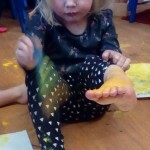 So we found when an egg – rolling/ painting exercise, accompanied by our version of the jolly phonic song, became even more exploratory and investigative as the children peeled the shells to find what was underneath. 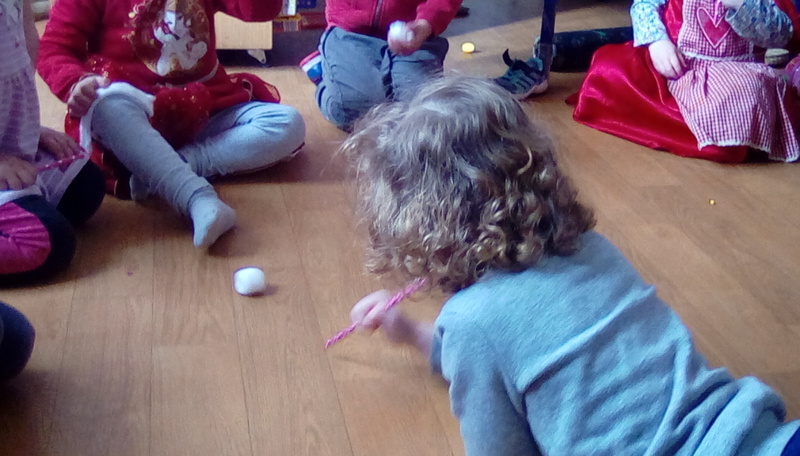 So the phonics session became a lesson in the natural world, of maths (the shape of an egg is an ovoid), creativity and lots of fun! 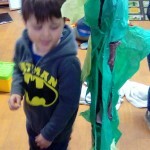 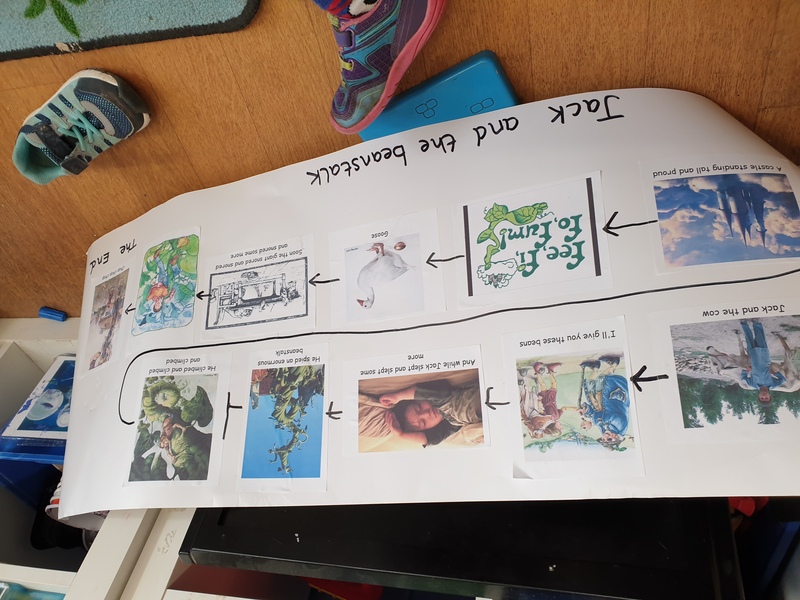 This term our active story is Jack and The Beanstalk. 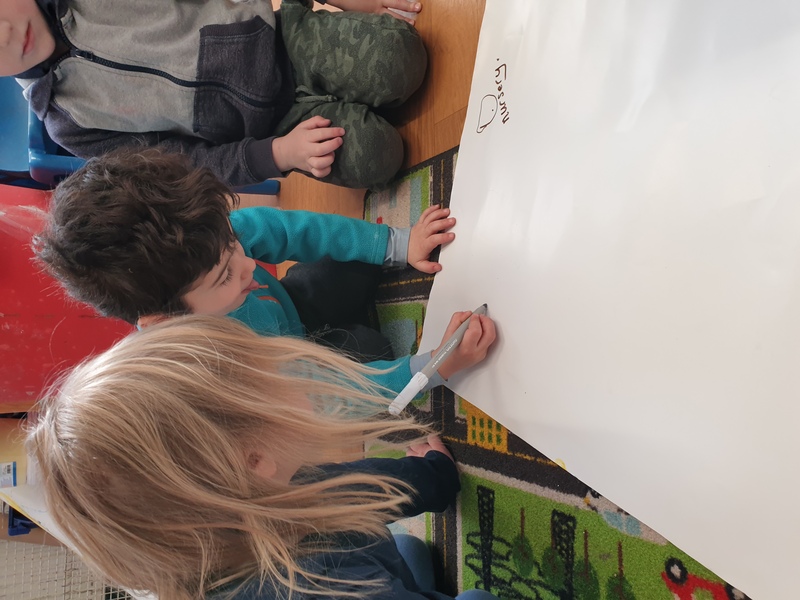 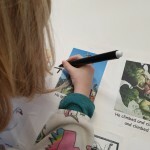 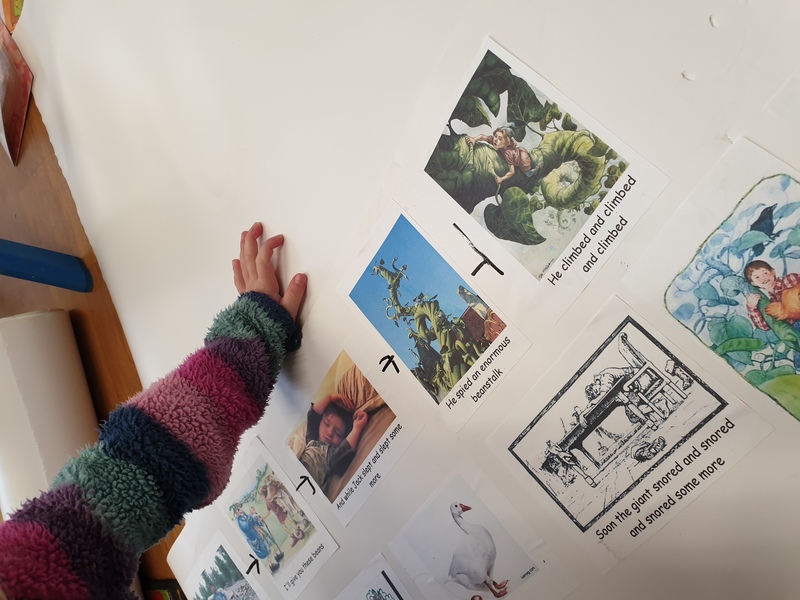 Our version has been re written to include key elements of the active story making practice: such as using actions, connecting words, new vocabulary and the “rule of three”, but also encourages the children to think about rhyme and helping end each rhyming sentence. 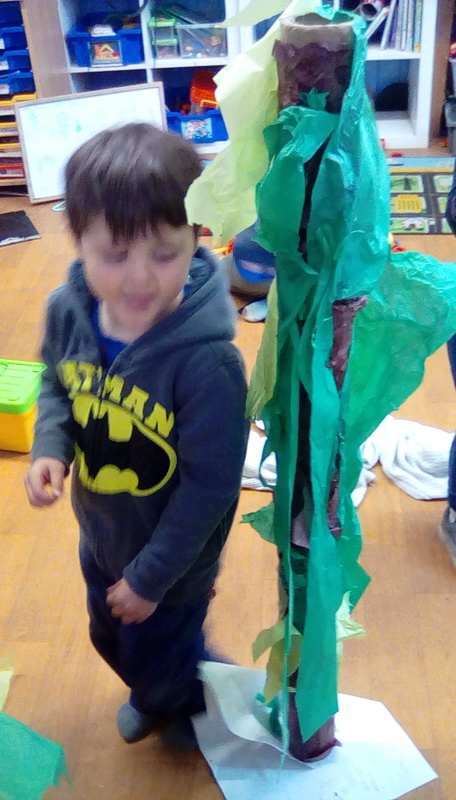 They have got off to a flying, or should I say climbing start, by joining in with the story, “reading” and sequencing the pictures, getting creative in designing their beanstalk, using magic beans to extend their imagination as to what their magic bean would do, using beans for counting and beanstalks for ordering into height. 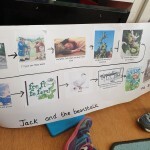 They’ve been adding their own writing to the story boards as well as producing pictures which tell their own story of the tale. 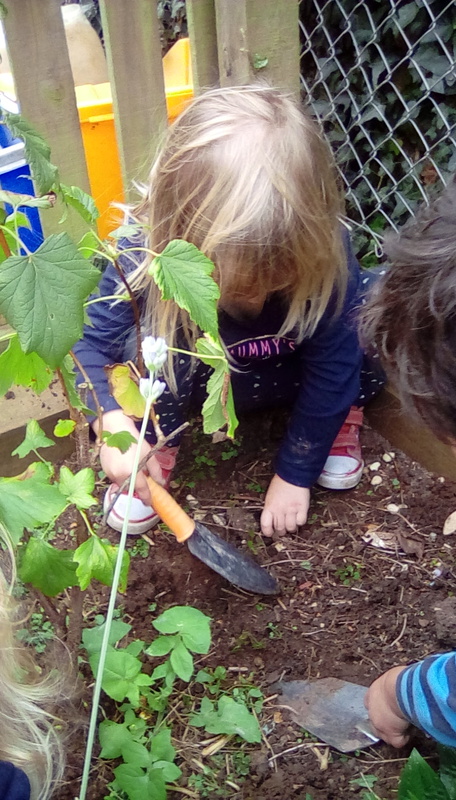 As the term progresses we will be using the story as a link to grow our own beans and look at growth, what plants need to grow and make a start on our vegetable patch so we can reap the rewards in the Summer. 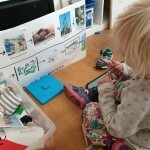 I don’t resent or regret the rise of technology. 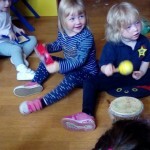 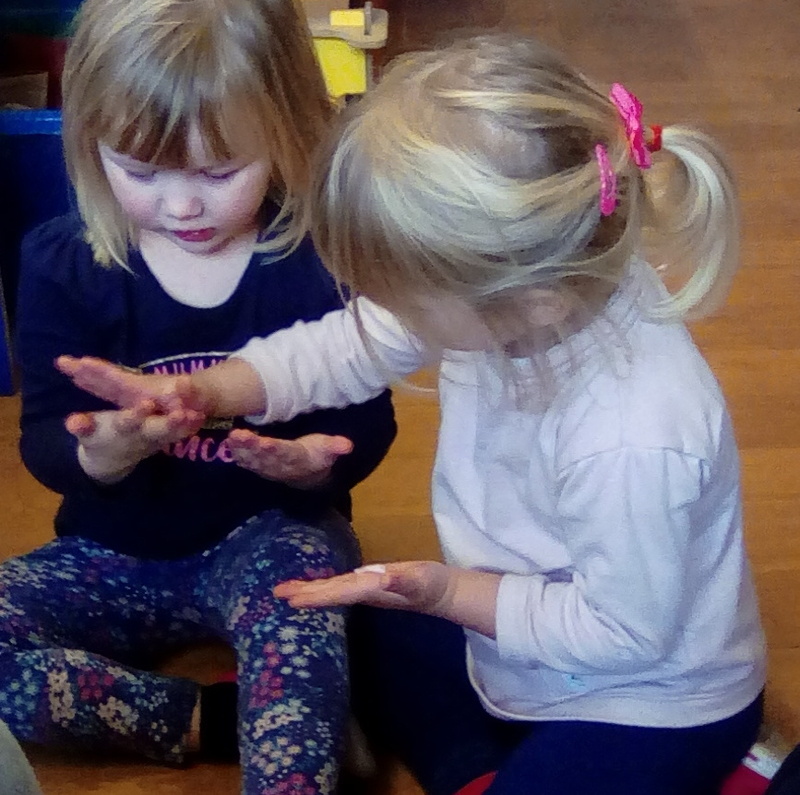 The internet provides a valuable resource to us at nursery, as we have access to facts, information, new and different songs and music, as well of course being a way of sharing information with you. 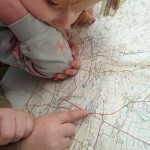 However it has meant that some resources are being abandoned and one of these things are maps. 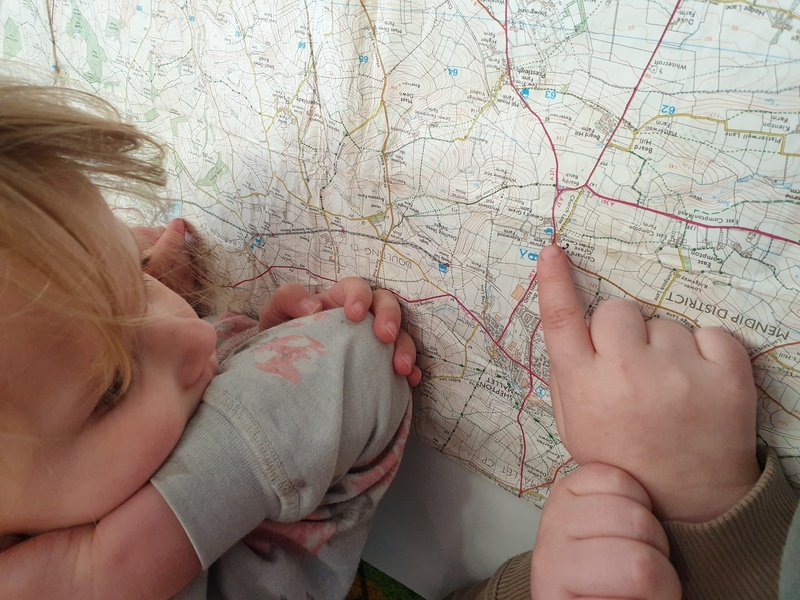 With SatNav in your car, google maps on your phone, these inconvenient, rather large paper things just are not needed anymore. 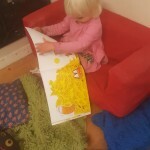 And yet as a means for children to read and understand about features of the world, of our country, they are invaluable. 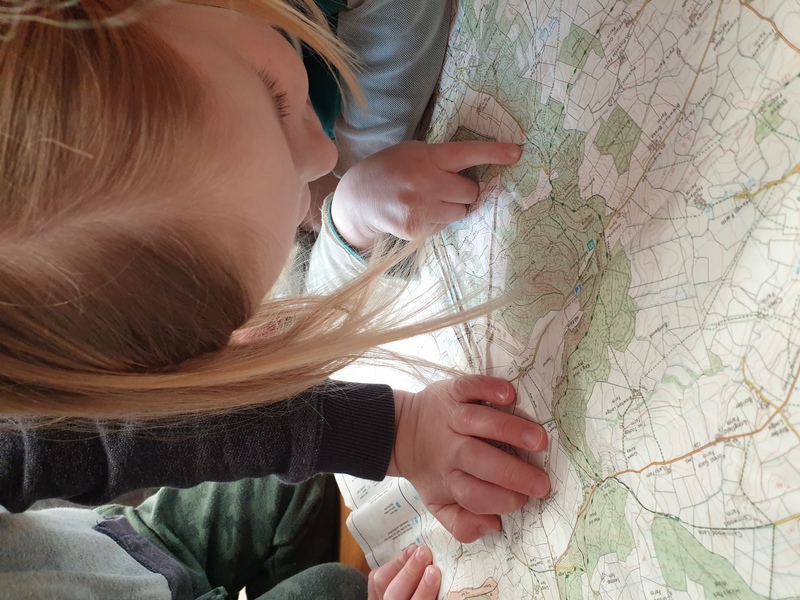 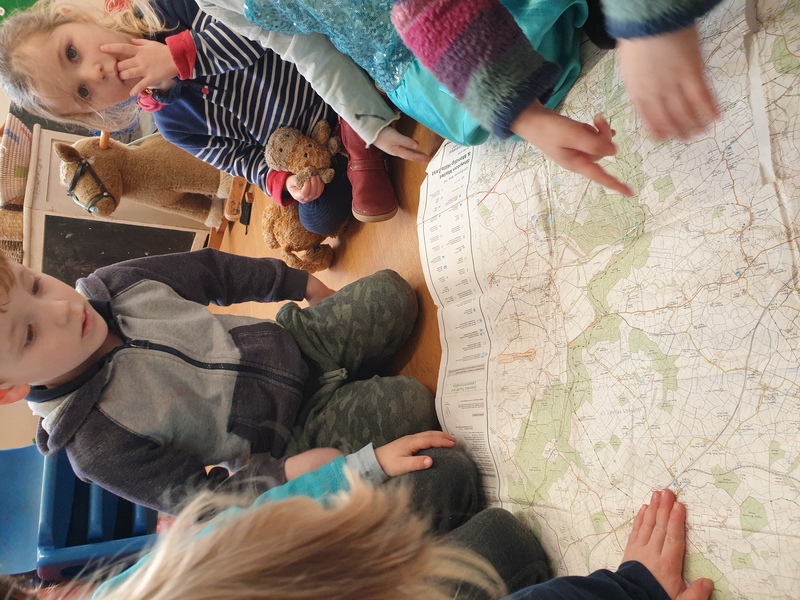 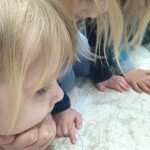 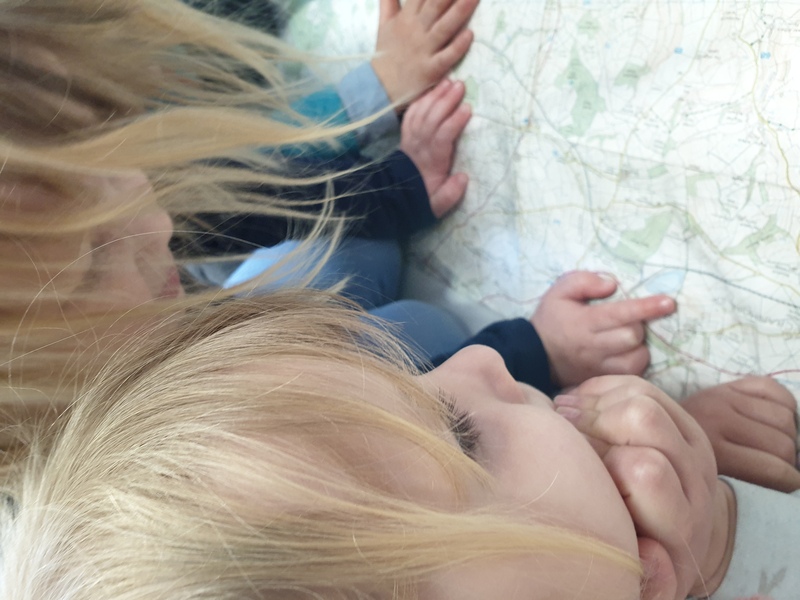 This week the Shooting Stars used maps to read: to recognise roads. 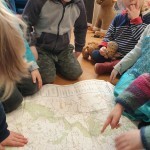 rivers, forests as well as spotting symbols such as that for a campsite. 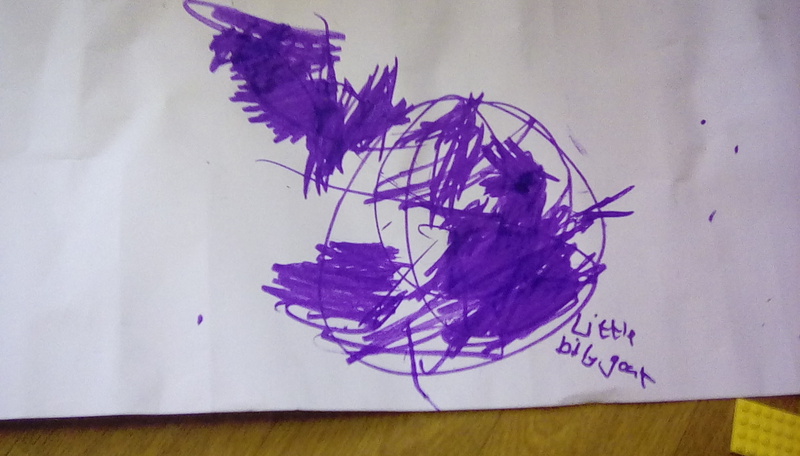 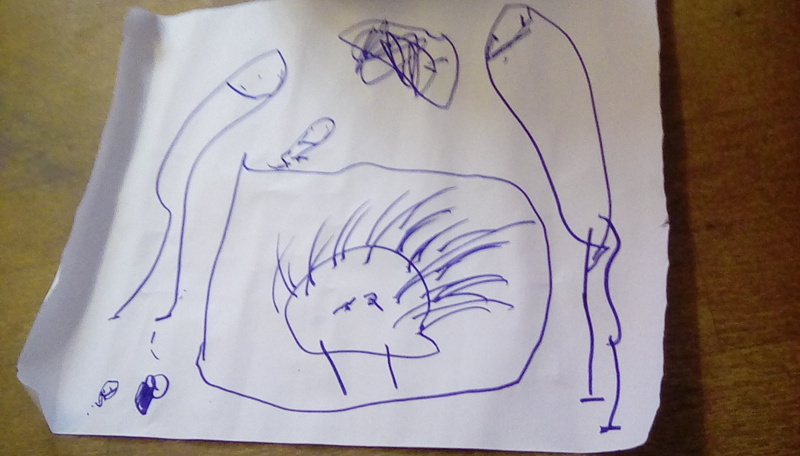 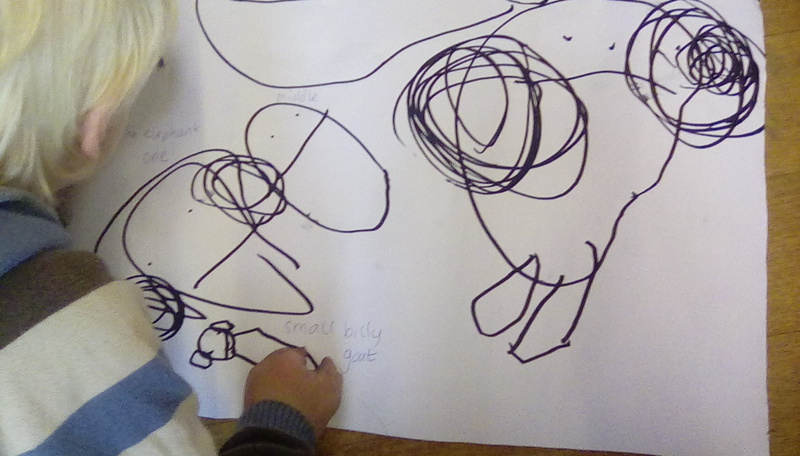 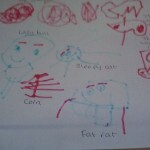 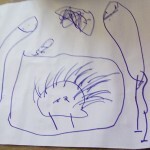 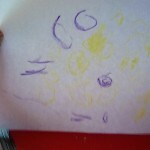 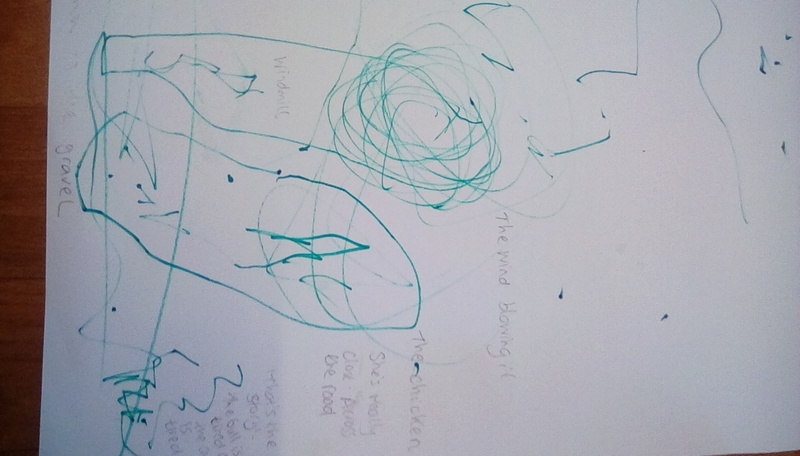 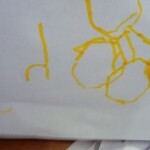 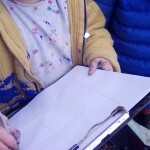 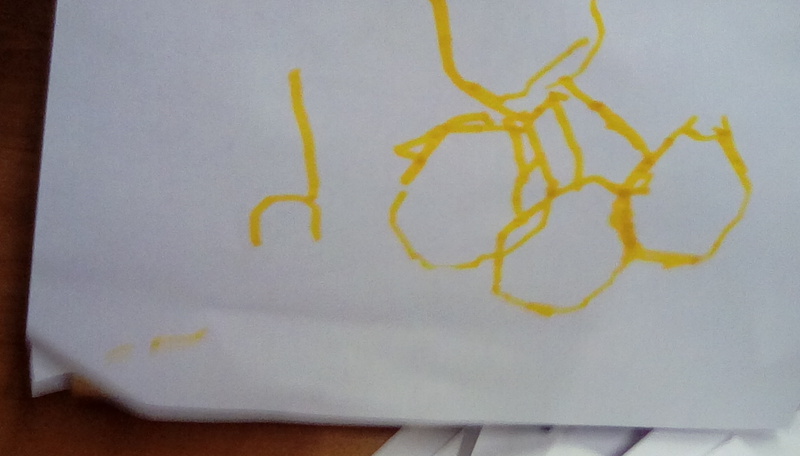 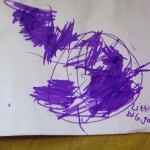 They then transferred those skills in drawing their own map of the walk that we were going to do to the pond. 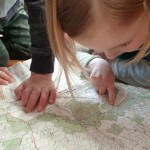 So don’t throw out your OS and A-Z maps quite yet: add them to your children’s bookcase. 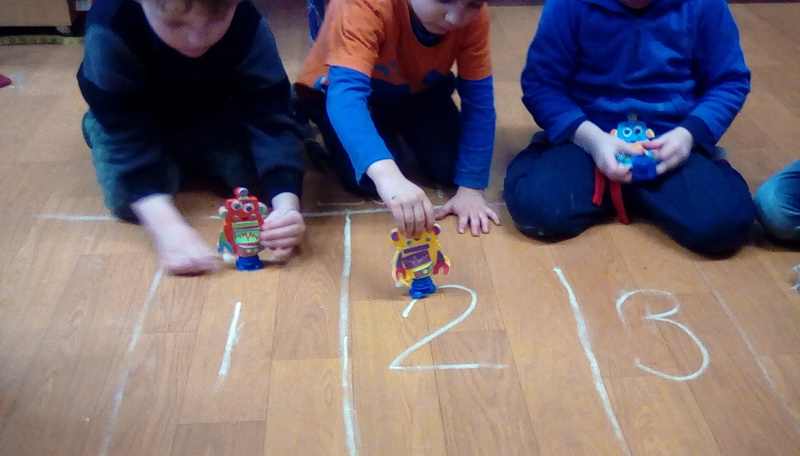 Counting: Not quite as easy as 1,2,3. 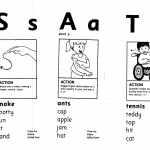 We use phonics as a foundation for reading: to be able to recognise and sound out words enables children then to blend them together to read full words and sentences. 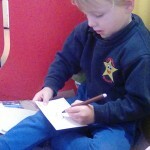 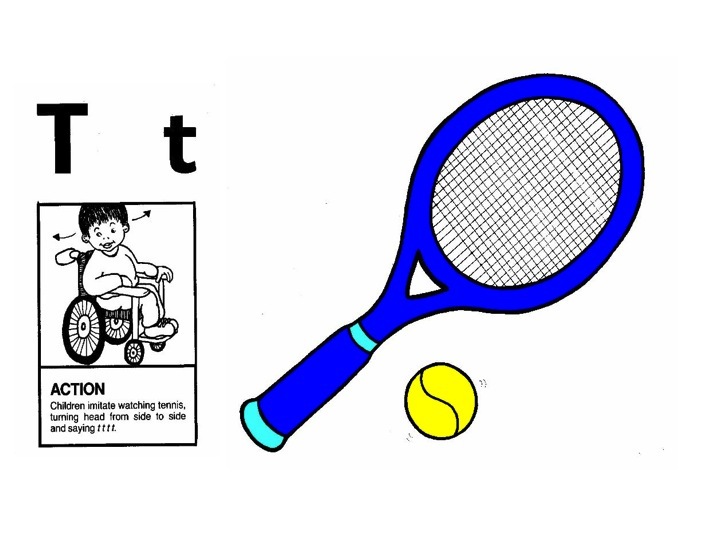 Similarly we develop nad exercise muscles in the wrist to enable children to write. 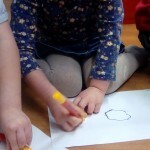 Similarly, in order to master later mathematical skills first children have to be able to count accurately. 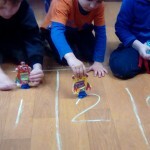 And this does not mean reeling off their numbers from 1 – 10 or even 20 because that is reciting. 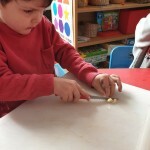 It’s a skill, but it isn’t real counting. 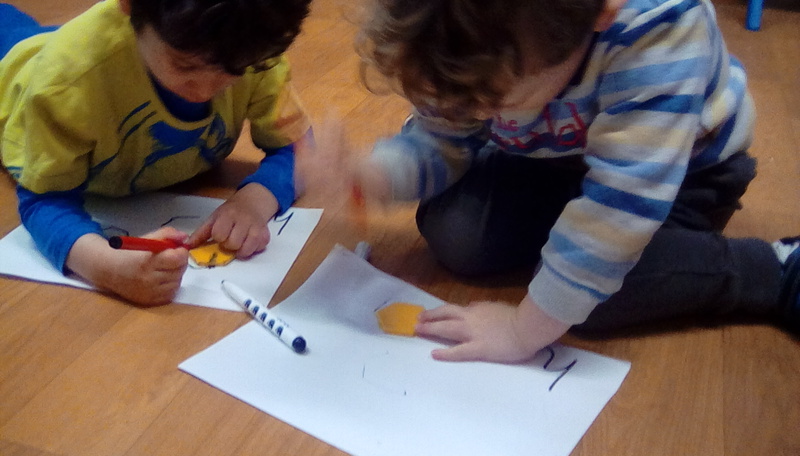 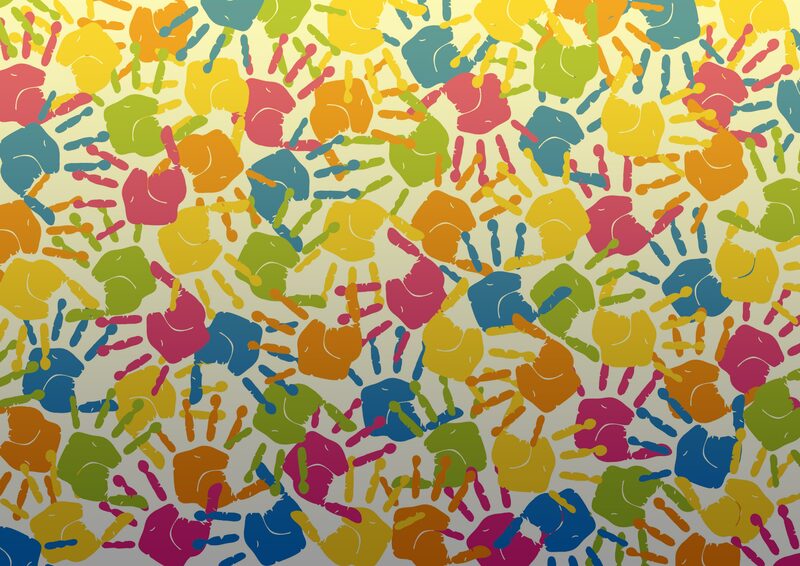 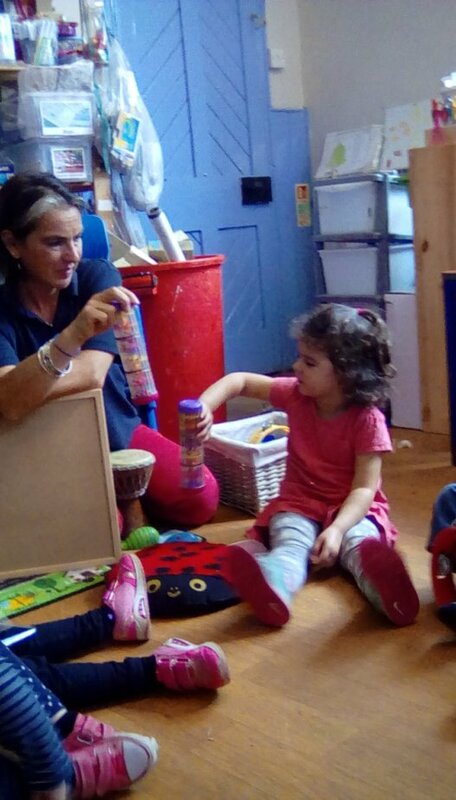 To master counting the children must be able to relate a thing for a quantity, this is where the importance of one to one representation comes into play. 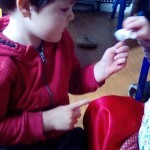 Take time with your children to slowly use their fingers to count each thing in turn. 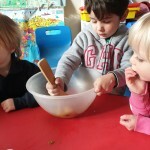 Often they will rush and so go back and do it with them, using your fingers and then theirs. 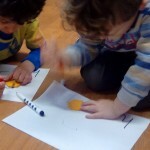 In this way they become aware of numerical representation. 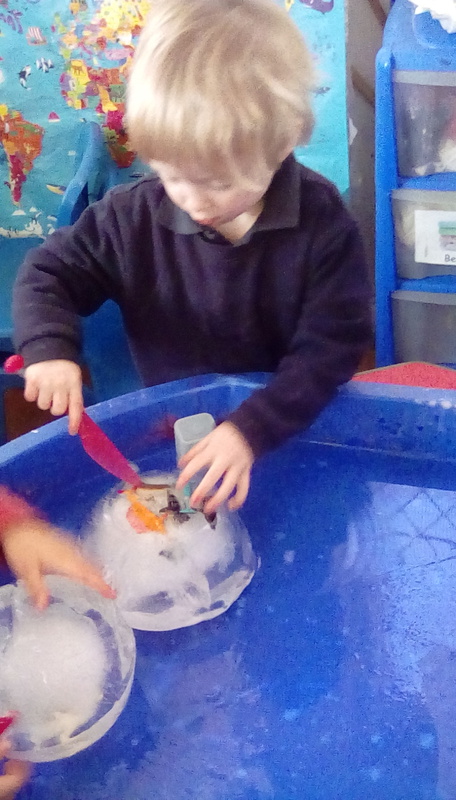 Pirates need to count their treasures accurately! 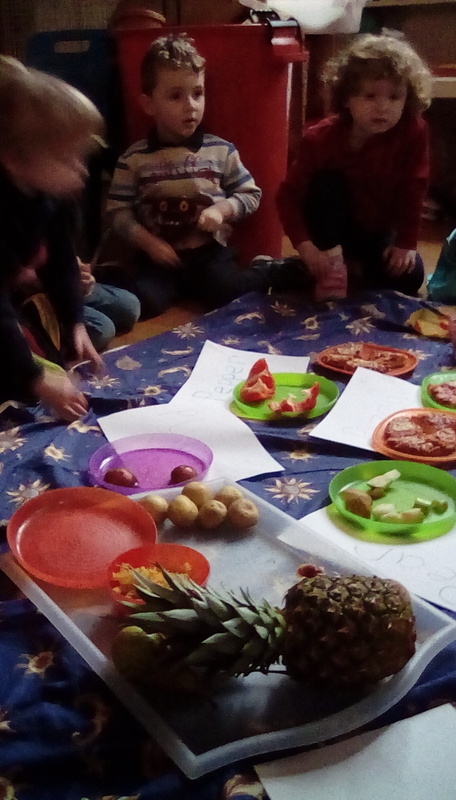 Continuing our passion for active learning, the Shooting Stars used food to be introduced to the phonic pf ‘P’ as they were invited to Percy Parrot’s picnic, where everything we ate began with the sound ‘p’. 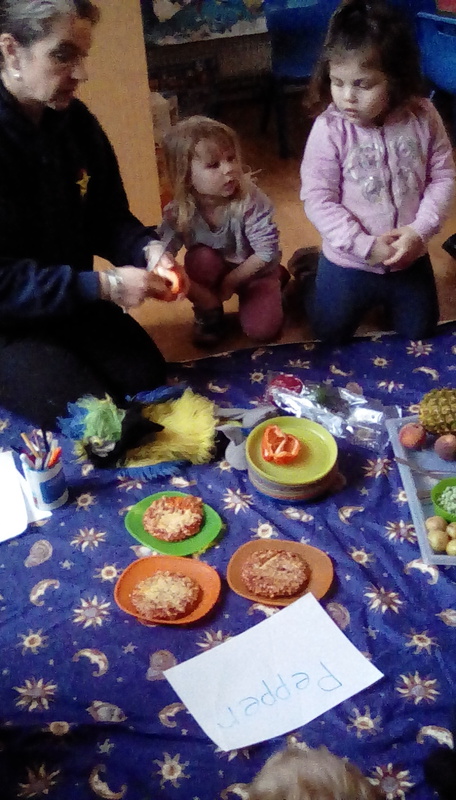 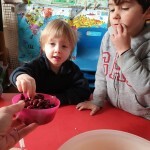 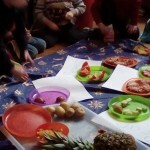 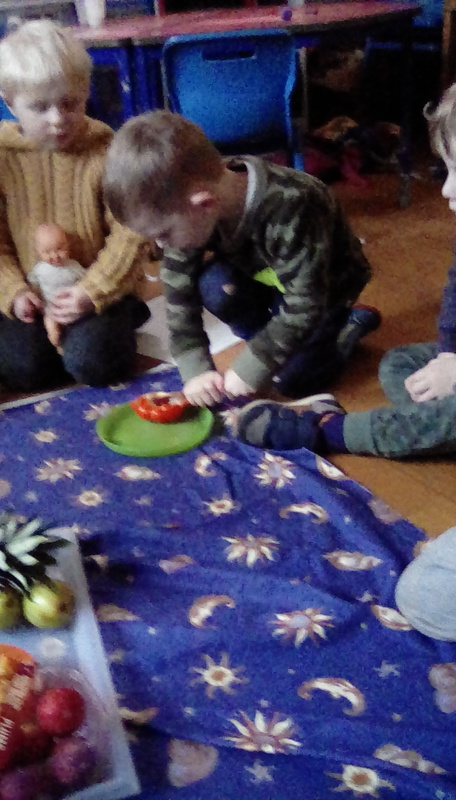 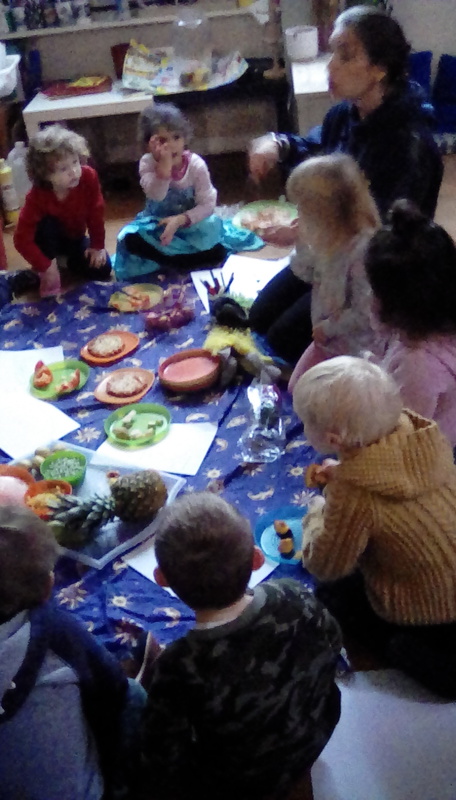 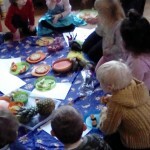 As ever this literacy “lesson” extended to using fine motor skills in cutting up the fruit and vegetables, a lesson in geography as we found out where the food had come from as well as counting, sharing, talking and listening to each other; working as a group. 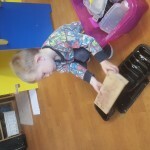 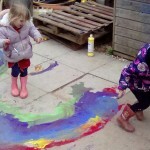 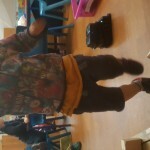 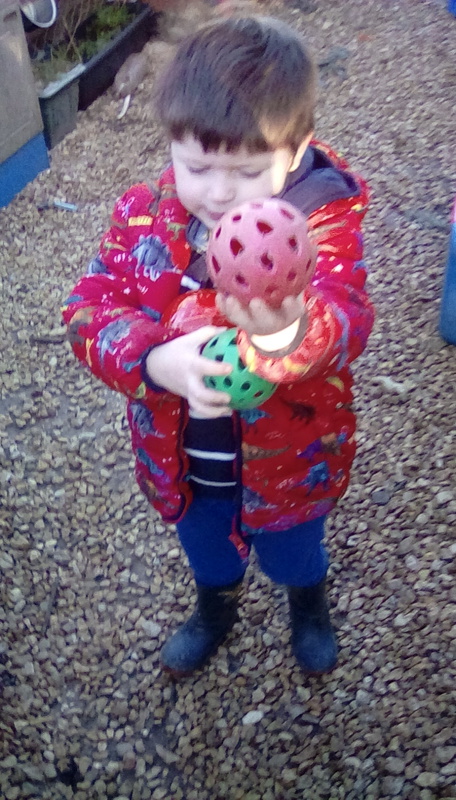 It’s all about being active so far this month….active story making, active phonics, active maths and active exploring! 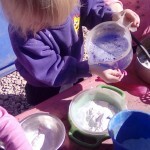 Whilst we want to extend learning in key “formal” areas such as literacy and maths we are also passionate that the method of teaching needs to match the individual learning styles of each child and so they are able to make their own emerging discoveries every day, so they are motivated to learn for themselves and not to please someone else! 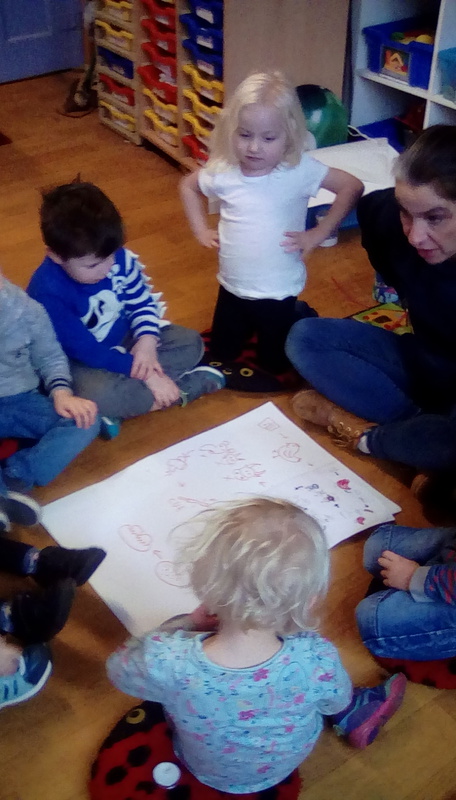 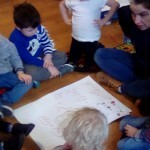 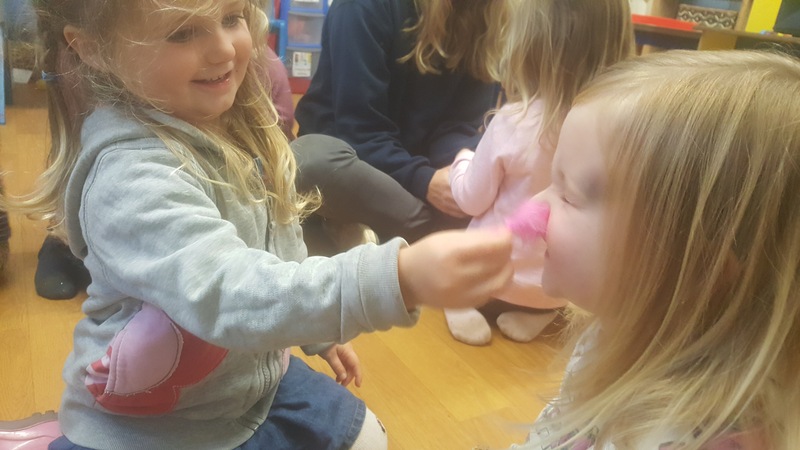 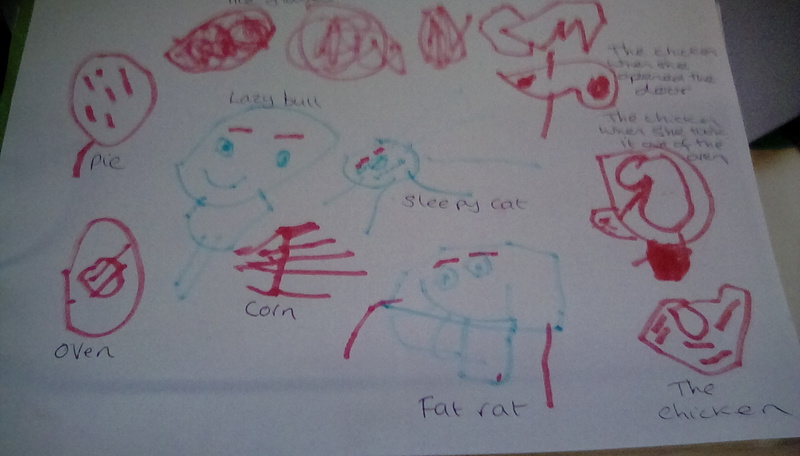 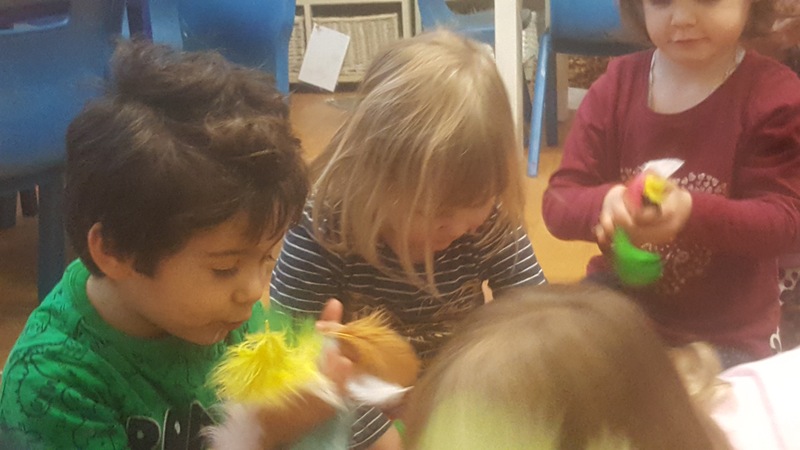 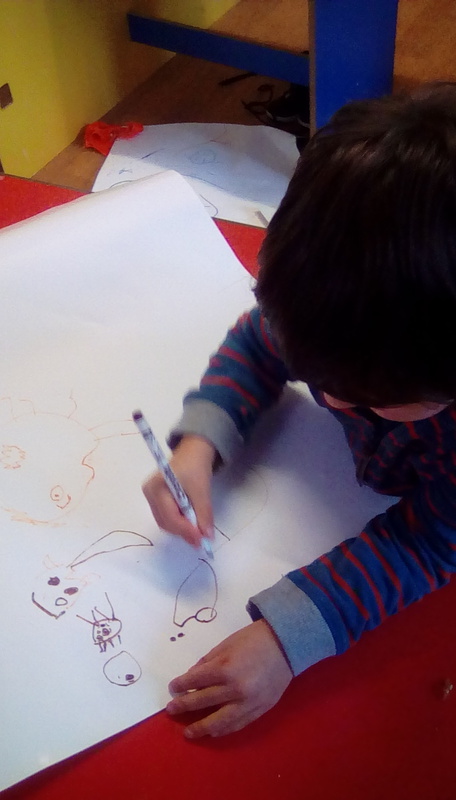 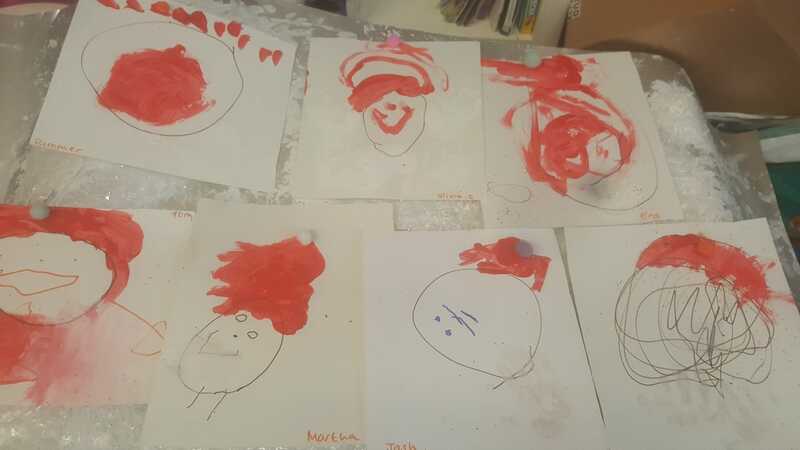 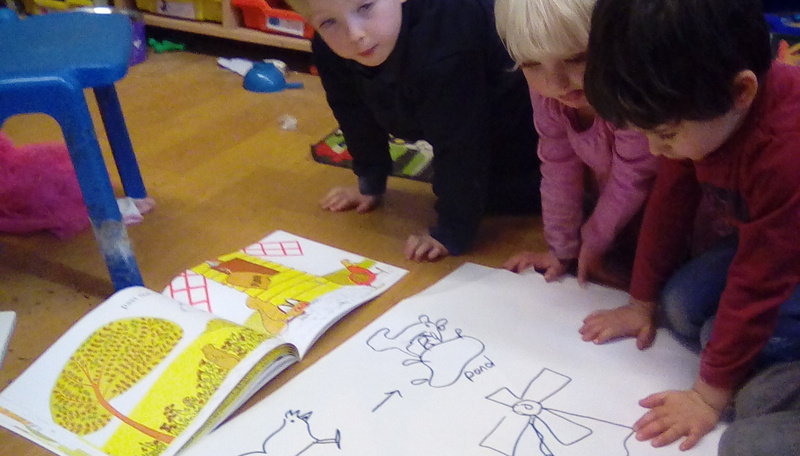 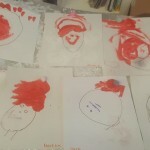 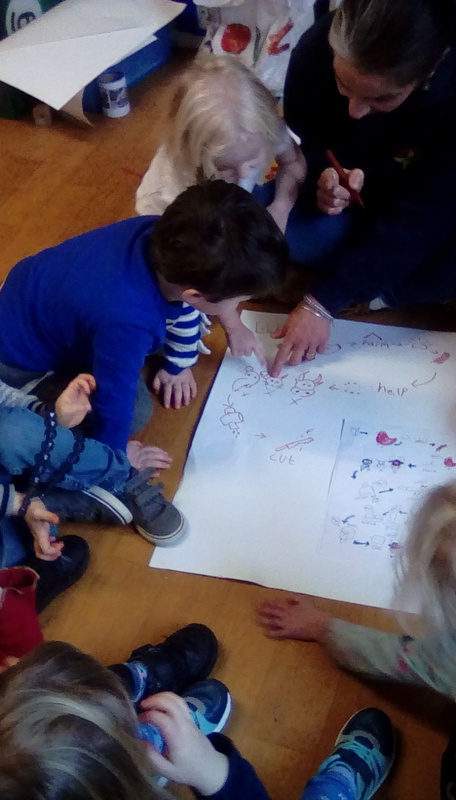 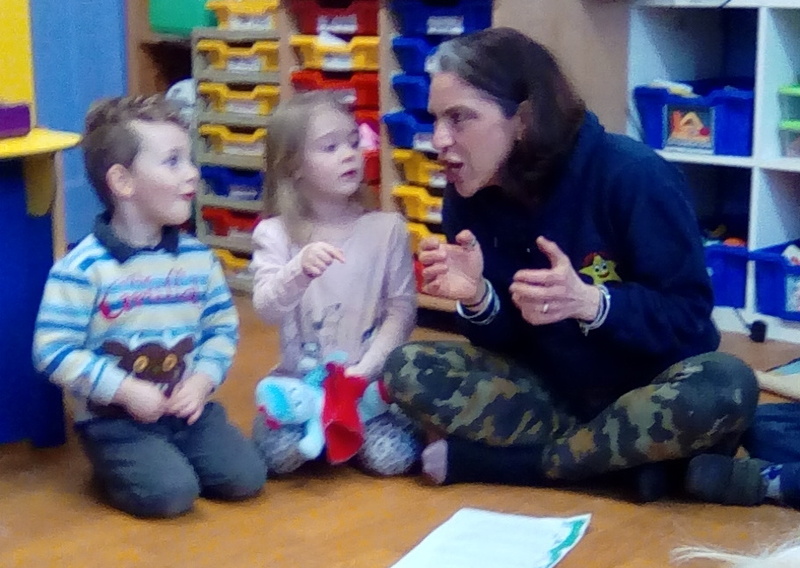 We have had some very animated and vocal active story making sessions as the children take on the personas of the “lazy bull”, “sleepy cat” and “fat rat” as well as being the very assertive Little Red Hen. 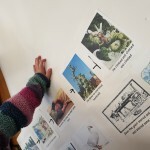 They have started to “read” the story map and thus able to sequence and tell the story for themselves as well as talk about the stories they are making on paper. 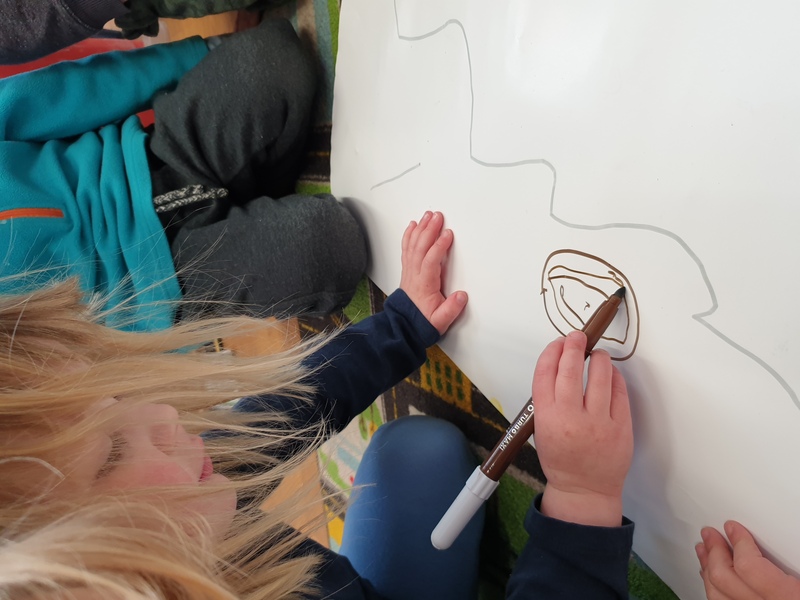 It is important that we value and listen to everything the children tell us about these stories that they create, as they might add a snowstorm, steps up to the windmill as well as just acknowledging that every mark, every scribble and every line carries meaning. 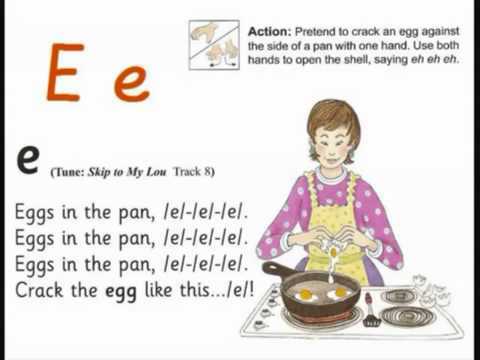 The course of jolly phonics can seem very prescriptive and whilst we do follow the same songs, actions and sequence of learning the sounds, we want to excite and encourage children and so by mixing it up with some magnetic fun in fishing for things beginning with the sound ‘s’ or cooking ‘sizzling sausages’ on the fire in the garden we hope to respond to a variety of different learning styles. 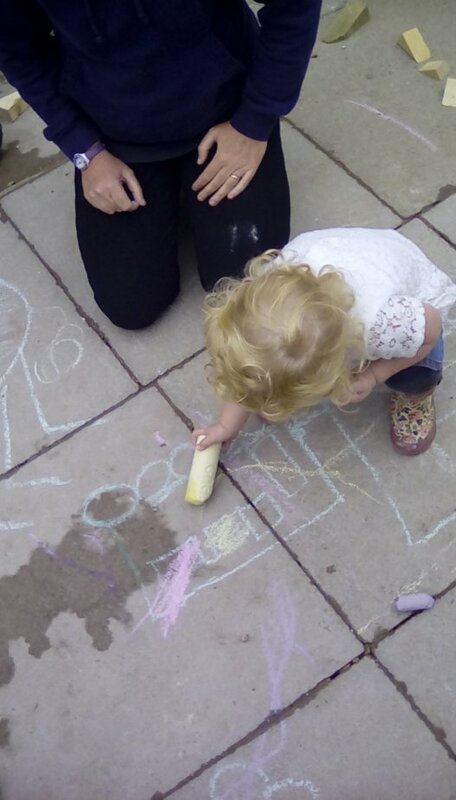 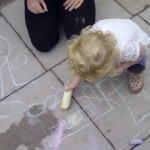 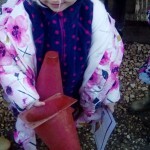 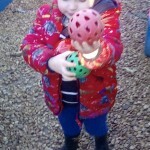 Active maths took place in the garden with the Shooting Stars trying to find and name certain 3D shapes. 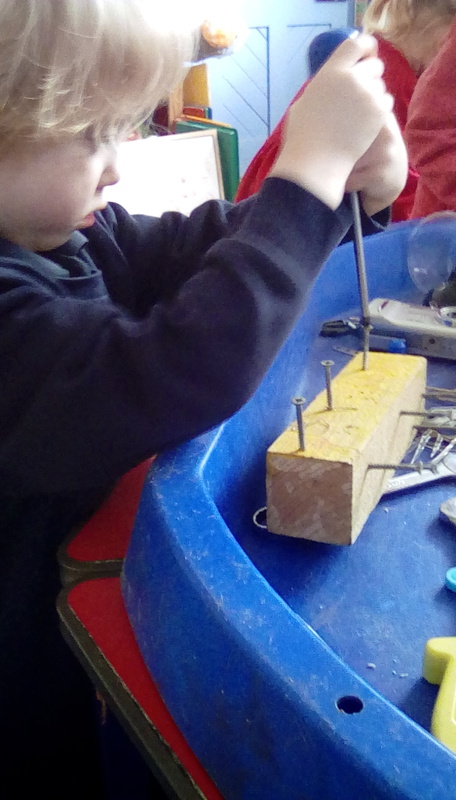 They were very successful in discovering spheres, cylinders and cones. 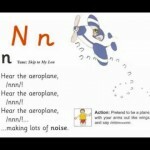 This is something you can easily help your children with when out and about. 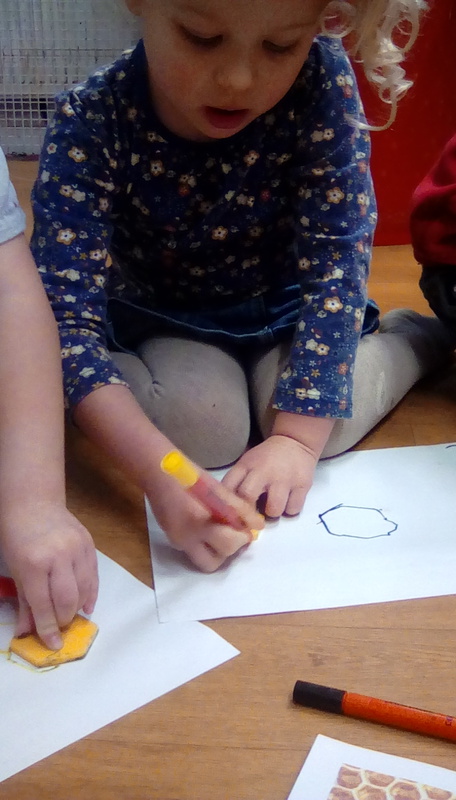 Make sure you use the correct terms for differentiating between 2D and 3D shapes. 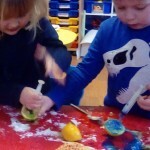 Finally we’ve been actively learning through making our own explorations and discoveries, as we’ve investigated the effects of reactions: chemical reactions of mixing bicarbonate of soda with lemons (lots of lovely smelly bubbles :)) and what happens to ice as it melts or what we can do to it to speed up the melting process. 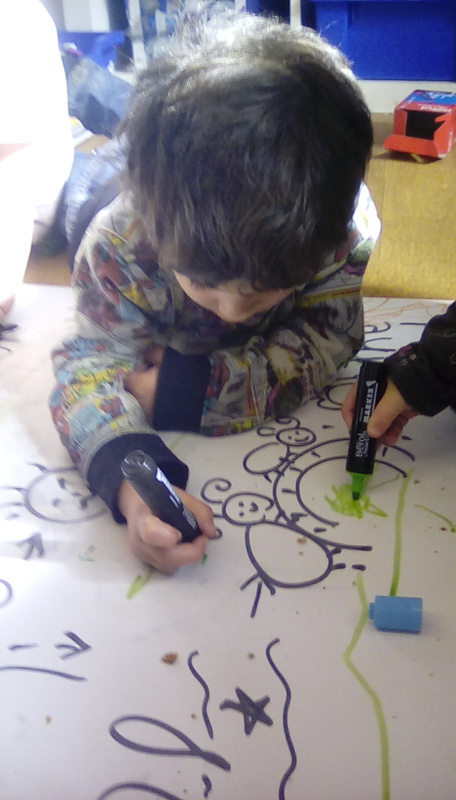 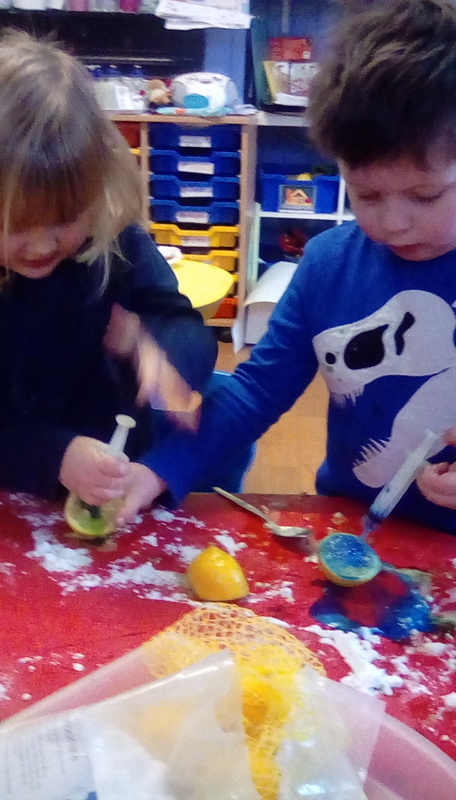 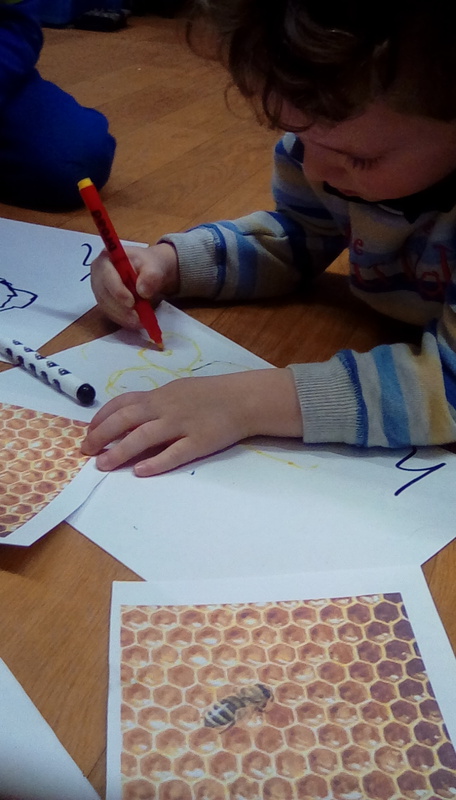 Children were able to make their own learning extensions by adding colour to the lemons and found out about different types of animals that might live where it is cold. 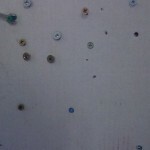 Welcome back Shooting Stars! 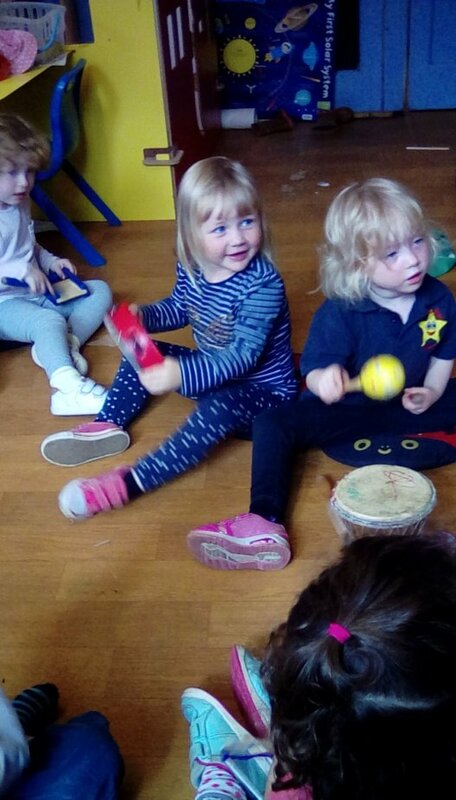 Following our term of embracing the Nativity and the songs that accompanied it, we will definitely be using the chidlren’s love of song and music again this term, bringing ideas of their own from home plus a mix of music from other genres, countries and styles. 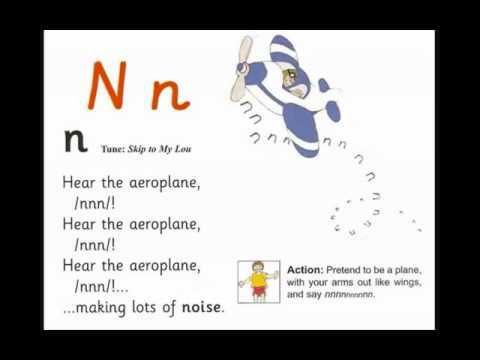 We do kick off of the journey through Jolly Phonics this term and you can read more in the letters and information below. 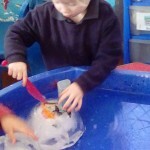 This is still all about fun and not formal learning. 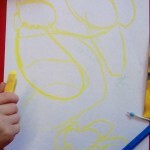 You won’t see a work sheet or any tracing (tracing is tracing not writing!). 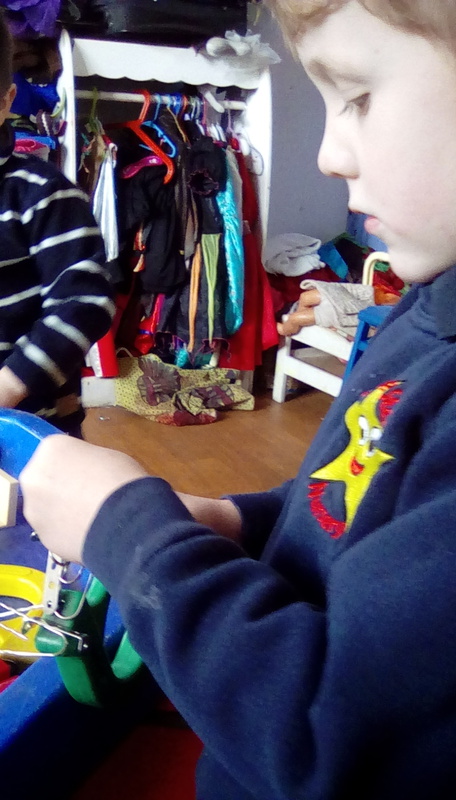 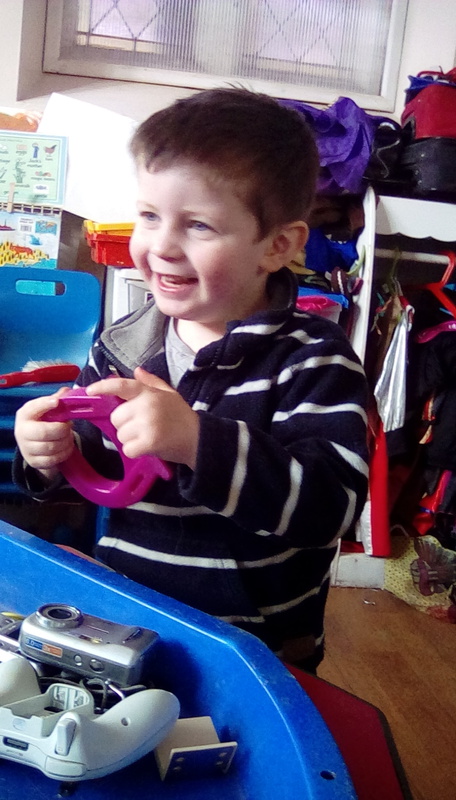 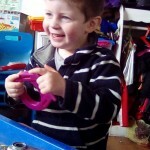 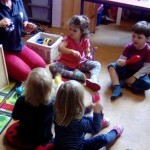 We have fun sessions that make links across their learning and play with sounds and letter formation. 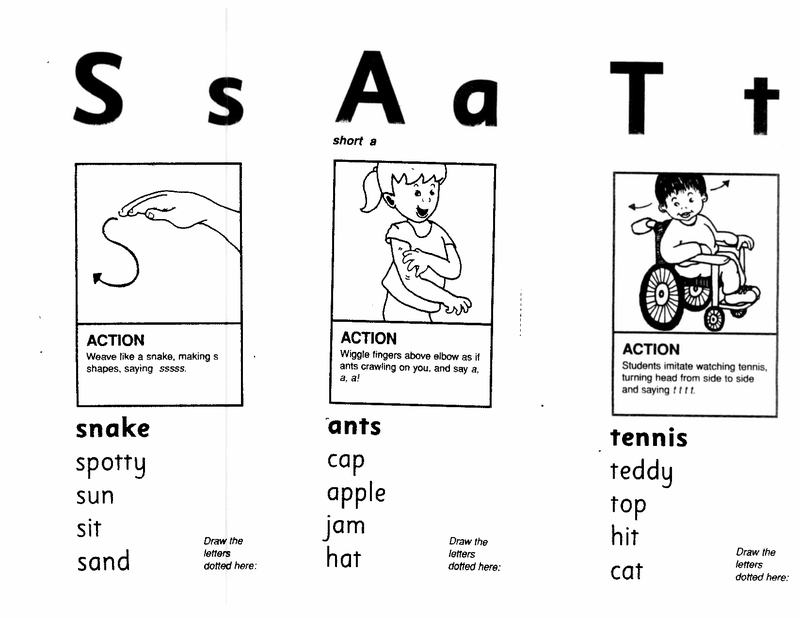 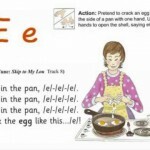 Below also are the actions for the first set of sounds that we will be learning this term as well as a link to a video to share the songs at home as well as know the correct pronunciation (although these are in alphabetical order and not the order in which we learn them which does the jolly phonics order). 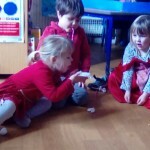 Our ‘Active Story’ this term is The Little Red Hen which teaches the moral of helping others! 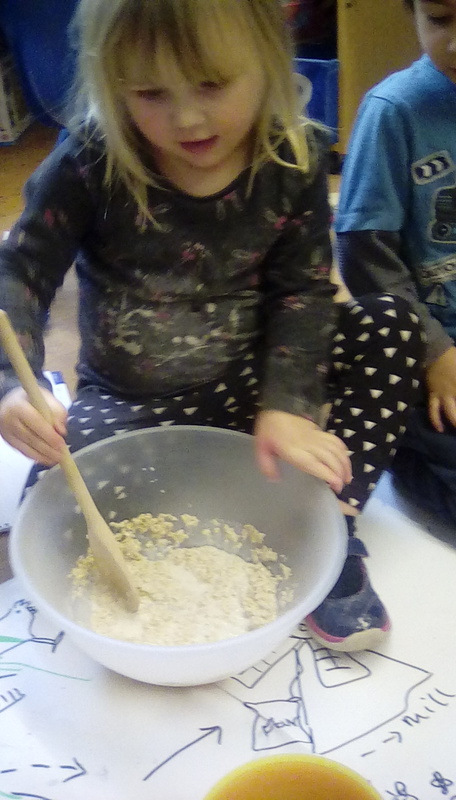 We also get the chance to link it with lots of our own bread baking. 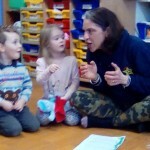 For those who need reminding I have shared again more information about story making. 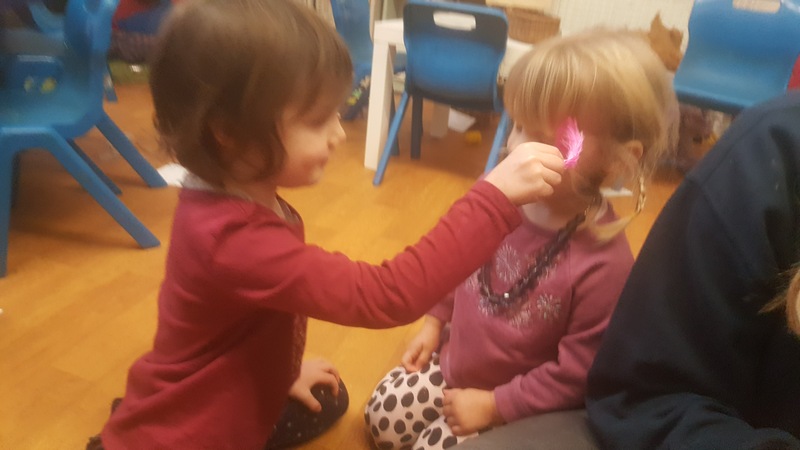 Mindful moments (see below under last term) will continue to feature as part of our morning routines, along with the timetable and ‘get up go’. 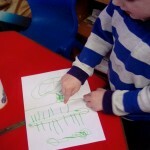 This half hour at the start of every day in itself covers so many areas of learning and development as the children see adults modeling writing for the timetable, talk about numbers for the date, learn to listen to each other, talk about what we hear, use movement in different ways, think how other people are feeling and their points of view and use a range of materials in creative ways. 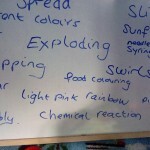 It’s not rocket science (although there might be a bit of that thrown in), it’s all fun. 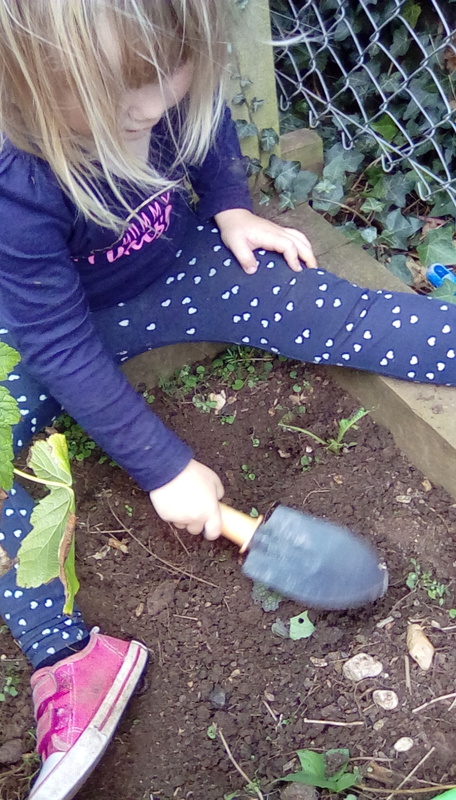 As ever there will be much outdoors play, in the garden and off site and of course and most importantly following your own children’s interests and passions. 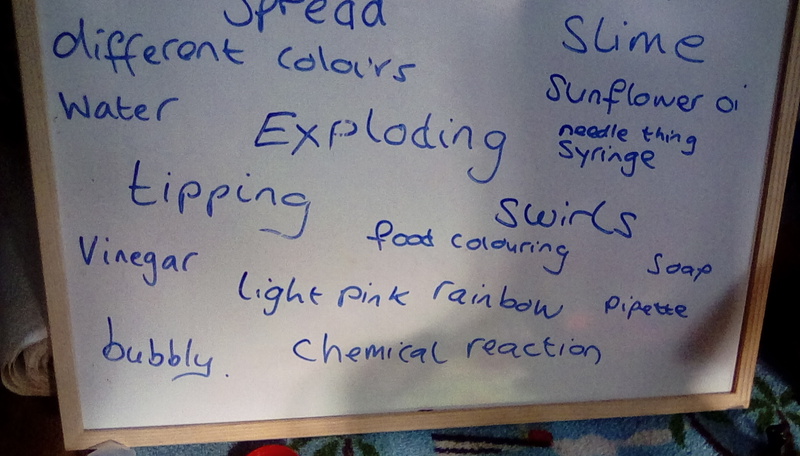 Do feel free to share all and any of these with us at parent meetings as they are all that matters. 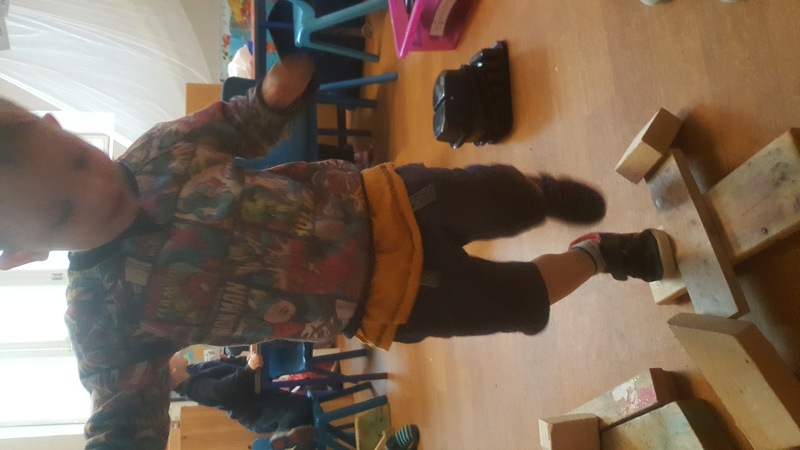 Let’s get going!!!! 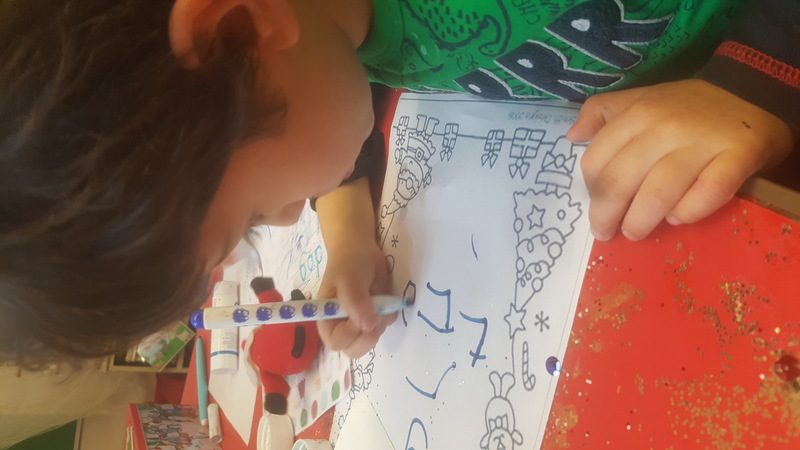 December of course means one thing…Christmas and I think many of you have already been hearing snippets of nativity songs being practiced at home. 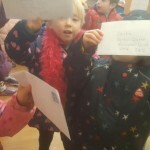 The Shooting Stars have been authors of their own nativity play this year, without giving too much away as their song choices have been included as much as possible. 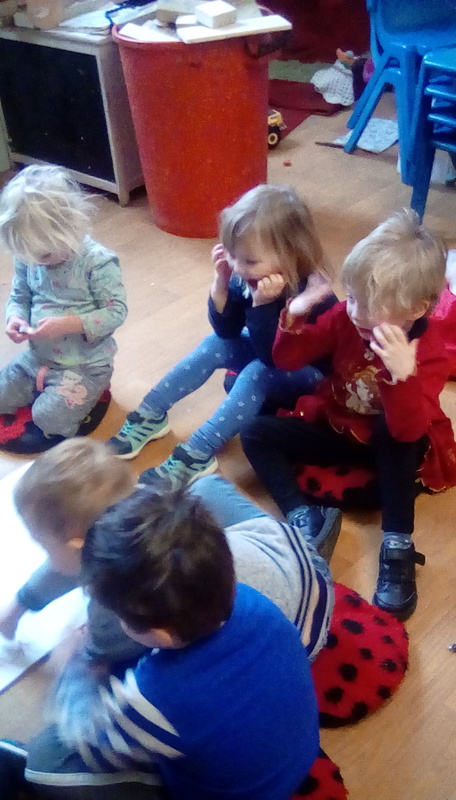 The enthusiasm for entering into the singing, the performing and dressing up is high and it has also helped them to understand the story of the nativity. 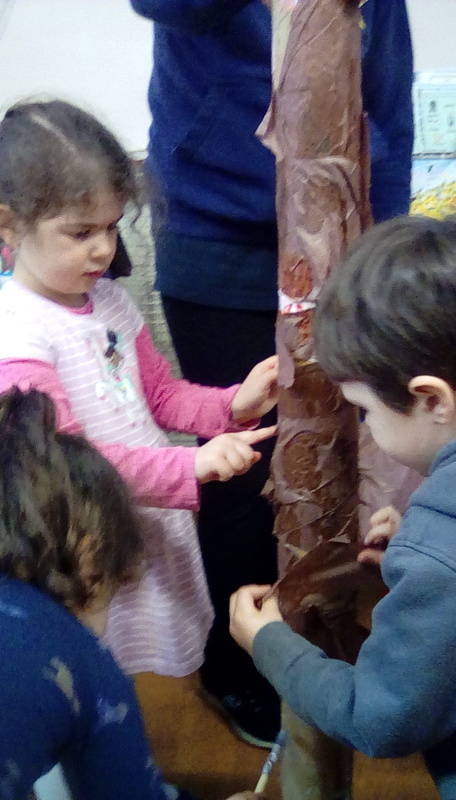 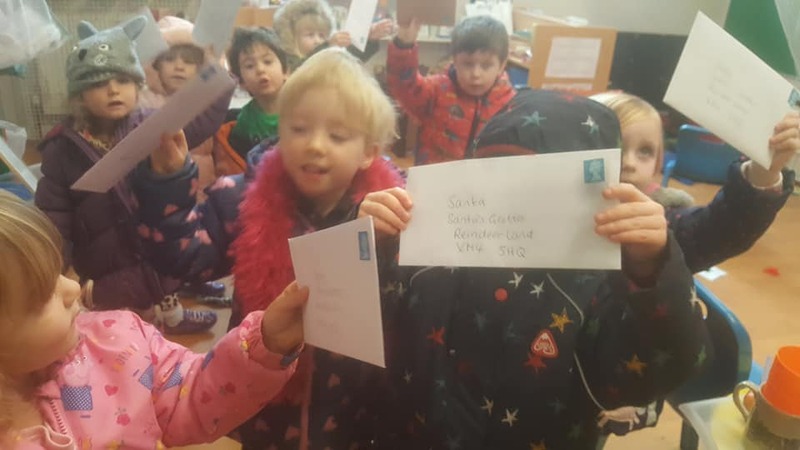 However Christmas is not the only festival that is celebrated at this time of the year and at the start of the month the Shooting Stars learnt about the Jewish festival of Hannukah and the story of 3 years of fighting held their interest. 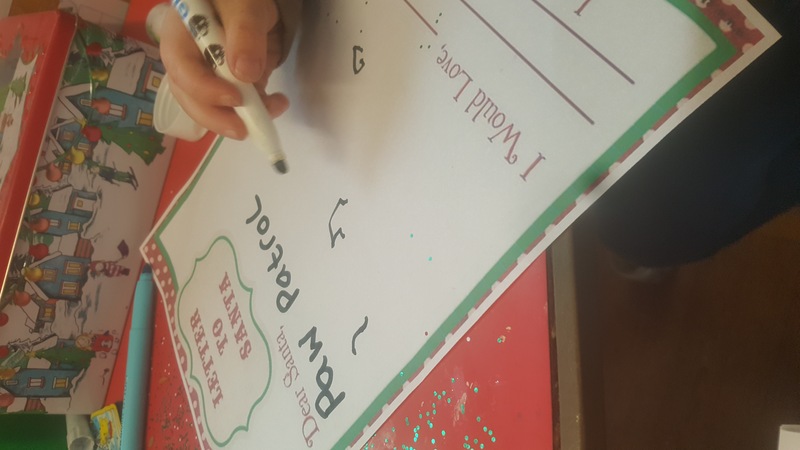 We’ve also been creative in sending some glittering letters to Santa which gave us the chance to use our emergent writing skills. 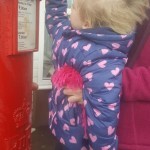 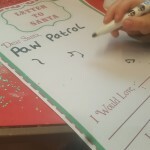 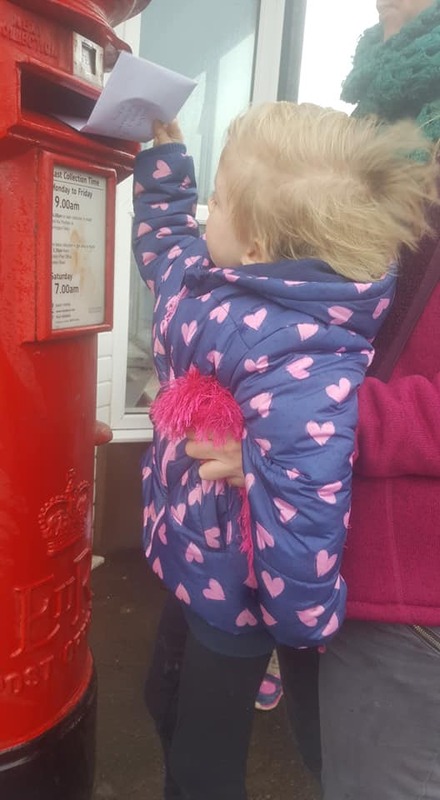 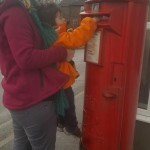 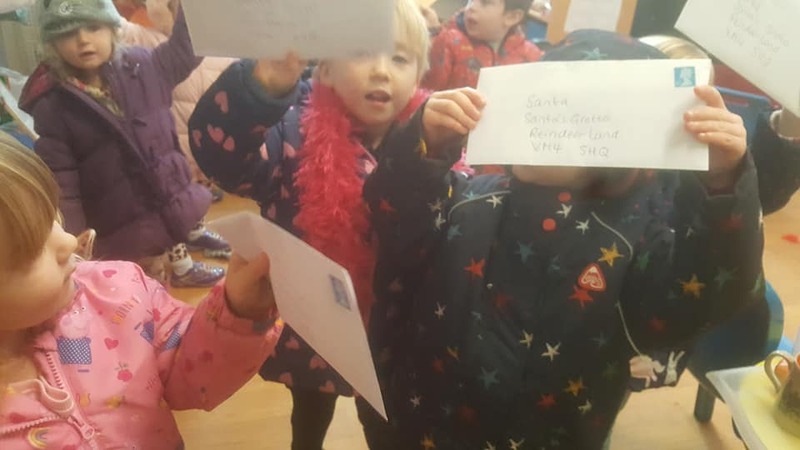 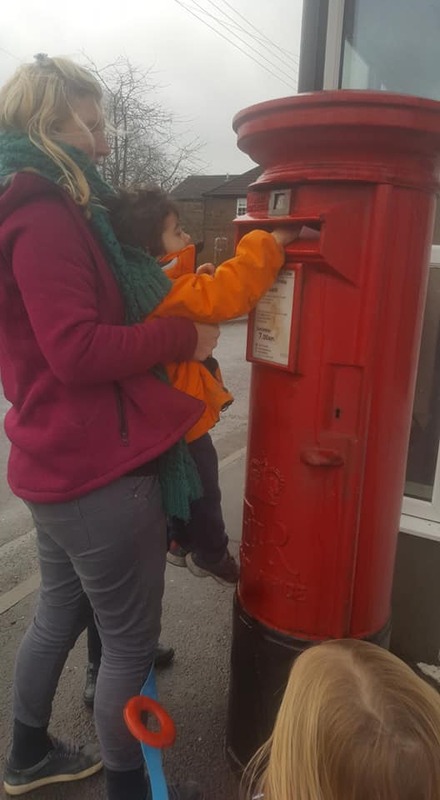 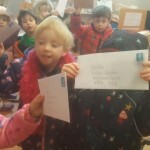 Look out for your replies from Santa in the post! 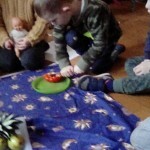 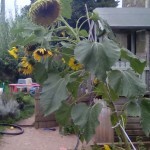 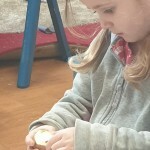 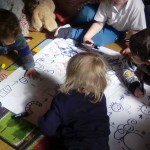 We have been using practices from ‘Sunshine circles’/ thera play in our daily routines for some time now and these have been used successfully in our morning ‘timetable’ half hour at the beginning of the day, as has been reported before, and on the Rising Star page where we talked of mindful moments. 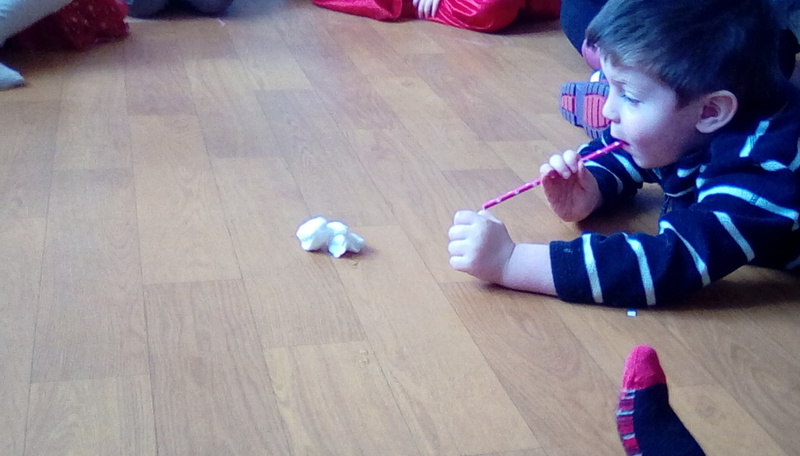 Over the last couple of weeks we have been exploring these mindful moments with the Shooting Stars. 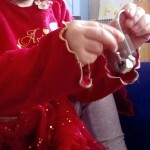 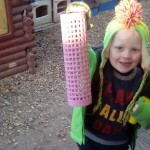 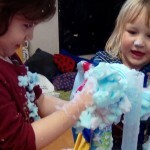 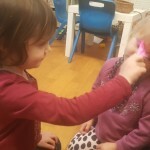 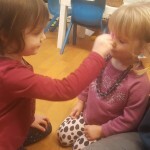 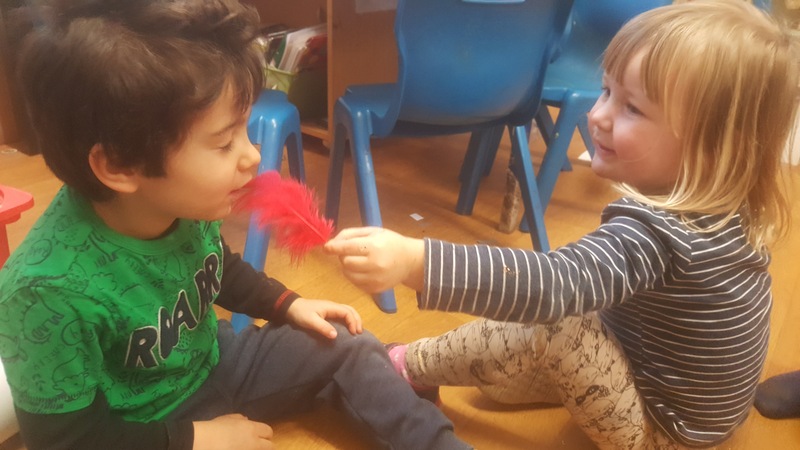 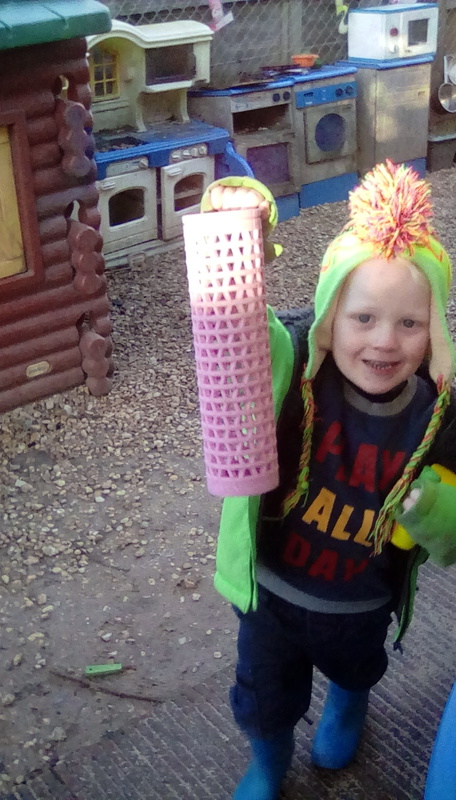 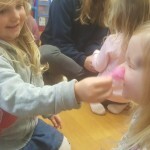 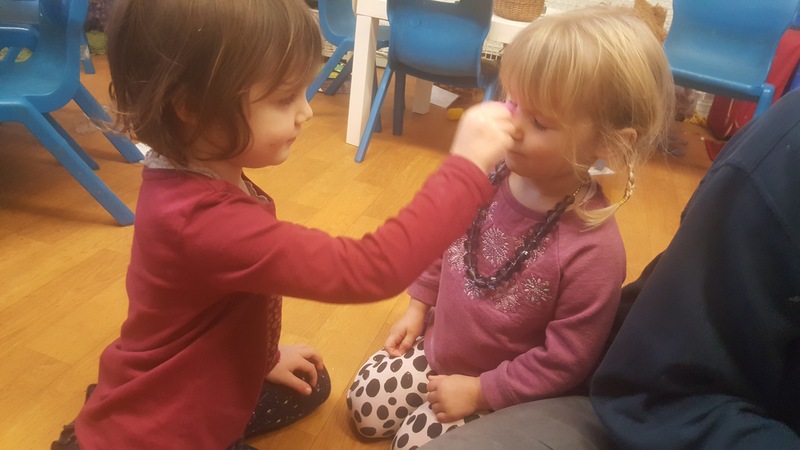 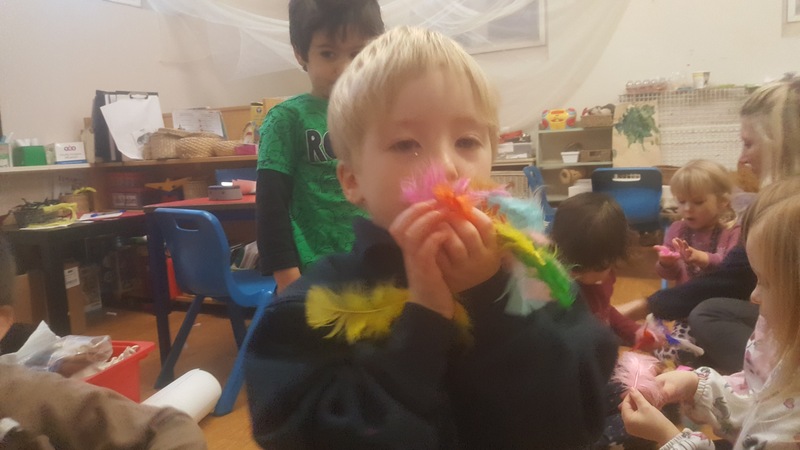 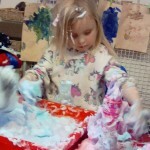 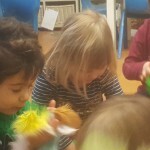 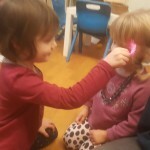 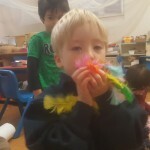 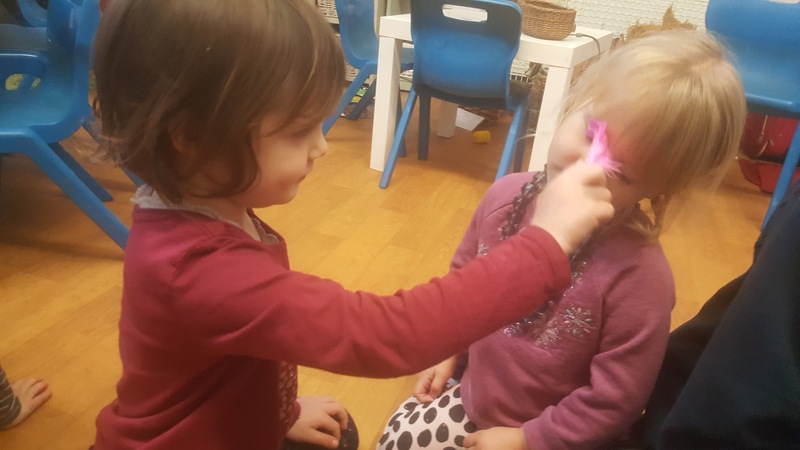 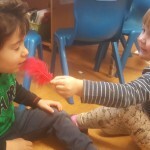 The idea of these short periods is that they can share an experience as they want to, playing with bubbles for example or feathers. 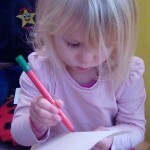 There are no “outcomes”, no expectations, no learning goals. 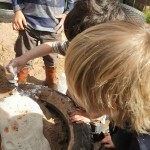 It is there just for the children to wallow in their own moments. 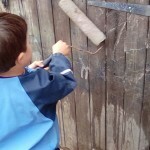 We all know that it is far easier to be motivated when we are doing things that…well motivate us! 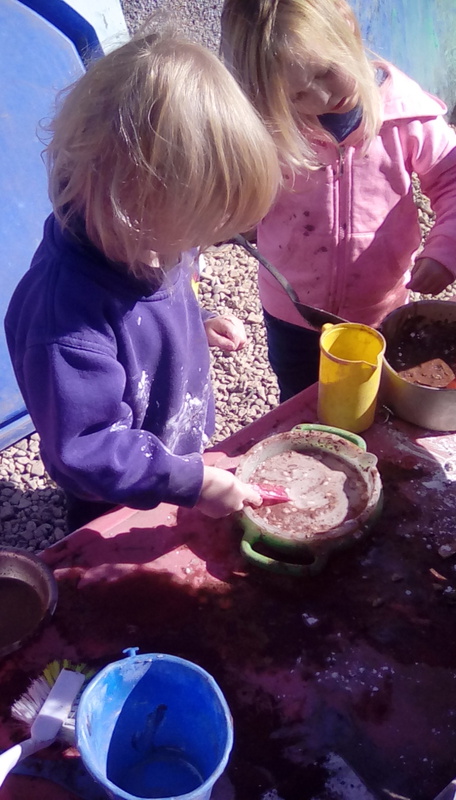 This is why we work with you and the children in planning for their interests first and foremost and making play and learning relevant. 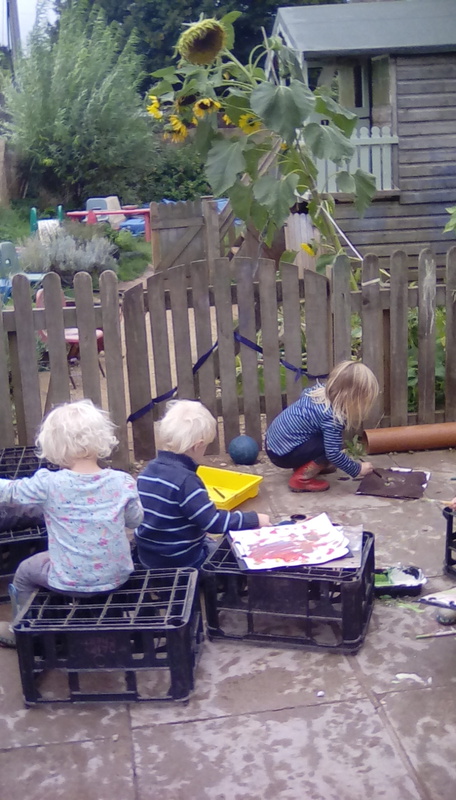 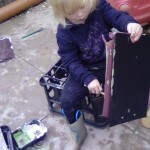 This means for many learning and playing on a practical and active level, hence the creation of our work shop in the garden. 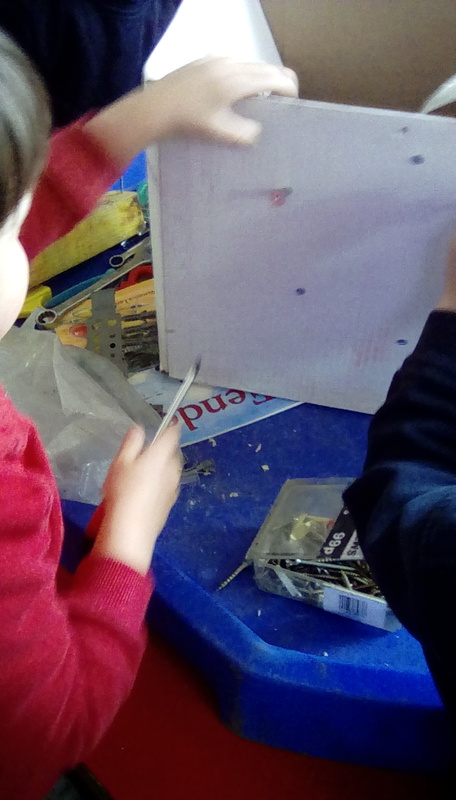 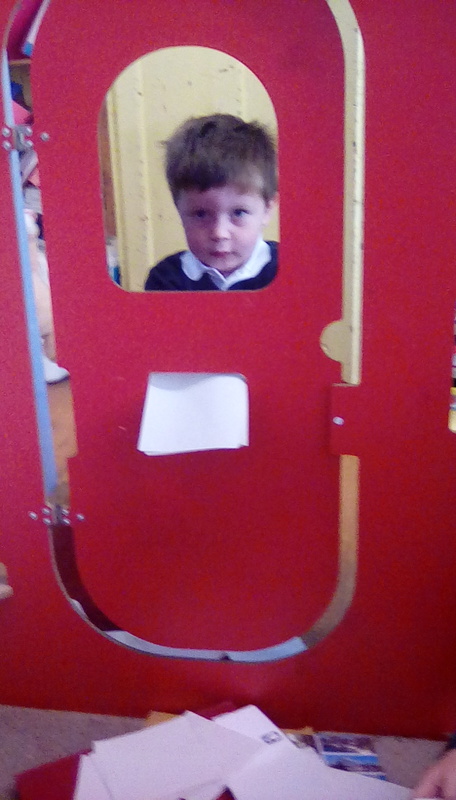 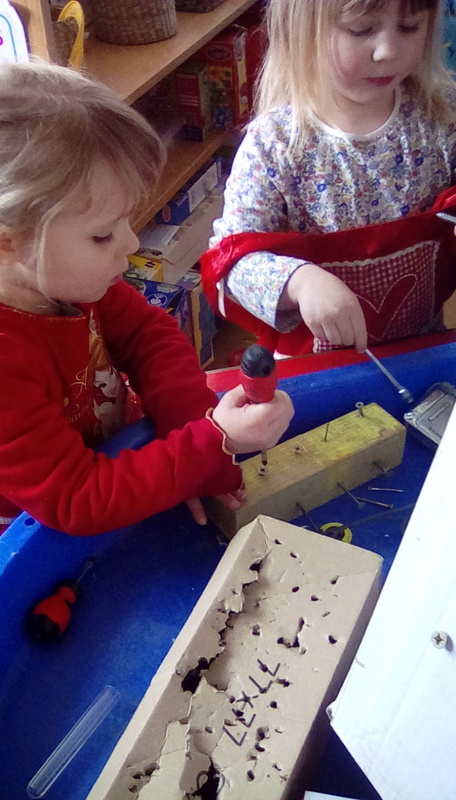 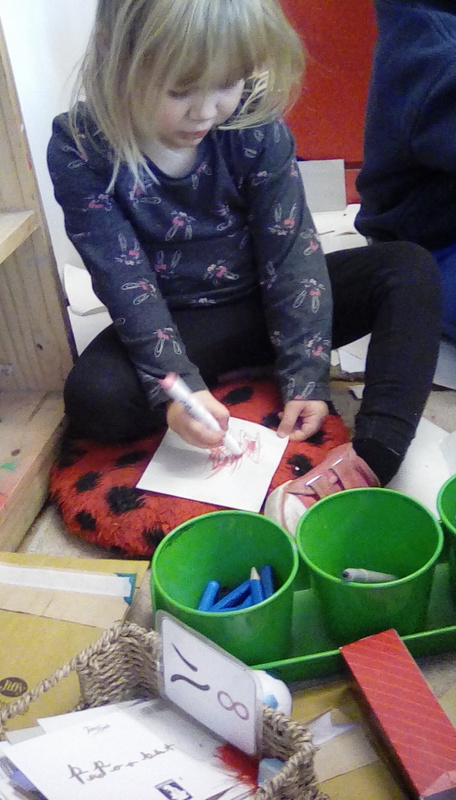 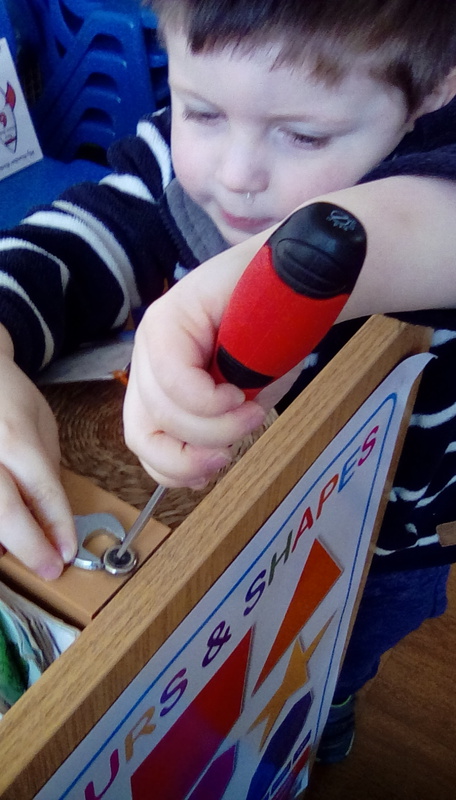 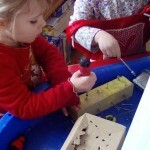 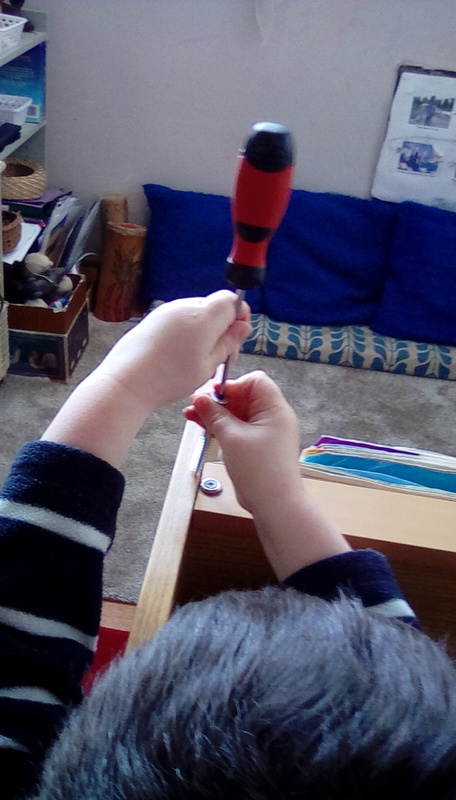 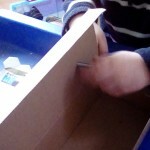 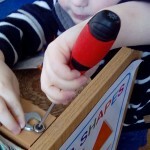 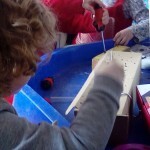 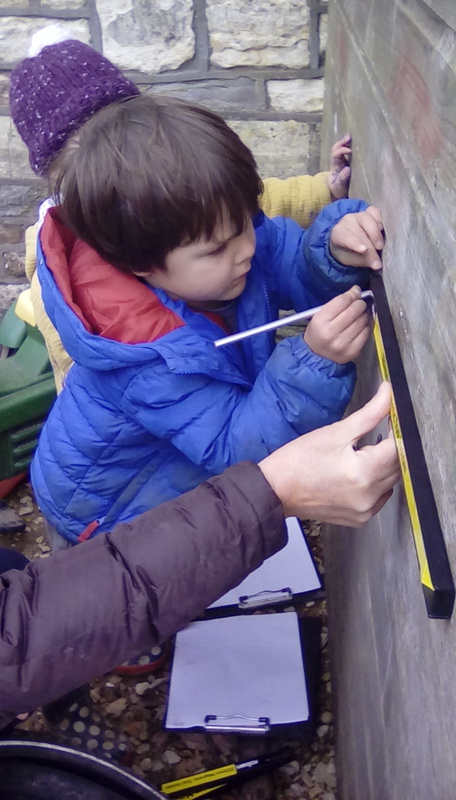 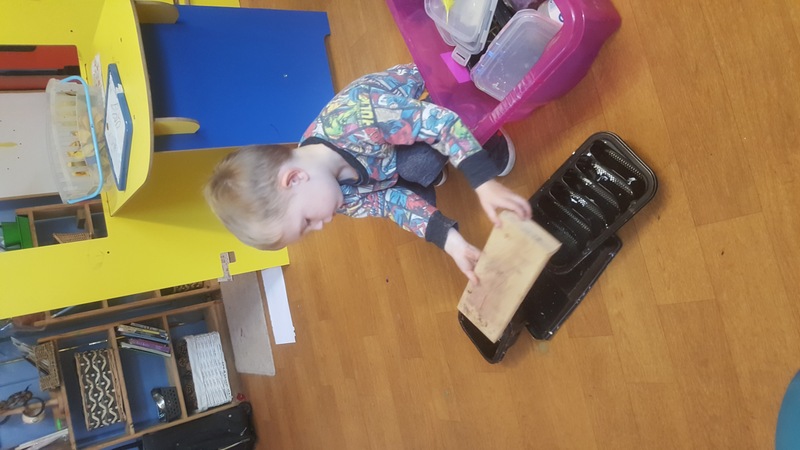 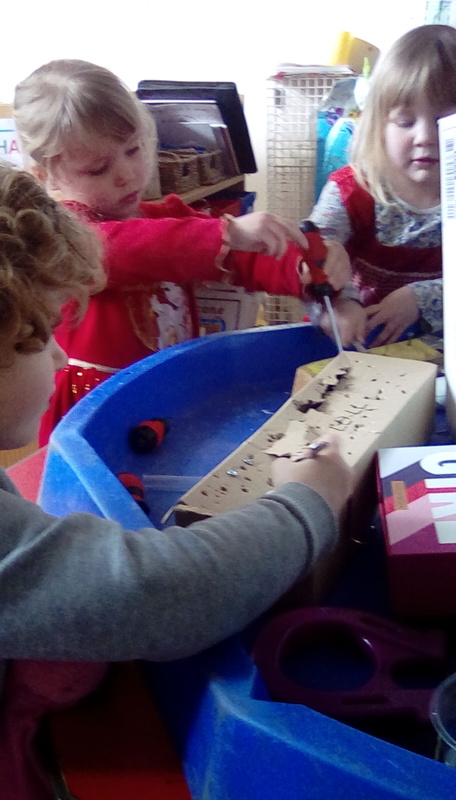 Vicki was helped in putting up storage units and magnetic strips for tools last week as they used mathematical ideas and mark making to bring their learning to life. 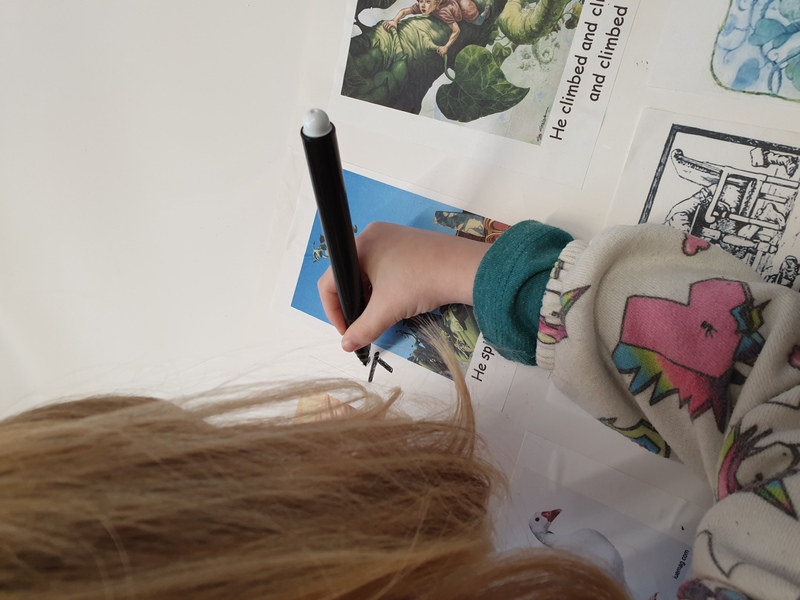 With Christmas approaching (and with that rather a lot of time spent on the nativity story), rather than having one story that takes us through the term, we have been adapting and adopting active story making to many books and stories. 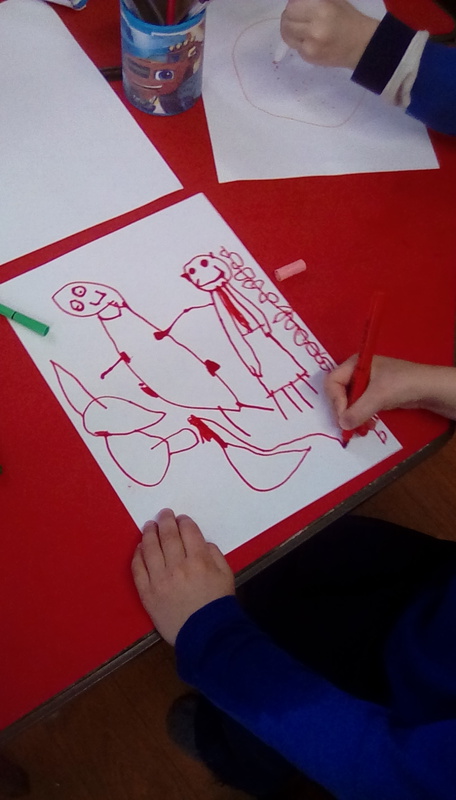 You will read on the main page our interpretations of the Diwali story of Rama and Sita (always popular with our Shooting Stars, having characters such as the monkey king and Havana, the evil warrior king!) 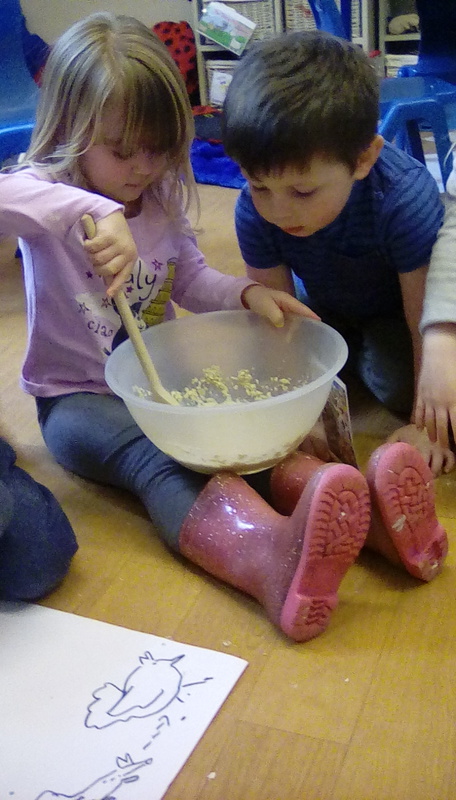 and we have also been bringing some classics to life: Rosie’s Walk and Goldilocks. 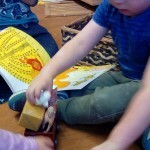 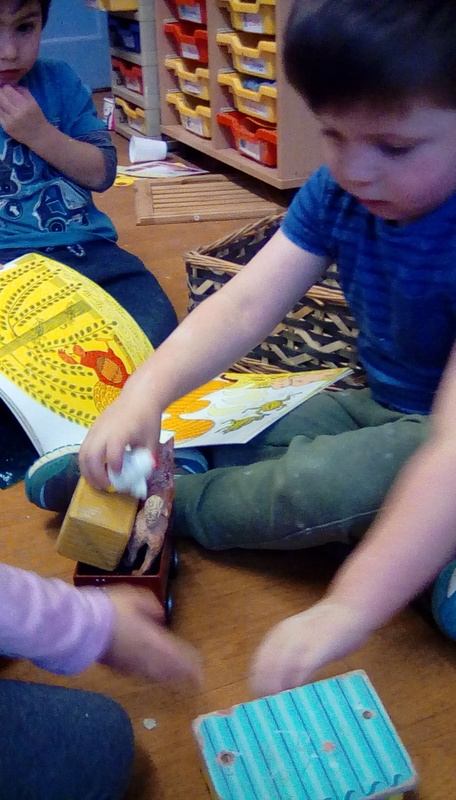 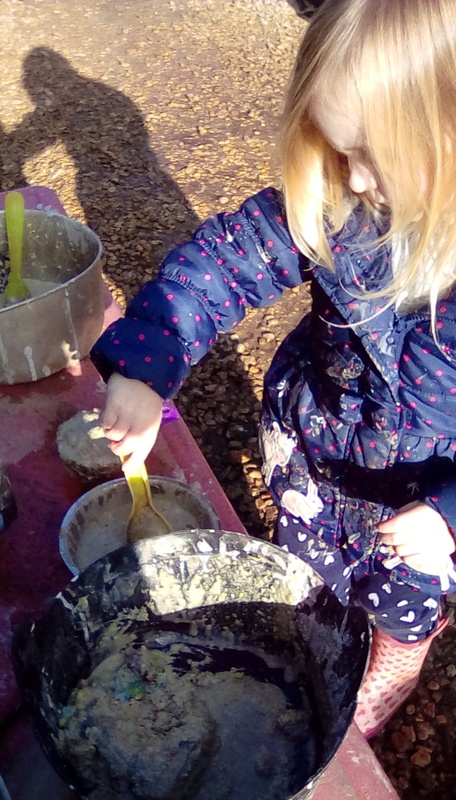 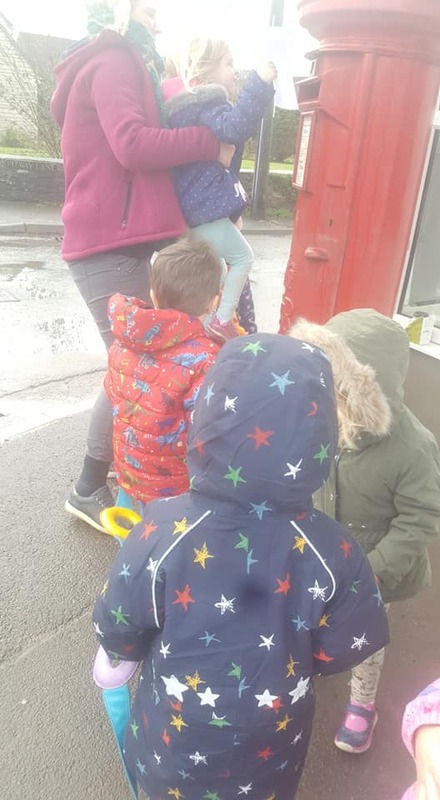 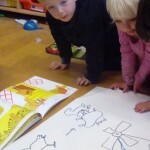 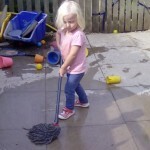 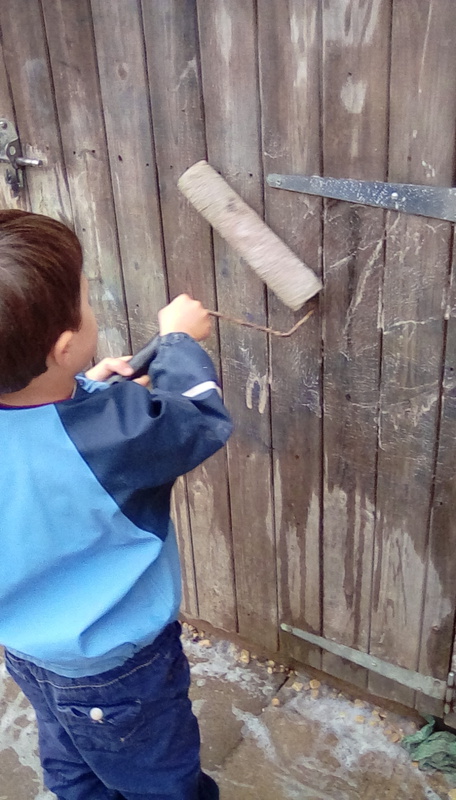 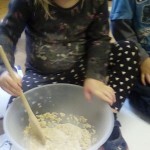 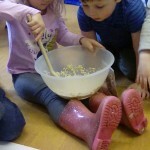 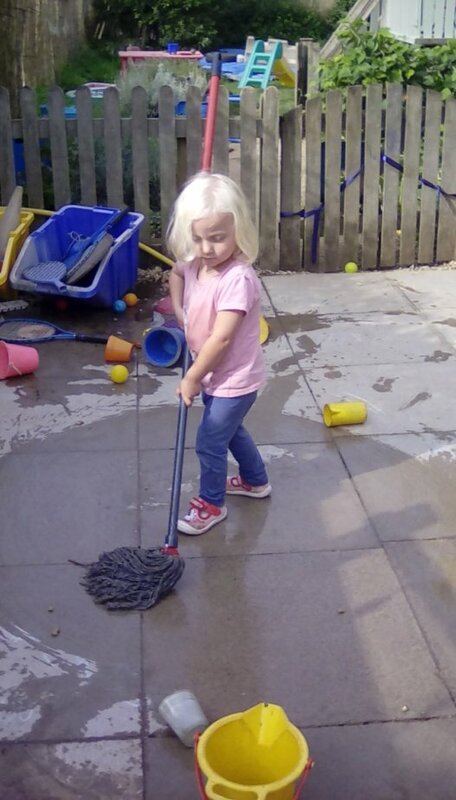 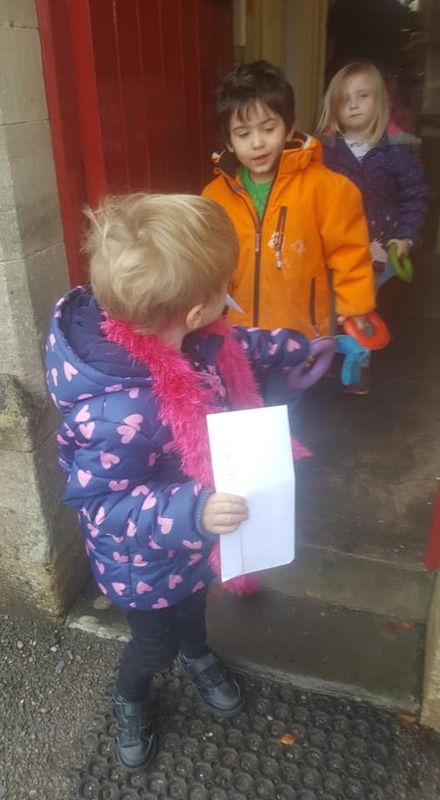 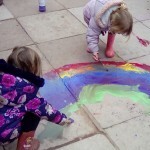 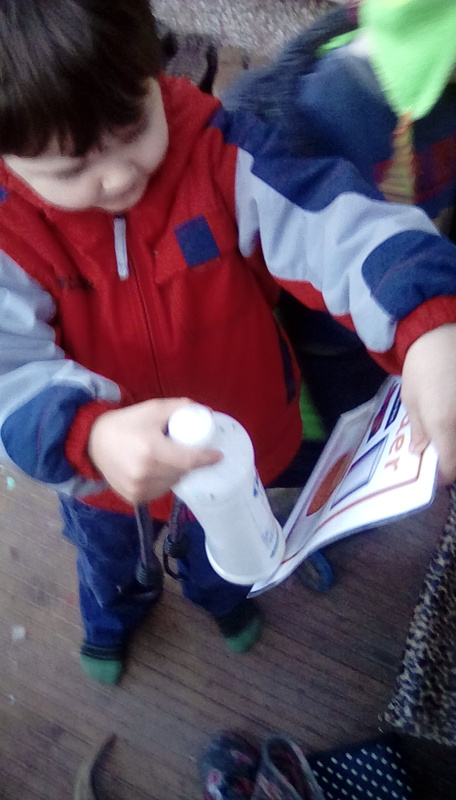 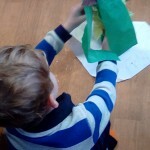 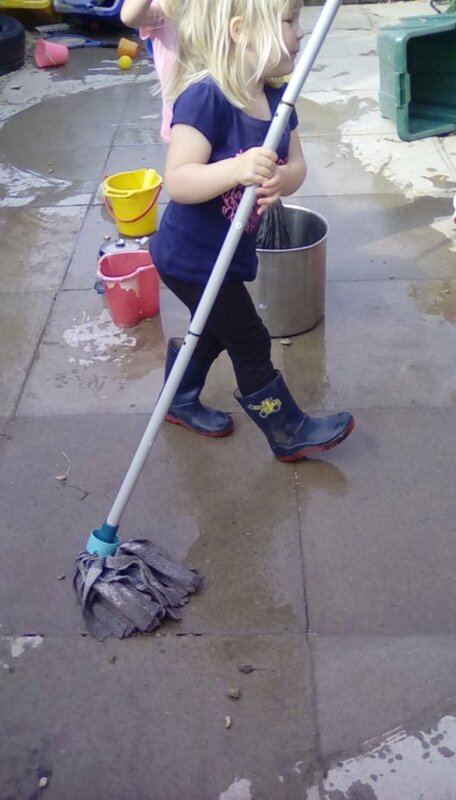 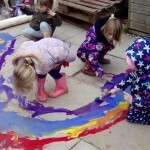 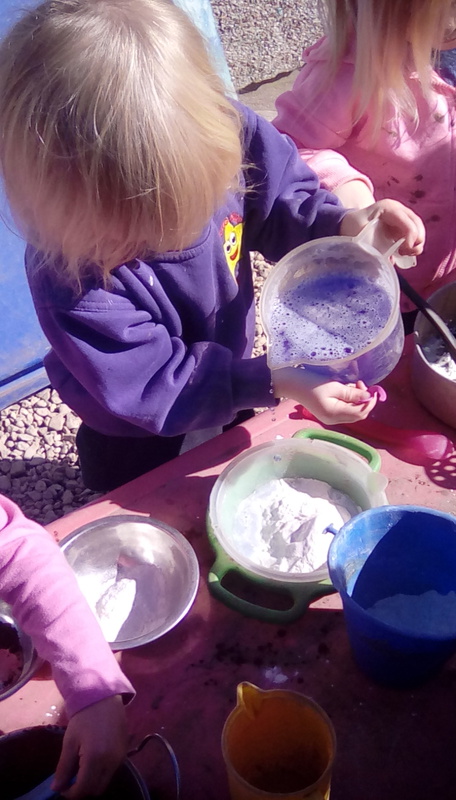 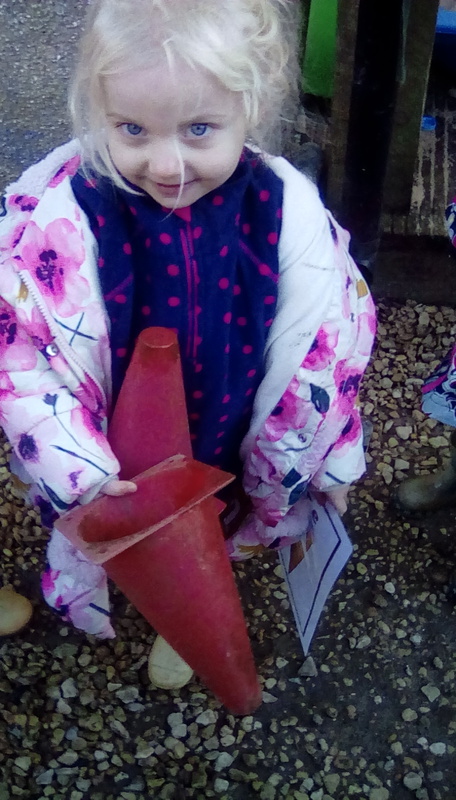 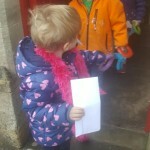 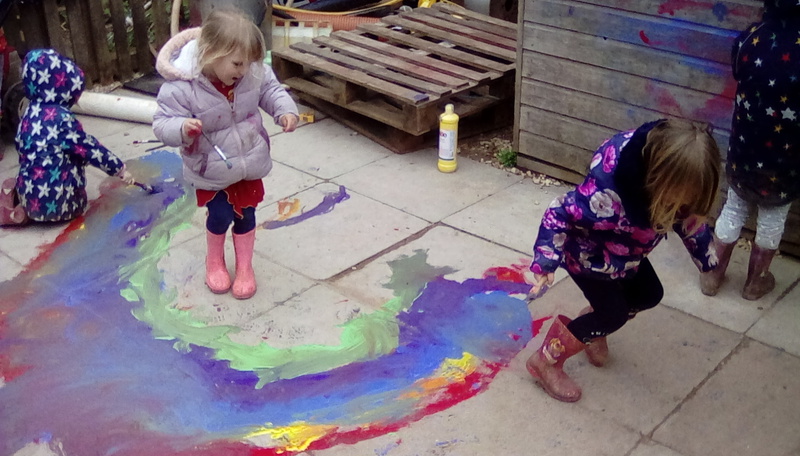 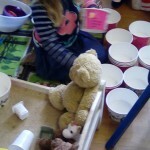 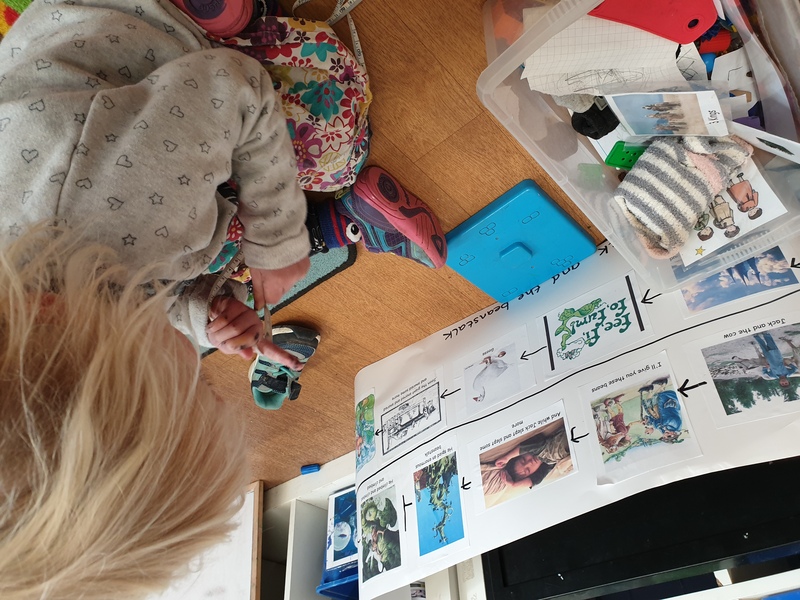 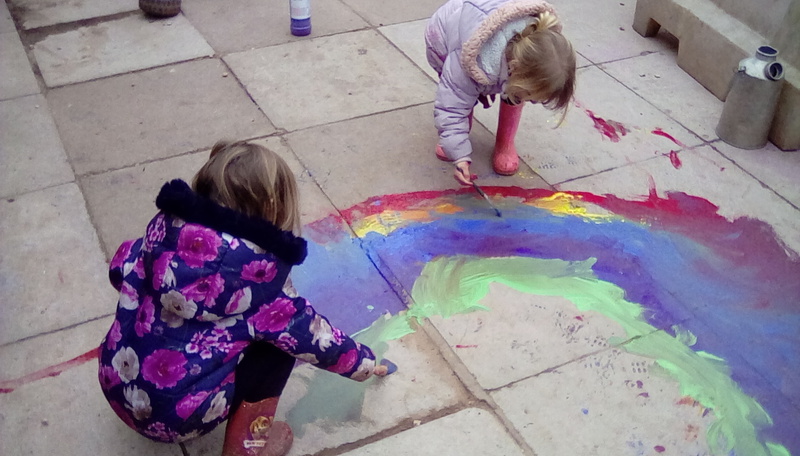 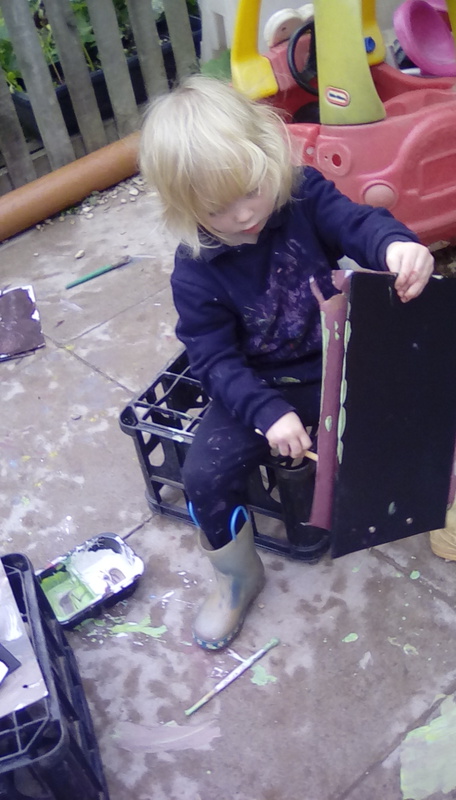 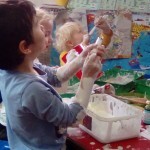 Combining many techniques of using props, books, story maps, actions and even making our own porridge (both inside and outside the the garden kitchen), the children have been able to find a form of expression that suits them. 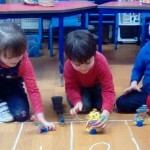 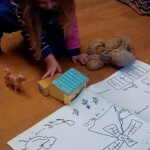 Observing them using these techniques in their free play is the most affirmative proof of the value of story. 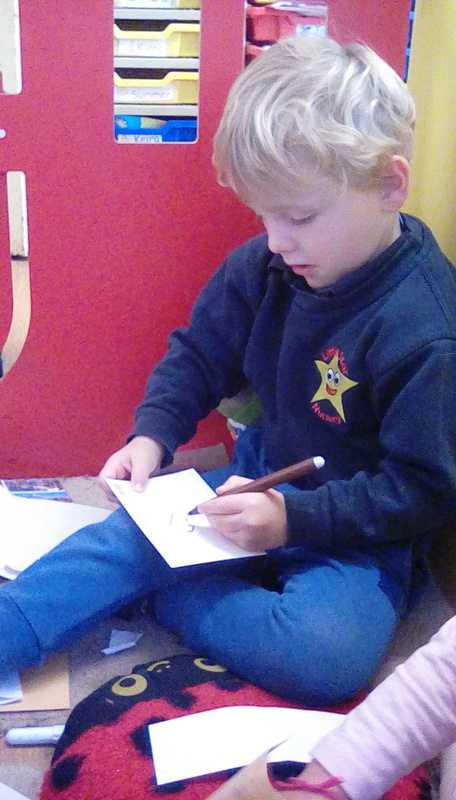 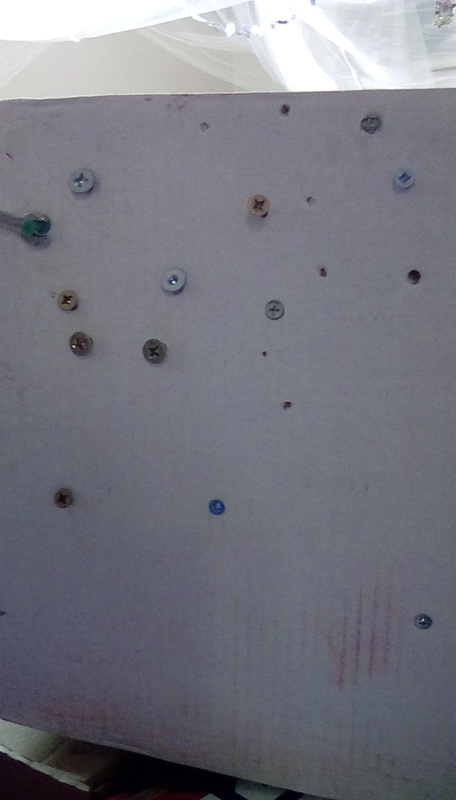 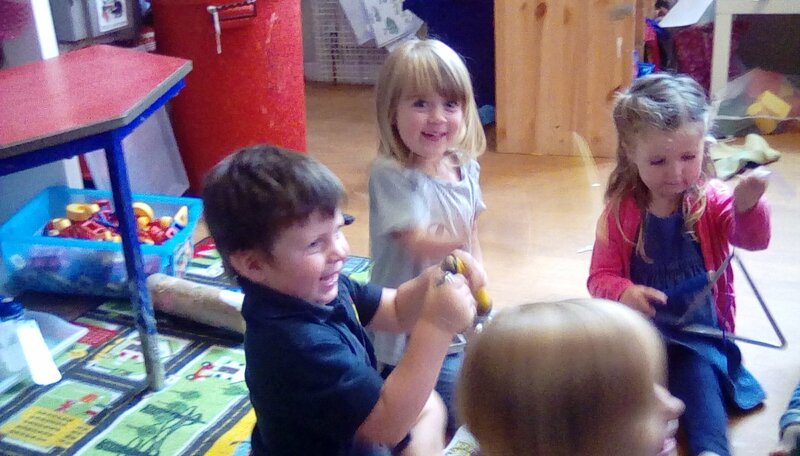 We are just a month into the new term and our pre school Shooting Stars have made a sparkling start! 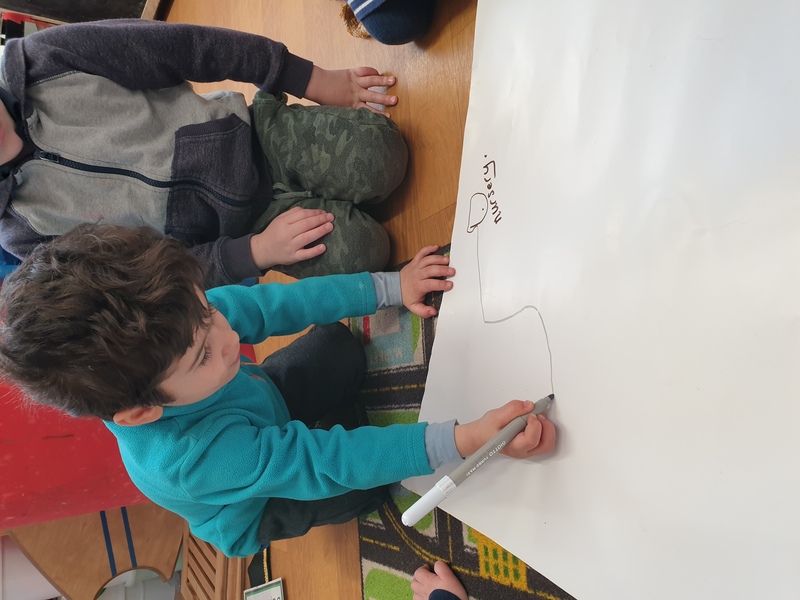 We have been getting active with our new story of The 3 Billy Goats Gruff, developing our literate journey as we practice tuning in to sounds to extend listening skills and “write” our own story maps. 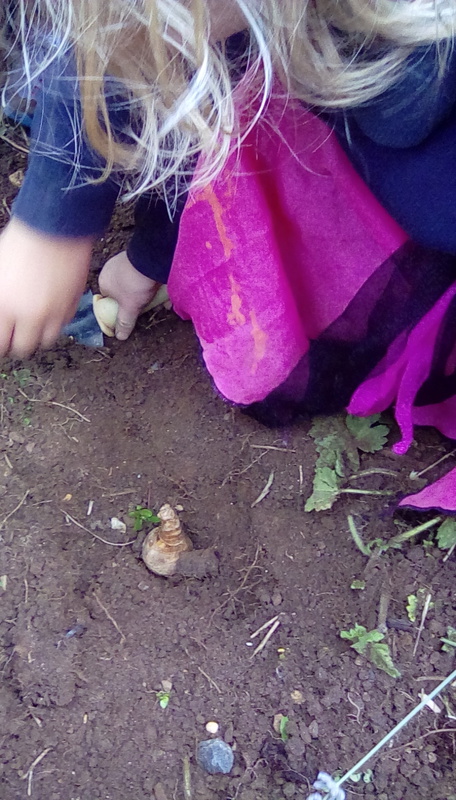 We’ve been out and about exploring the changes in nature as Autumn approaches, conducting our own experiments and investigations into change, cause and effect. 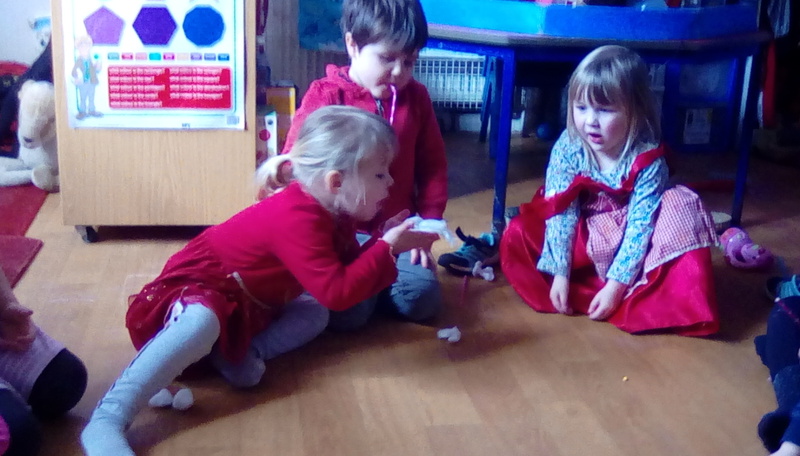 We’ve been postmen, pirates and princesses, we’ve been playing. 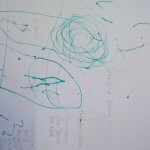 When is a scribble not a scribble? 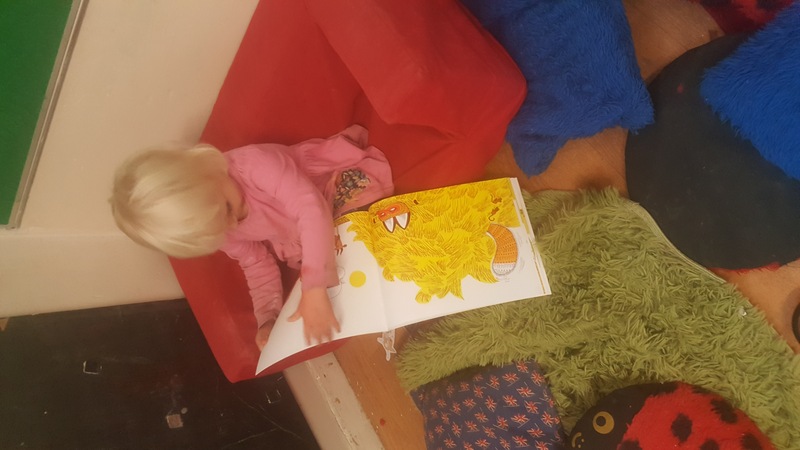 We love books and their value is placed very highly at Little Star (as you will be read on the main what have we been doing? 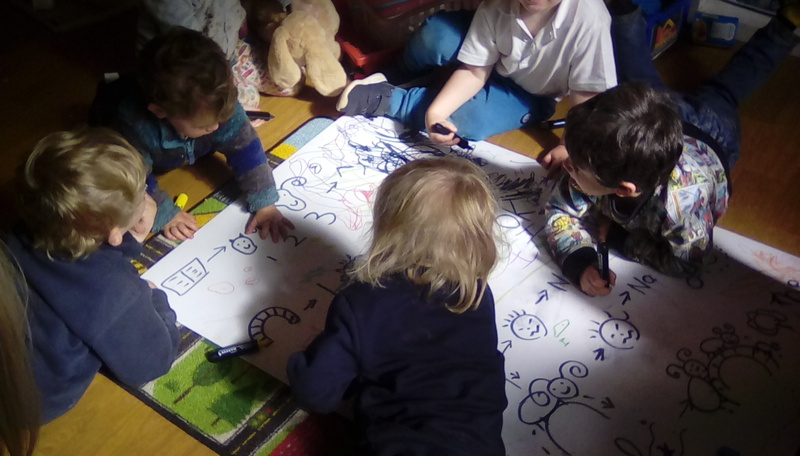 page), however, learning and play is an active process and this is why we embed the styles of Pie Corbett’s ‘Active Storymaking and ‘Talk for writing‘. 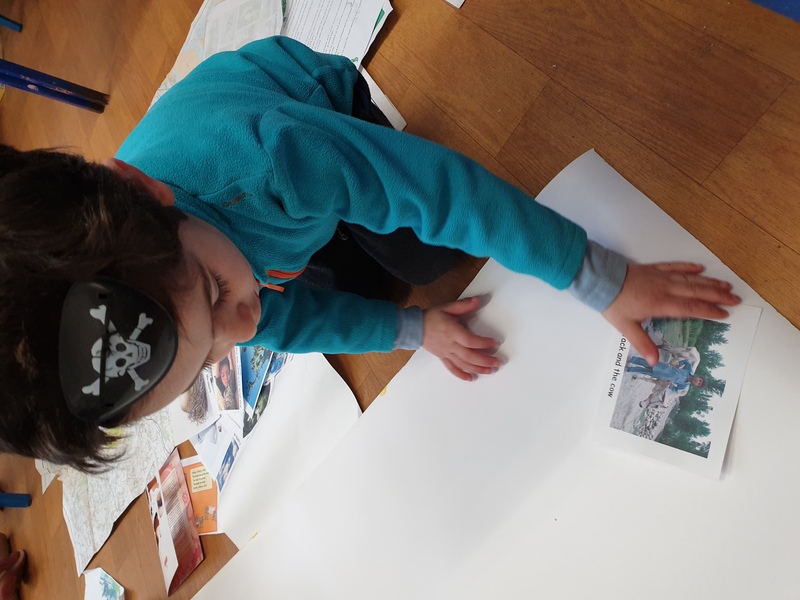 For those new to the concept of ‘Active Story making’ you can read more about its essence and intentions in the letter below but it is a teaching strategy that in my opinion has something for everyone and can be moulded to suit the interests and learning styles of all children. 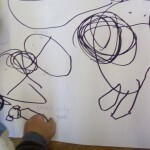 We tend to kick off the term with the 3 Billy Goats Gruff as its beauty lies in its simplicity. 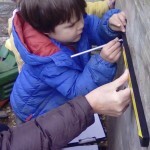 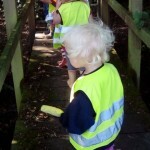 The actions are repetetive and fun, as are the words (“Ok kid, move along!”) and the children can get fully active in trip trapping across the bridge, both imaginatively and across bridges out on our walks. 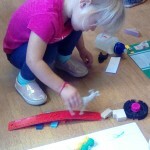 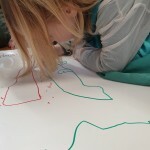 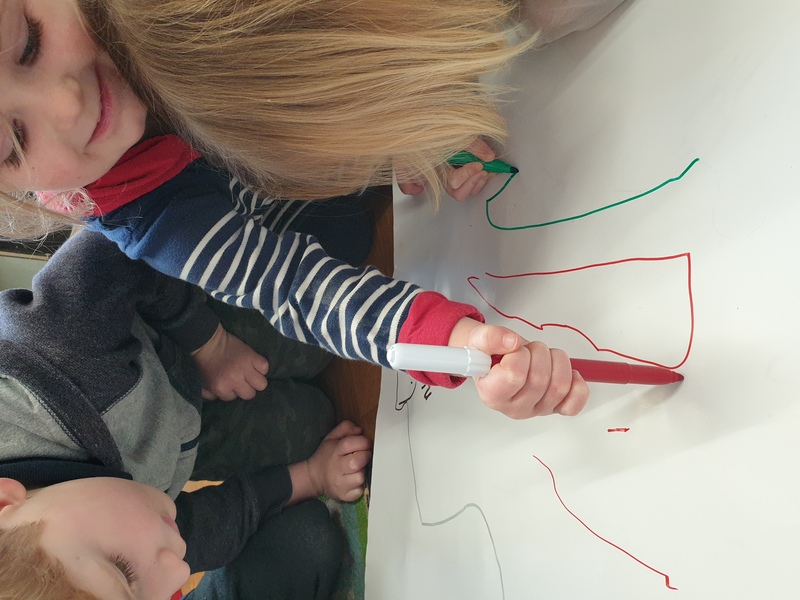 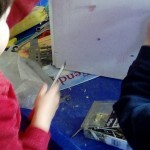 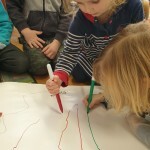 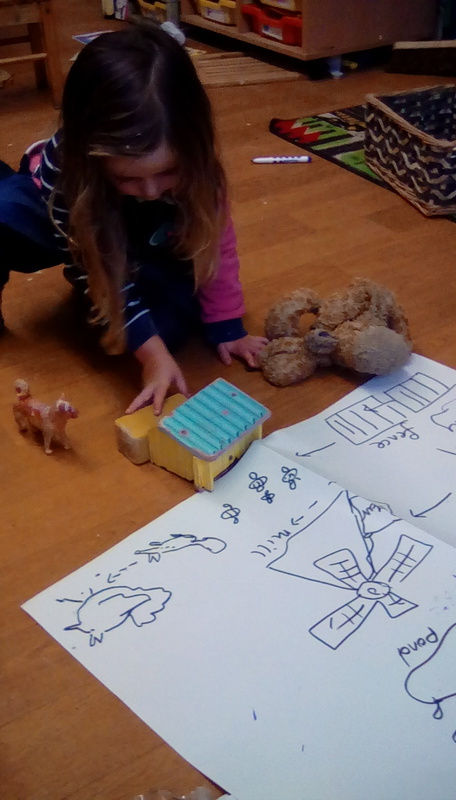 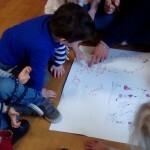 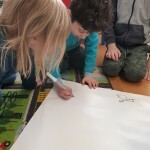 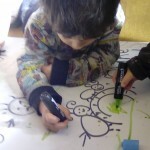 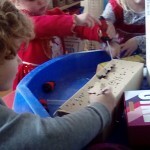 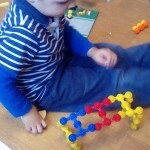 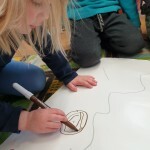 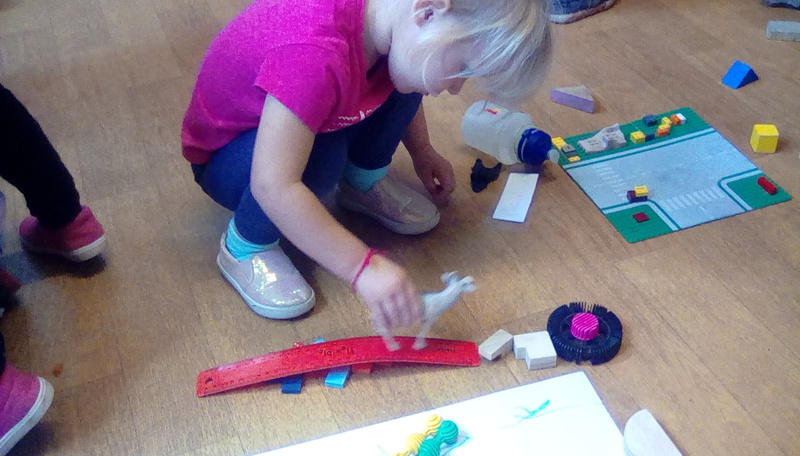 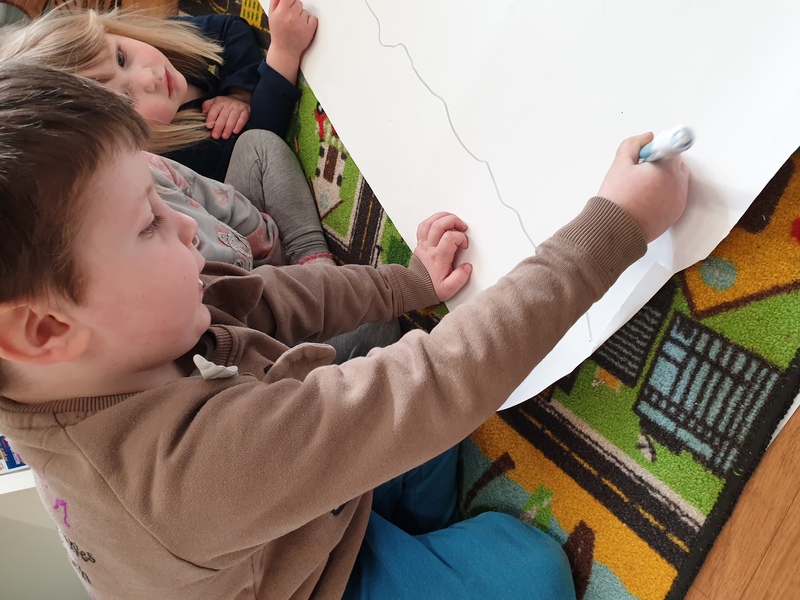 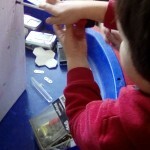 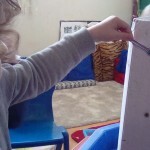 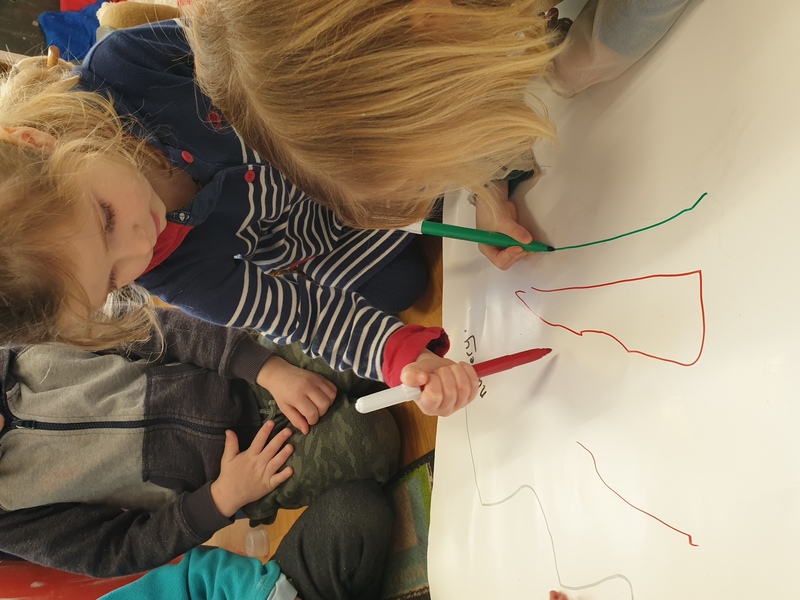 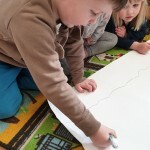 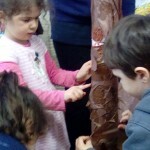 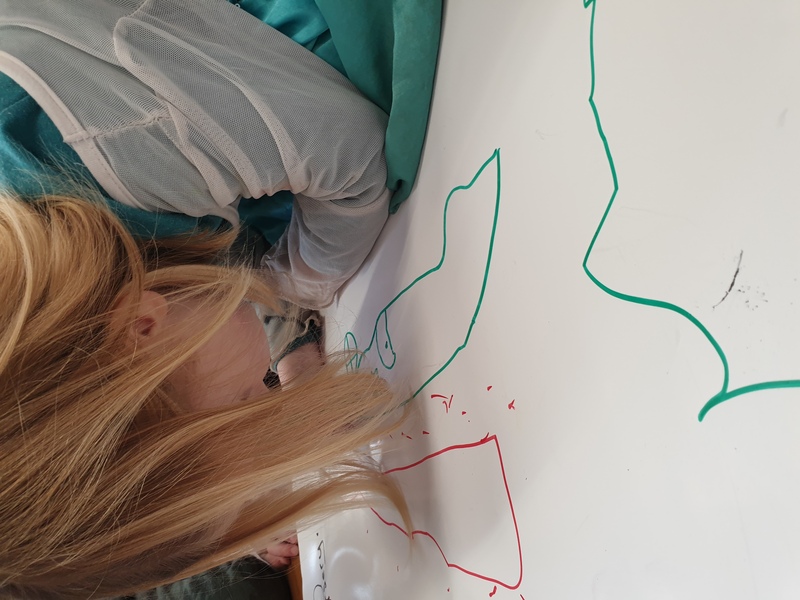 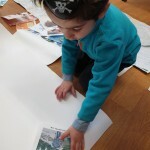 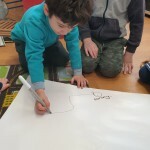 Both in the telling of story orally: with just actions or with props and constructing bridges, and in “writing” as they create their own story maps, the children are becoming literate. 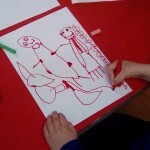 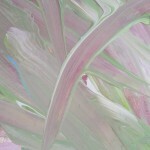 As well as validating “scribbles”, so we recognise all art for arts sake. 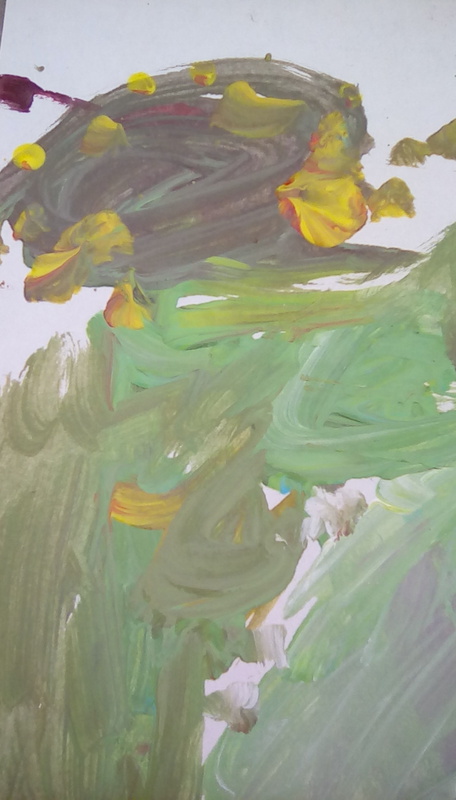 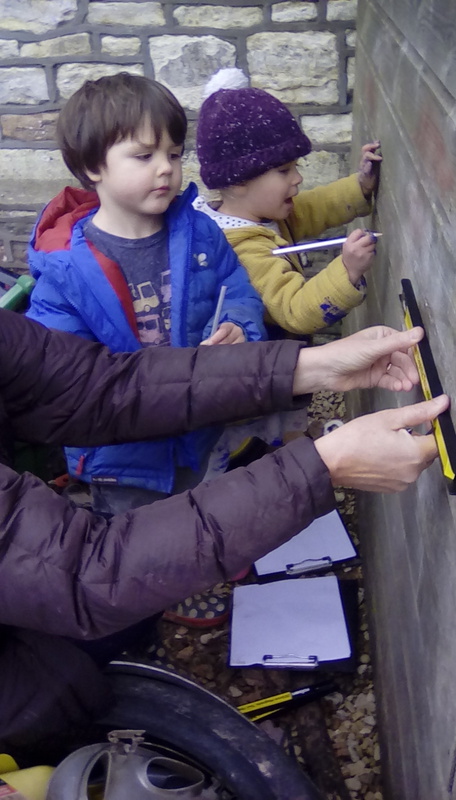 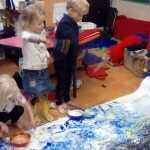 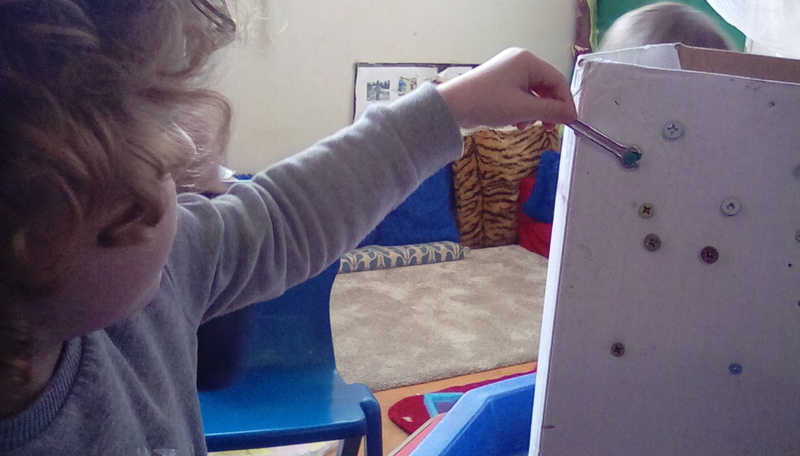 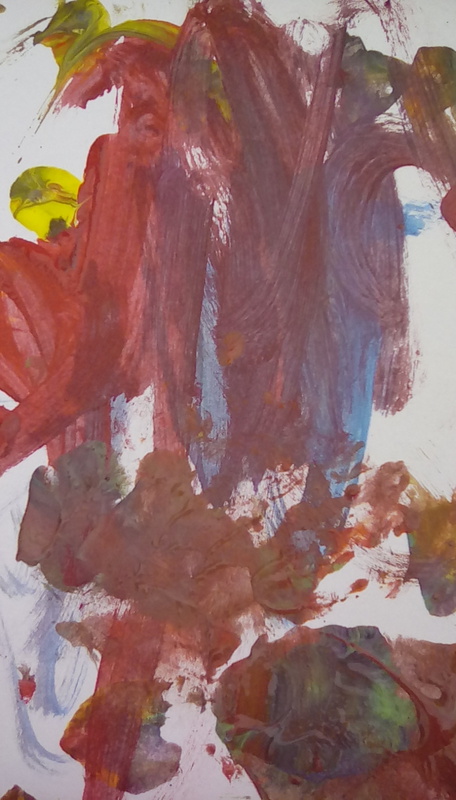 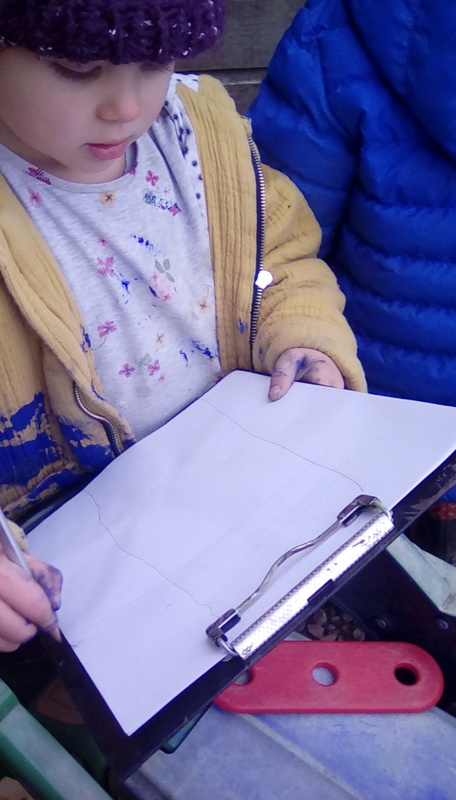 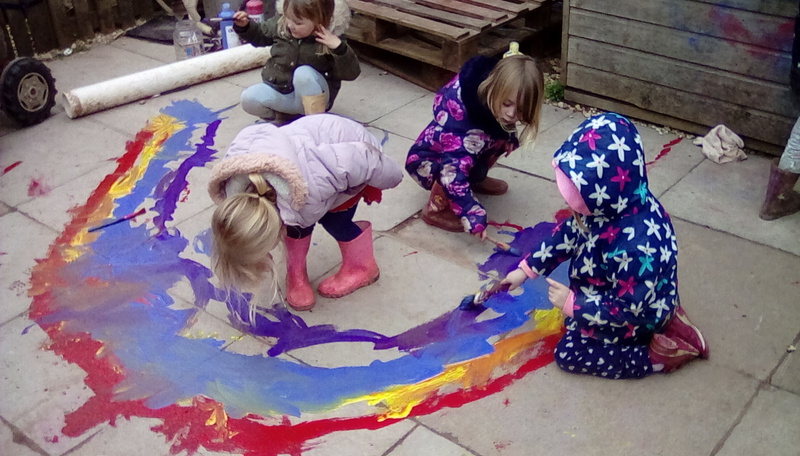 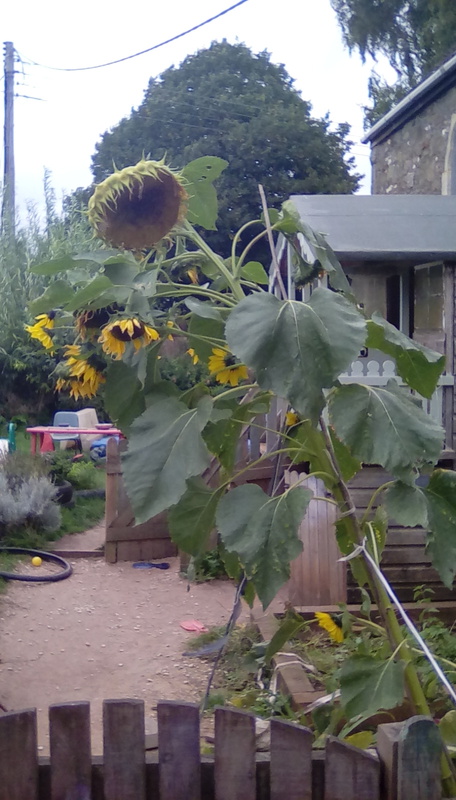 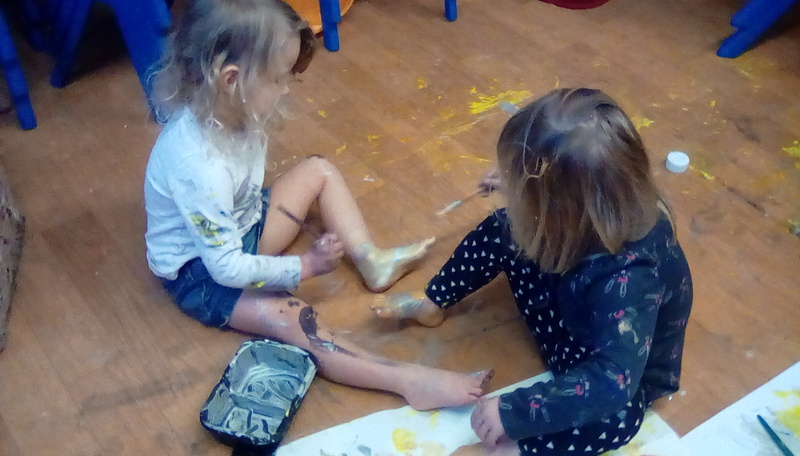 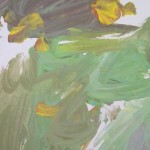 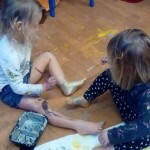 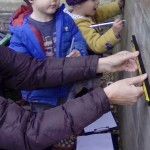 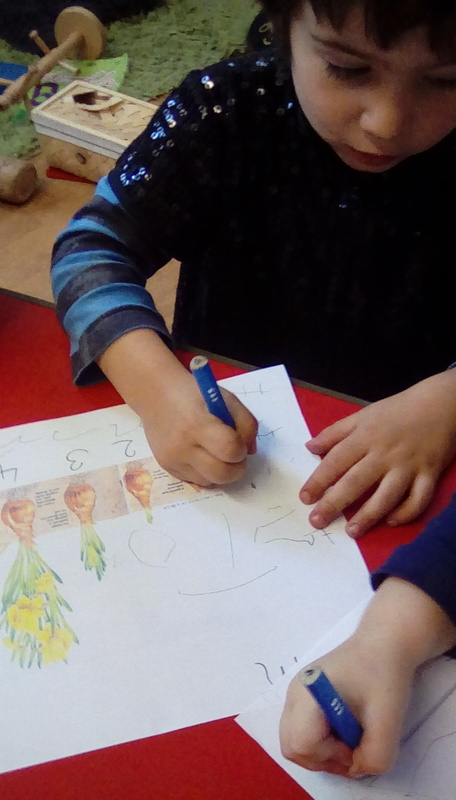 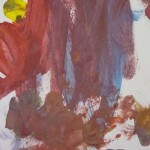 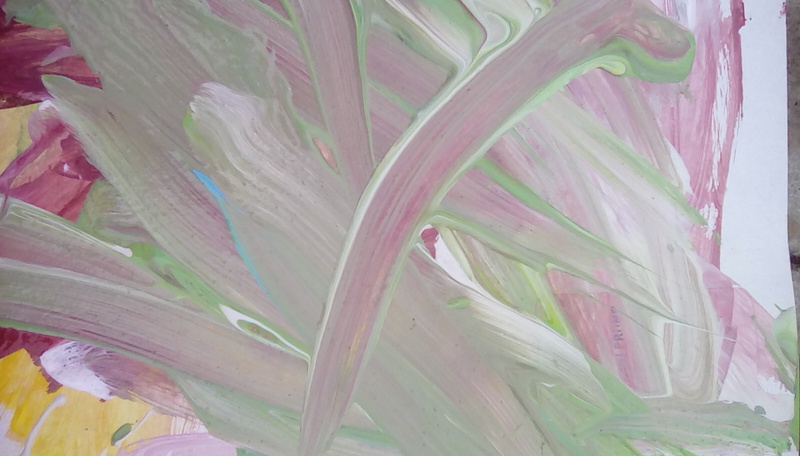 This month the Shooting Stars have been expressing their creativity through painting from nature: looking at our impressive (and now fading) sunflower, linking it with stories of Van Gogh and looking at his version of the flowers, as well as using pastels to create images of the daffodils that would be growing from the bulbs that we planted. 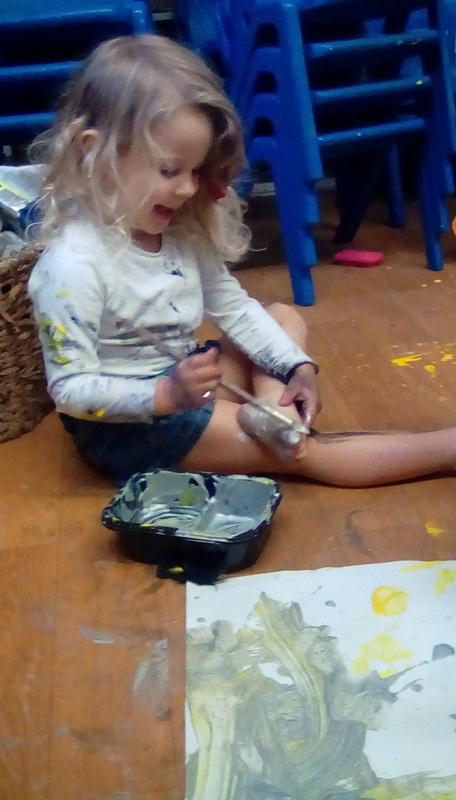 We learnt that Van Gogh was initially ridiculed for painting things that didn’t look as they “should” which should be an important lesson for us in the praise and comments we give to the children as they produce their works of art. 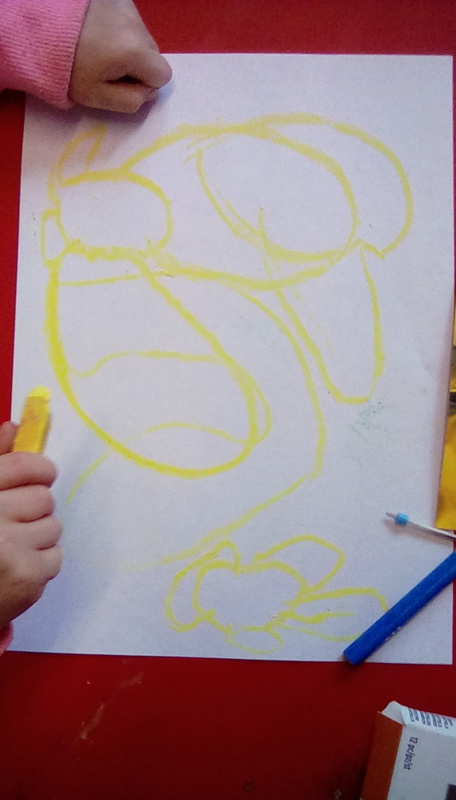 We praise effort and input rather than product (“I love how you’ve mixed those colours together”/ “I can see you’ve worked really hard atthat picture” rather than “What a lovely/ nice/ good picture”). 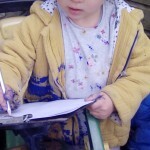 Forget worksheets and make writing real. 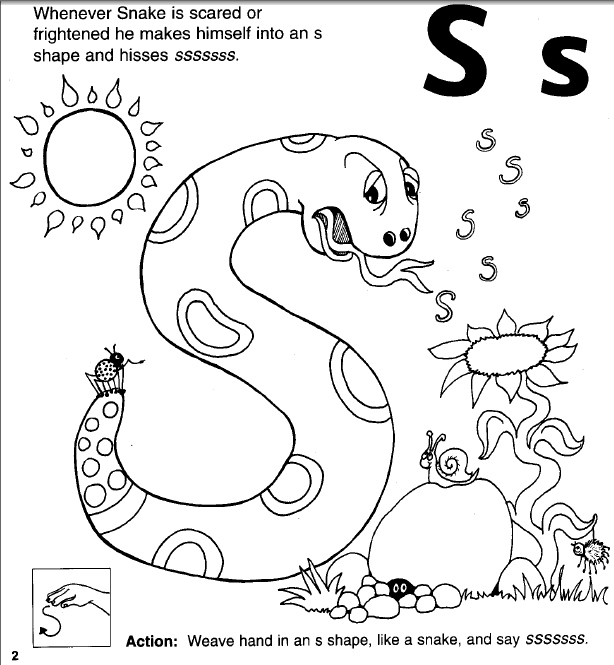 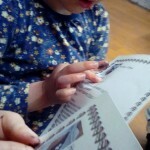 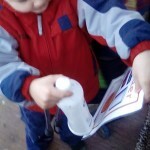 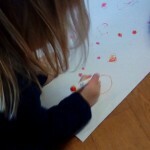 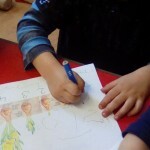 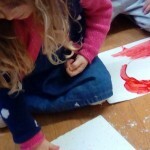 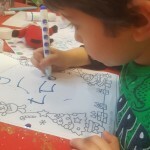 Many of you may already have heard me dismiss the value of worksheets, of tracing over letters. 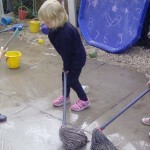 Again, these present the children with a “right” way of doing things (and therefore a “wrong” way). 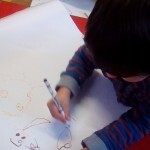 Tracing over letters is just that: tracing. 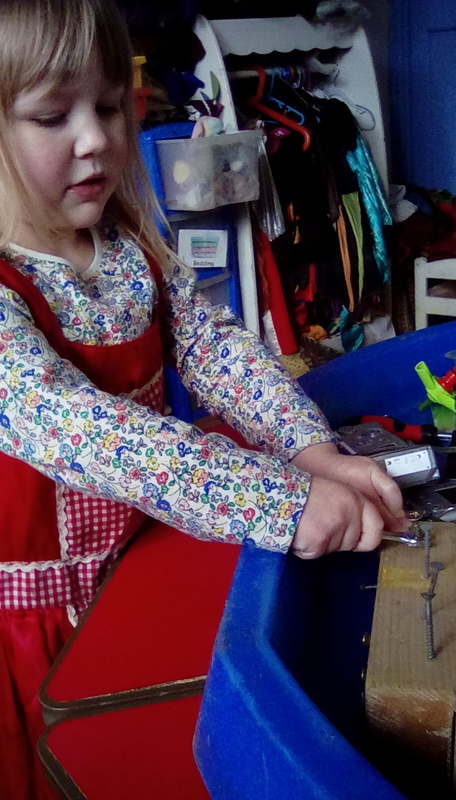 Yes, it might help develop muscles in their wrists but so can threading, tearing, ripping, painting or just using a pen for their own purposes. 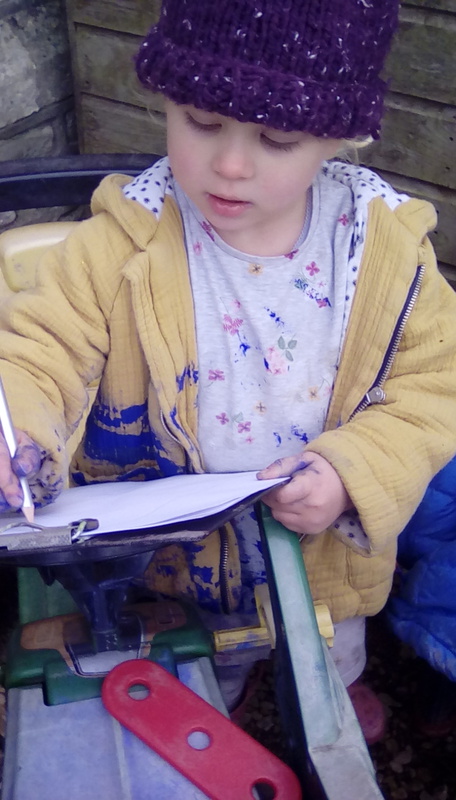 Writing has to be real and meaningful so to me, seeing a group of children self selecting pens and envelopes in the home corner in order to write and post their own letters is much more valuable than following an adult directed worksheet. 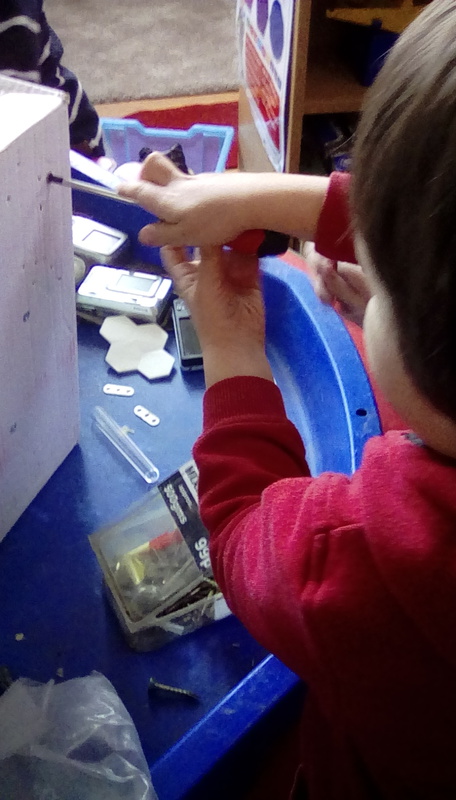 Being problem solvers and creative thinkers is our ultimate goal for our children, as how else will they become the inventors and innovators of the future if they learn that there is just a right or wrong answer and only one way of doing things? 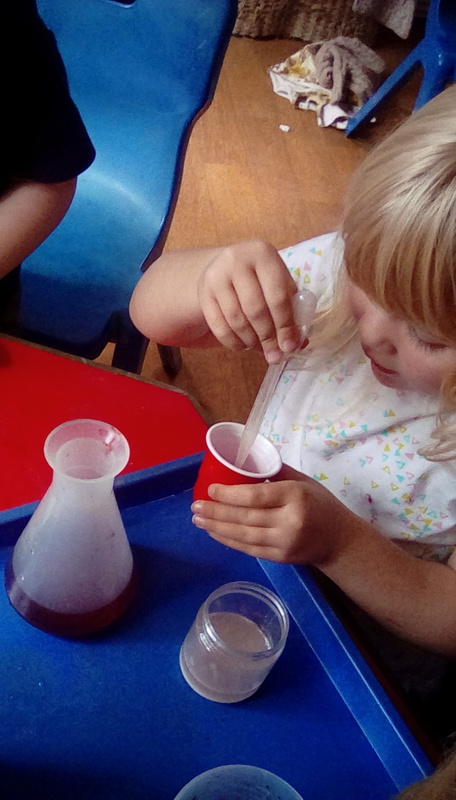 Experiments are a perfect way of encouraging such skills. 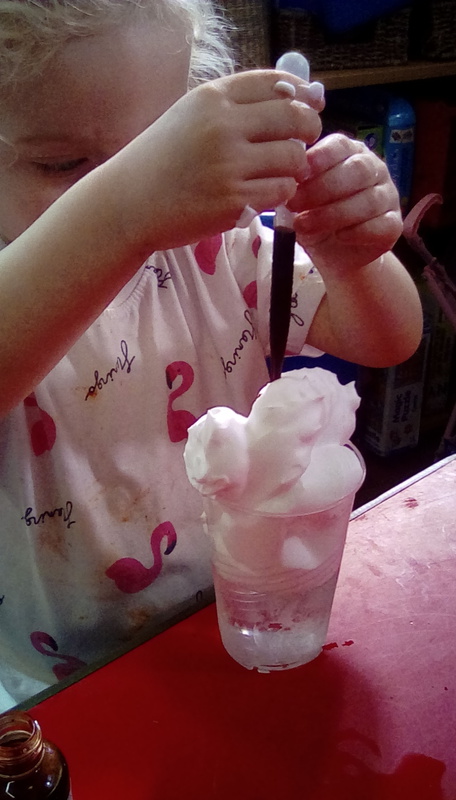 The classic vinegar and bicarbonate of soda is always a firm favourite as the effects of making things explode is visual and interactive. 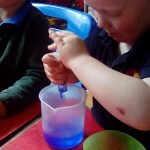 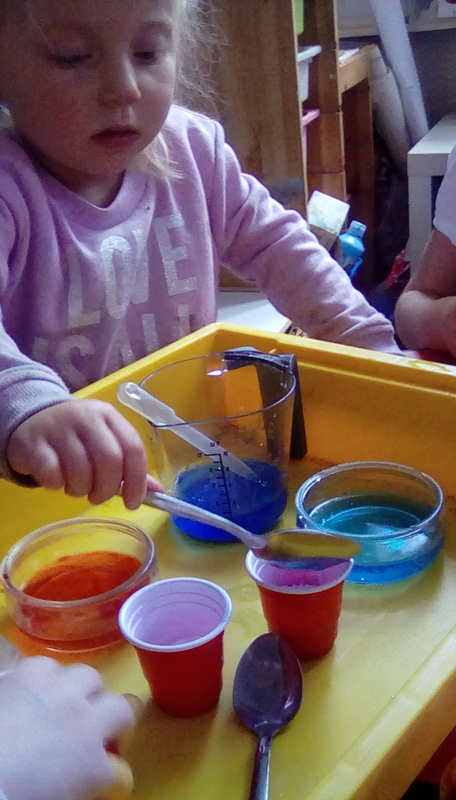 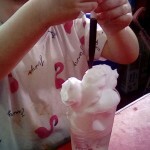 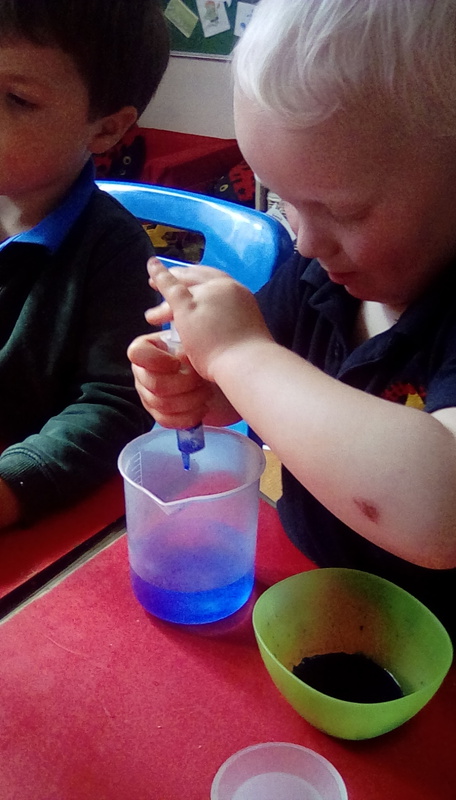 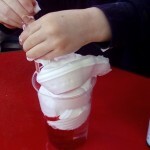 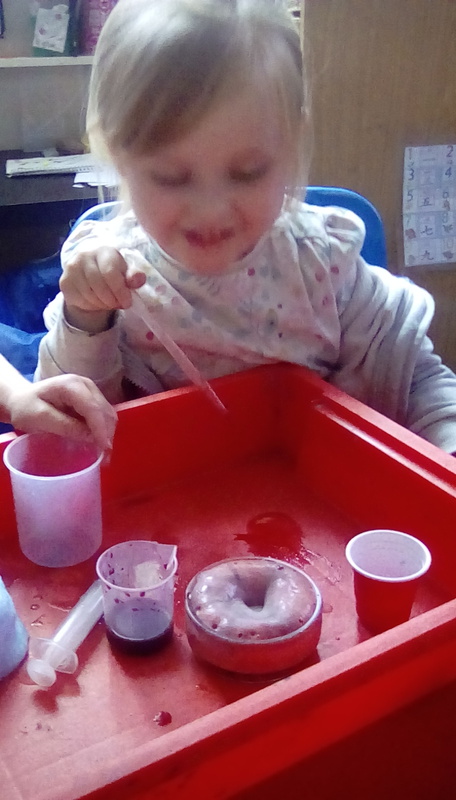 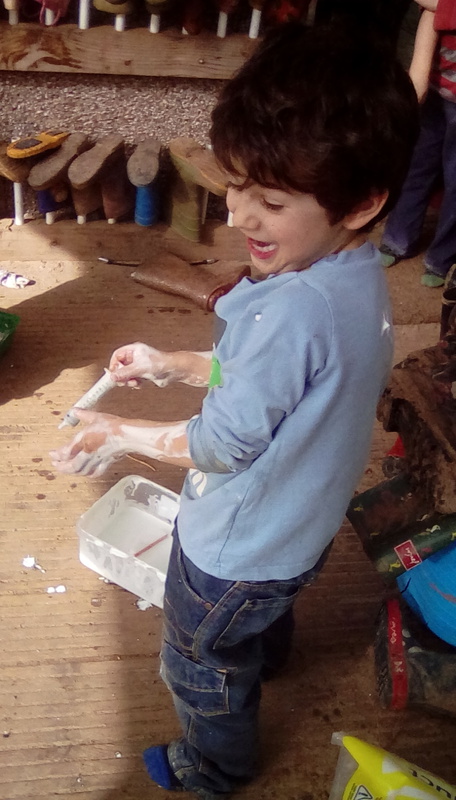 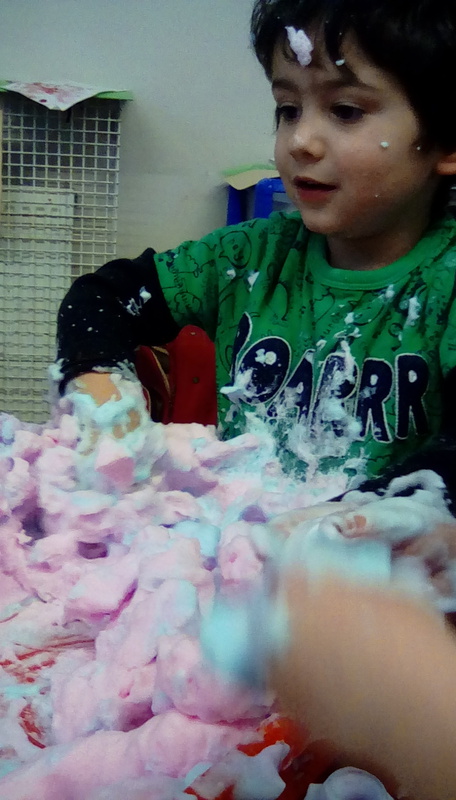 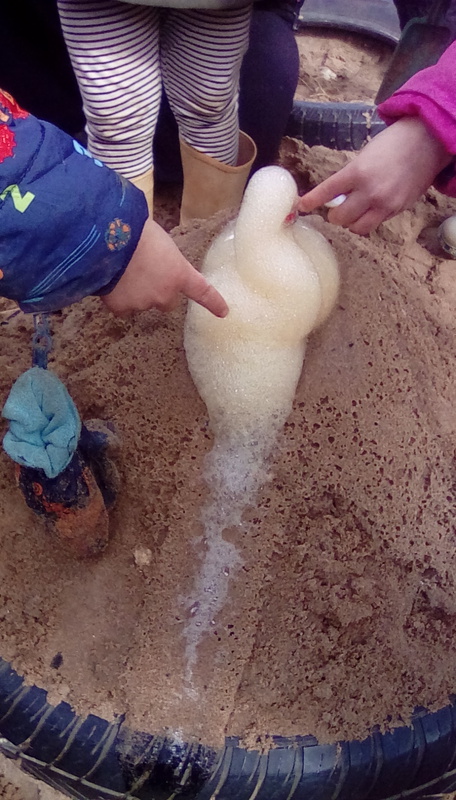 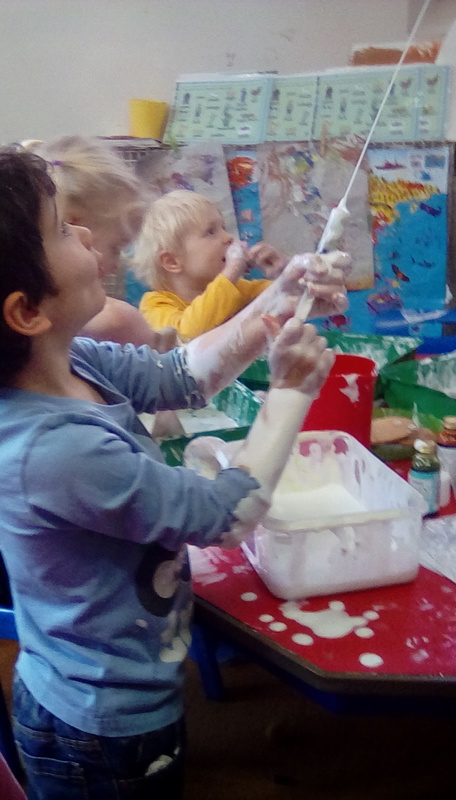 But after following the initial instructions of how to make the experiment “work”, the children then explored their own abilities in making slime, goo or patterns as they mixed different ingredients together. 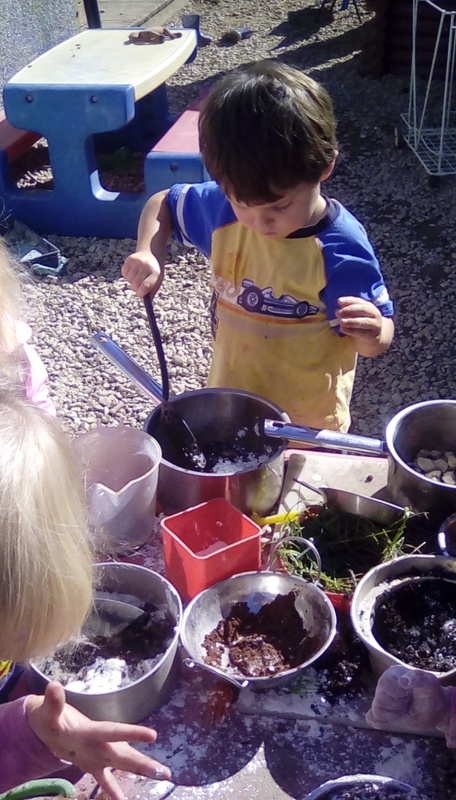 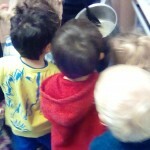 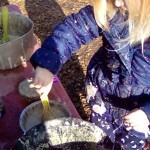 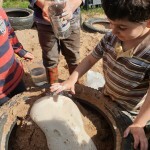 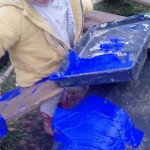 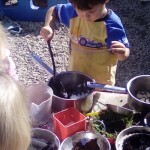 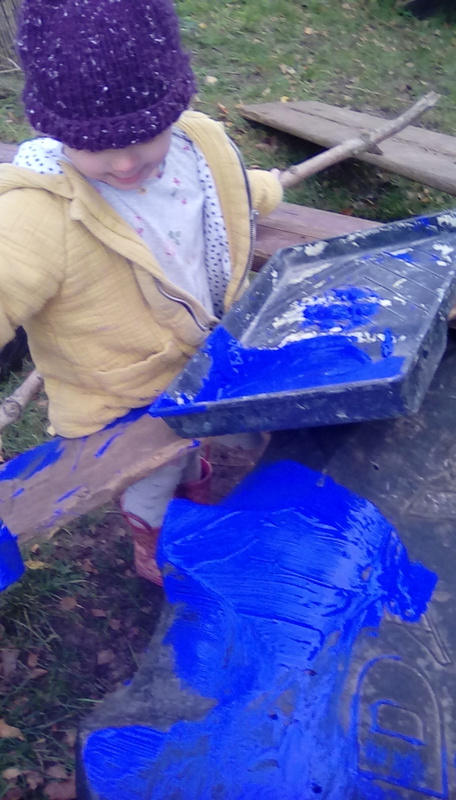 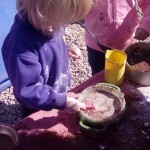 Meanwhile out in the mud kitchen much messy fun was had as they discovered different textures, ways of describing what they were doing and different effects they could produce. 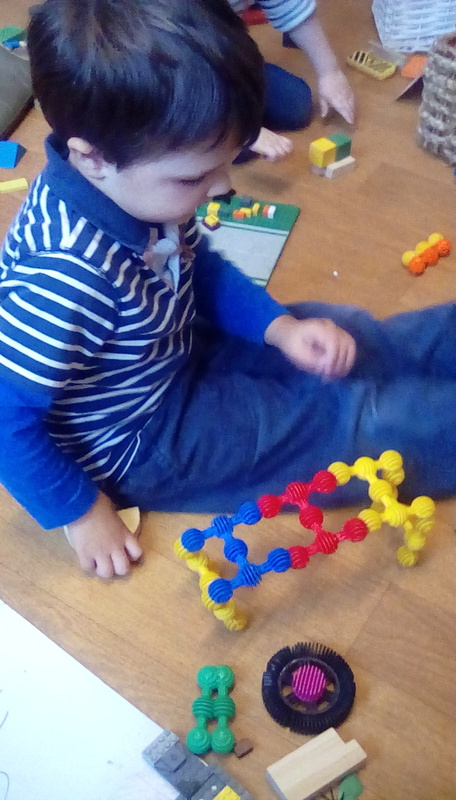 With new discoveries arises opportunities for new language and words; mathematical concepts of measurement and quantity as well as becoming masters of their own creations. 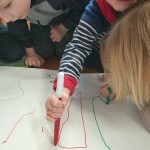 Returning to the topic of “school readiness”, we do take our responsibility seriously to prepare the children the best we can to be ready to read and write. 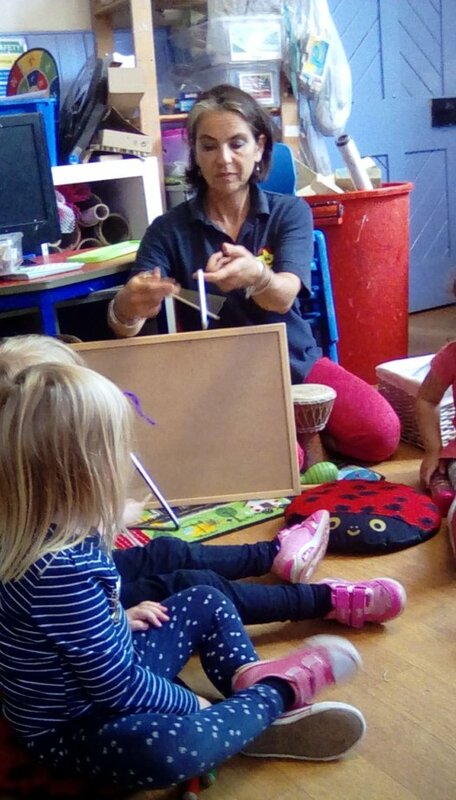 After Christmas as embark on the jolly phonic journey but leading up to that, this term is all about preparing them to be able to listen and tune into sounds. 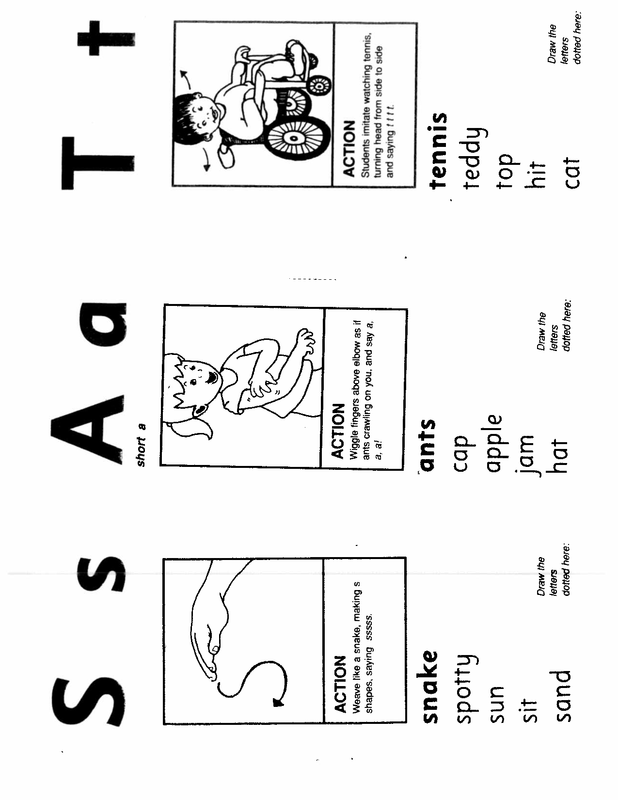 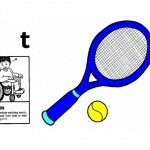 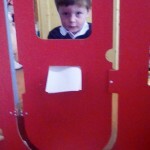 This follows the strategies of ‘Letters and Sounds’. 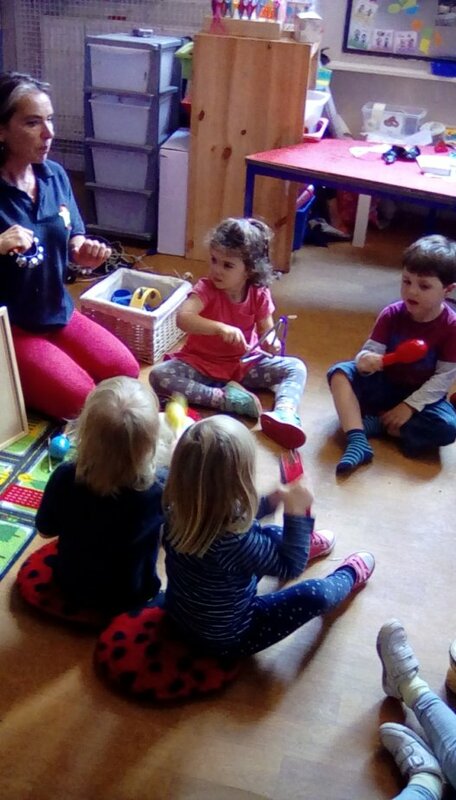 So we have been using instruments to identify and distinguish between the different sounds they make, listening to sounds around us when out in the woods and fields, identifying sound effects and using beat and rhythm in ‘get up and go sessions’.